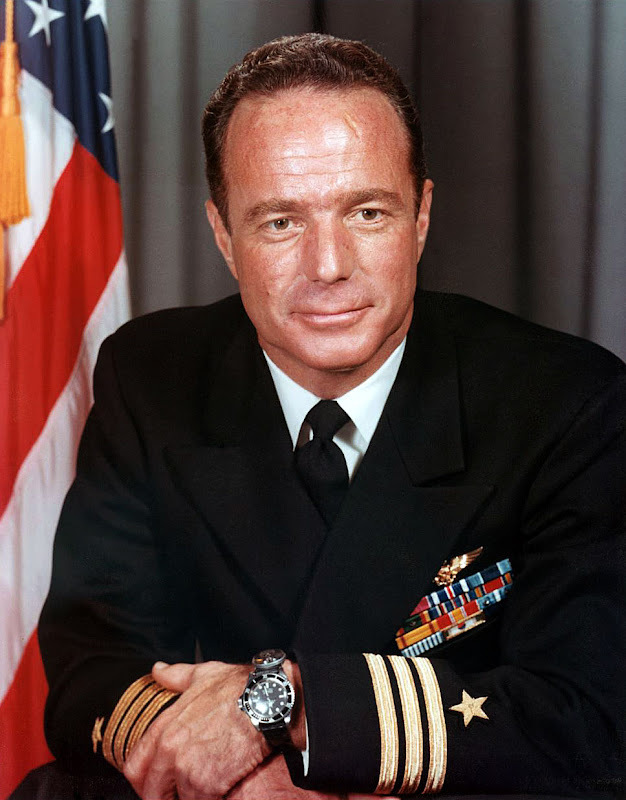 Legendary NASA Astronaut and U.S. Navy SEA-DWELLER, Scott Carpenter passed away today, at age 88, so I thought it would make sense to bring his amazing story of lifetime achievement to the top of Jake's Rolex World. I wrote and published this story back on September 1st, 2008. 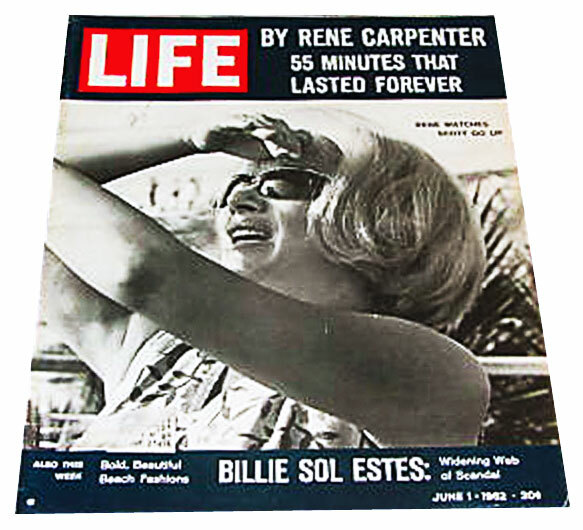 It was one of the first really in-depth stories I completed on Jake's Rolex World, and it included a podcast interview I did with Scott Carpenter. In the future, as time permits, I will update this article. I recently spoke with and completed a podcast interview with former Navy test-pilot, NASA Astronaut & Navy SEALAB Aquanaut, Scott Carpenter. We spoke several times about Rolex watches, his brilliant career and his love for collecting watches. I would like to thank Scott Carpenter and his family for so graciously assisting me with sharing images from their private family scrapbook. 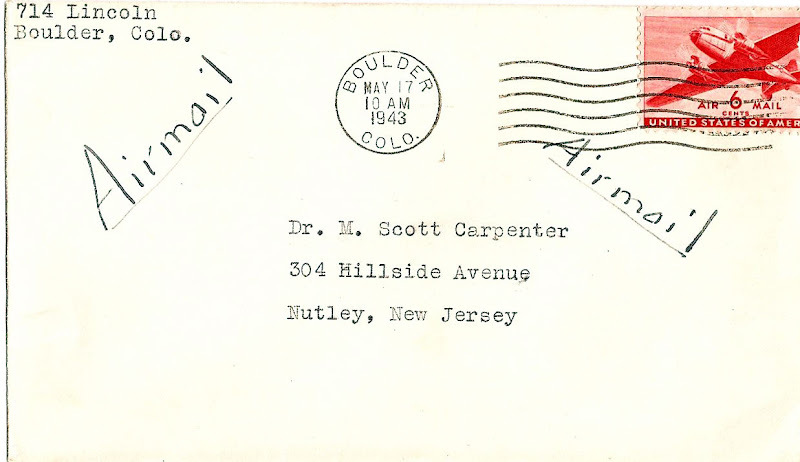 I would particularly like to thank Scott's daughter, Kris Stover for sharing many superb images from her private collection as well as the letter from Scott's childhood (dated May 15, 1943), which is quoted in her father's autobiography (on page 80) that she co-wrote with her father named For Spacious Skies. I would also like to thank Scott's sons Nick and Zak for providing me with photos of Scott's Rolex Sea Dweller. I have spent a great deal of time interacting with Scott and his family in order to write this article with the accompanying Podcast and they made me feel like a welcome member of their family. To listen to the amazing Podcast interview in another window, click here. Subscribing to Jake's Rolex Watch Blog Podcast in iTunes is free for everybody to enjoy, and all my podcasts and articles are commercial free, but please understand that bringing you these super-detailed podcasts and articles is extremely time consuming, so please help support the future of Jake's Rolex Watch Blog and Podcast by making a donation via Paypal. You can do so by clicking on the Donate button located approximately ten inches down from the top on the right column of this page. 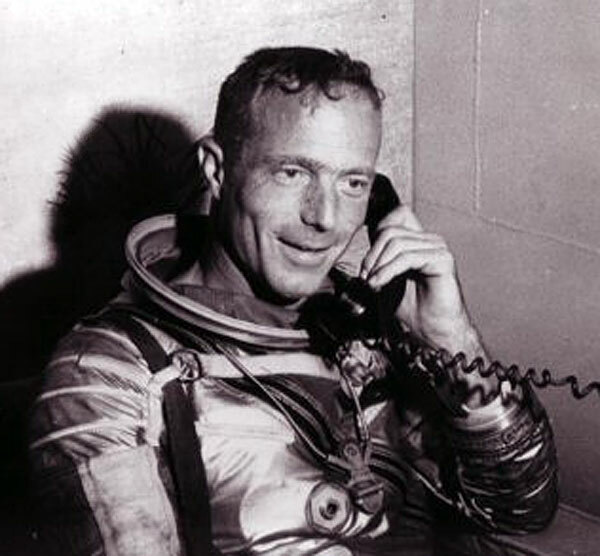 NASA brilliantly sums up Scott's career by saying "Scott Carpenter, a dynamic pioneer of modern exploration, has the unique distinction of being the first human ever to penetrate both inner and outer space, thereby acquiring the dual title of Astronaut/Aquanaut." 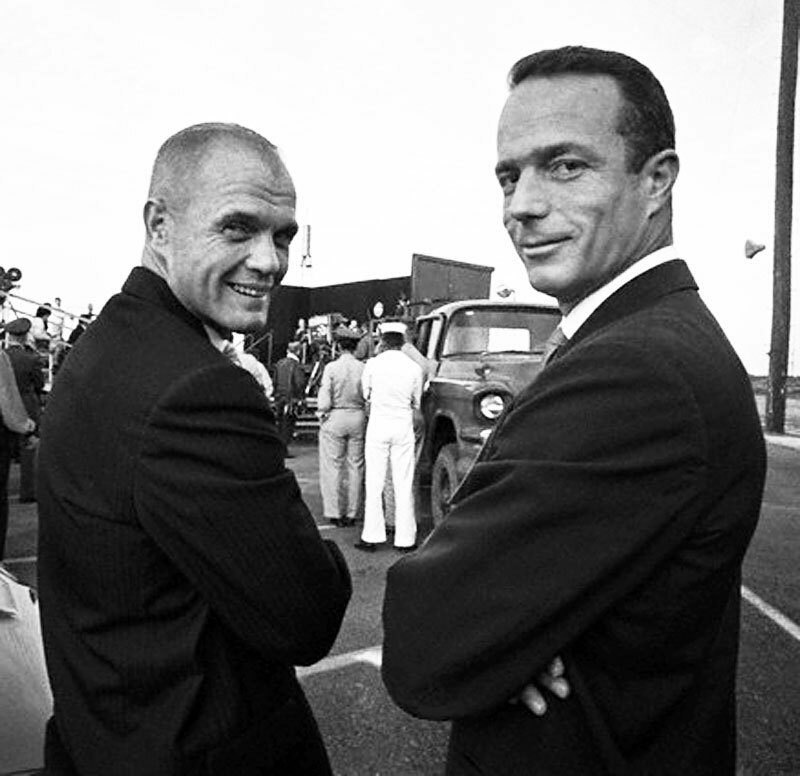 Scott Carpenter's character is also portrayed in the 4 time Academy Award winning, major motion picture, The Right Stuff. Scott Carpetner is pictured below in the late 1960s with my grandfather, Jake Ehrlich Sr, and the Mayor of San Francisco at the time, Joe Alioto. Scott is wearing his Navy uniform, and my grandfather Jake is standing on the far left behind his best friend, Louis Lurie. Mayor Joseph Alioto is pictured standing on the right side of my grandfather, and the gentleman sitting in the chair is Henry Lewin, who was the Director of Hilton Hotels. The tall man pictured to the left (behind) Scott is an Attorney who was a protege of my grandfather, named Fred Furth. I am not certain, but I think the man pictured on the far right is a San Francisco judge. The photo was taken in Louis Lurie's San Francisco office. Scott Carpenter owns a Rolex Submariner and a Sea Dweller and he said, "The Rolex Submariner & Sea Dweller have a cachet that is unmatched by any other watch. 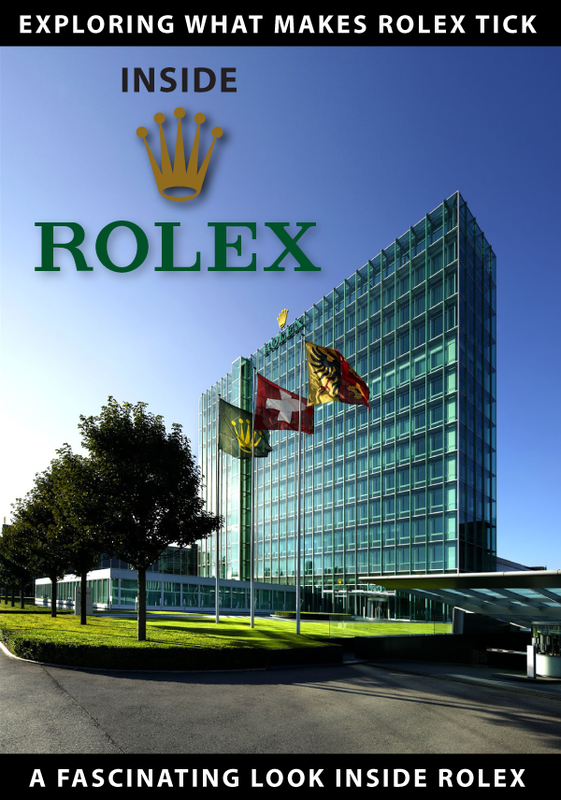 The Rolex brand is the most highly respected in my book." 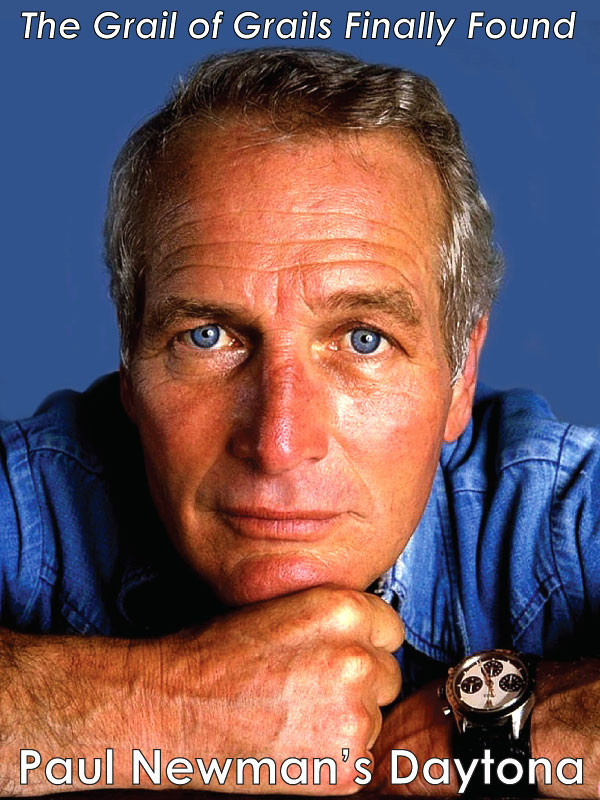 Scott also said "The Rolex Submariner was the preferred diving watch for Navy Sealab Divers." To best understand Scott Carpenter's career and The Right Stuff we have to go back to the late 1950s during the Eisenhower administration. NASA was formed under the Eisenhower administration and the Project Mercury Astronauts started flying up into the heavens under the Kennedy Presidency. 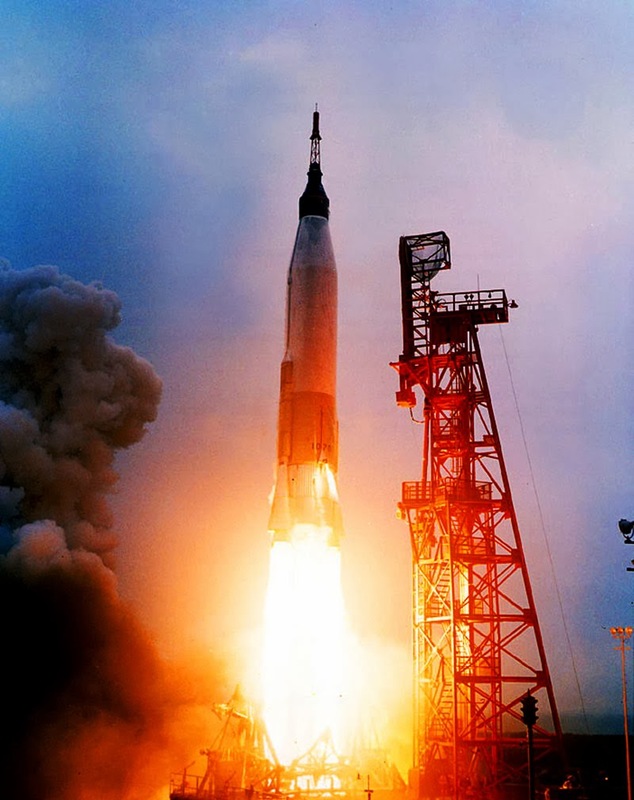 On January 31, 1958, during the Eisenhower administration, the U.S. launched its first satellite named Explorer 1 and the space race went into full swing. 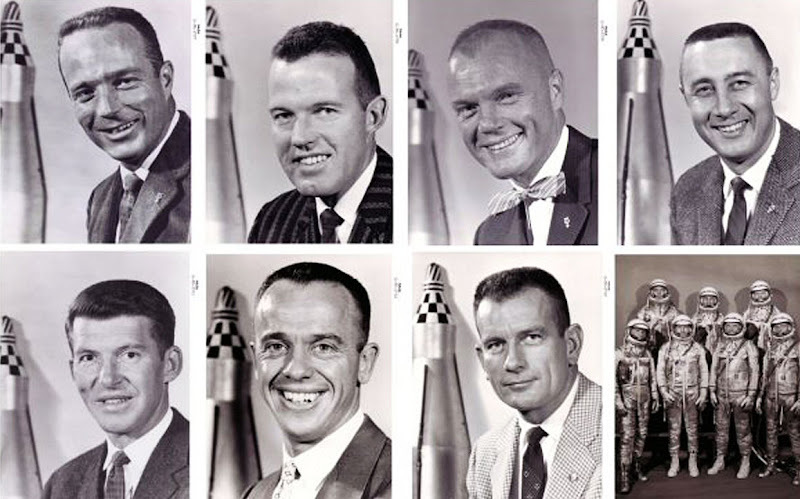 On April 9, 1959 seven men were chosen to become Project Mercury astronauts. 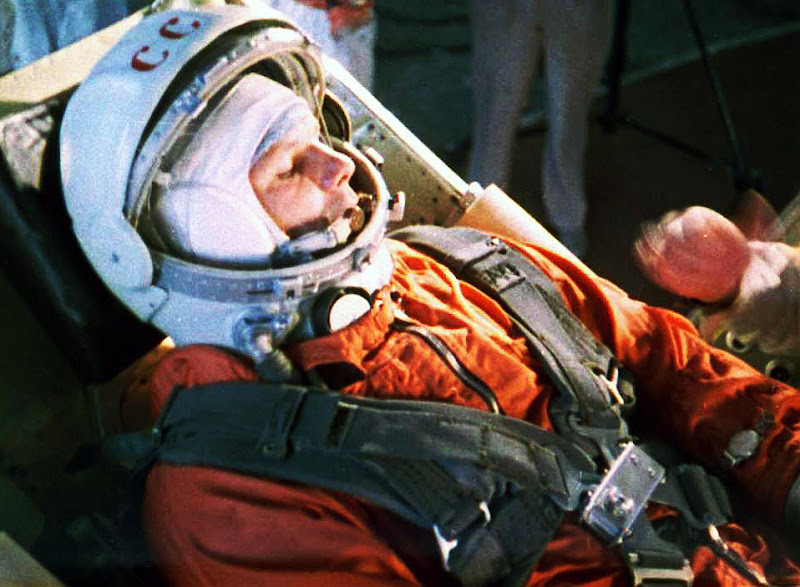 The primary goal of the Project Mercury program was very specific: to investigate man's ability to function in space while recovering astronaut and spacecraft safely. President Kennedy followed in Eisenhower's footsteps by creating the goal of putting an American on the Moon. 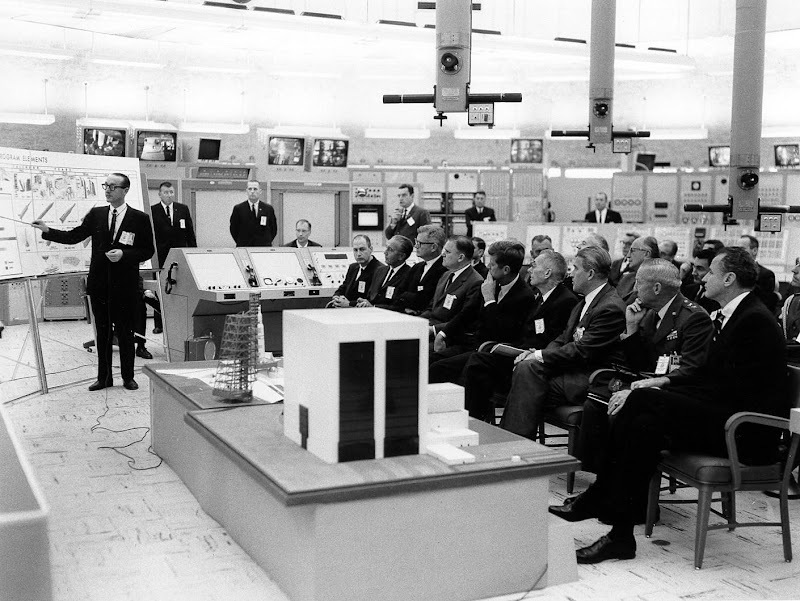 President Kennedy and Vice President Johnson made putting a man on the moon a top priority on the American agenda, and ended up spending a great deal of time at NASA. 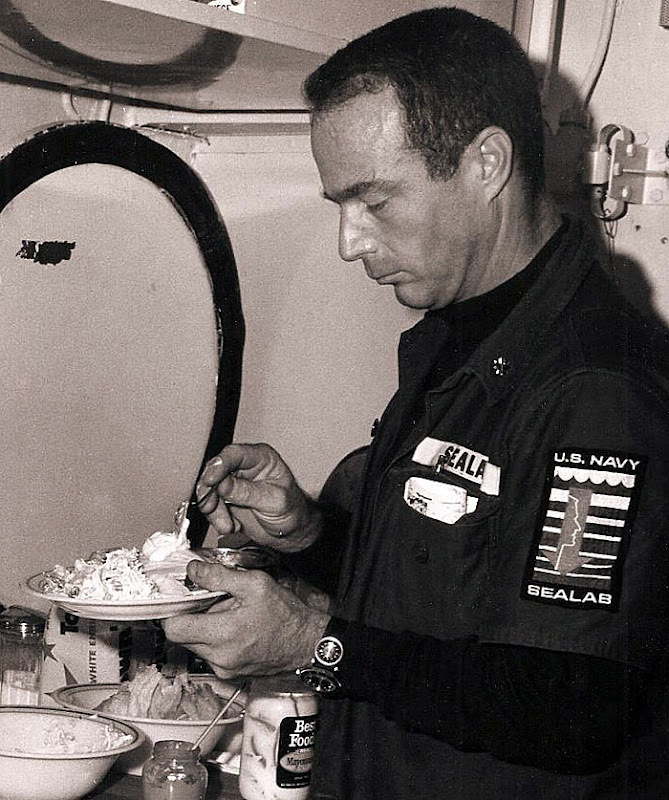 Prior to his career at NASA, Scott Carpenter was a NAVY test pilot, and he would go on to to become a NAVY aquanaut. He was chosen as one of the original seven NASA astronauts for project Mercury in 1959. NASA wanted the best the U.S. had to offer so they only chose pilots who had at least 1500 hours experience piloting jet airplanes. Of course it helped that Scott had a degree in Aeronautical Engineering. Qualifying for the Project Mercury team was not easy. The testing process was extremely rigorous, and the U.S. was looking for the best candidates that possessed the perfect balance of brains and brawn. 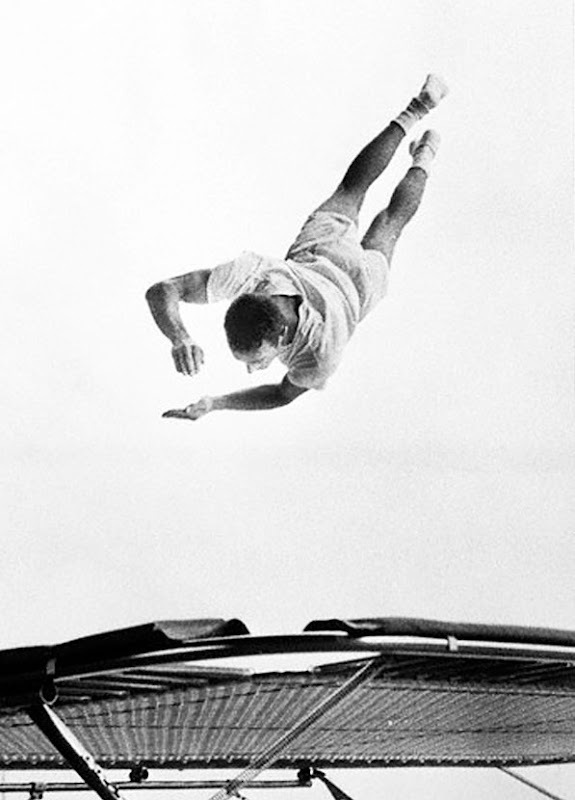 Scott was blessed with both brains and brawn and is pictured above flying through the air on a trampoline–soon he would be flying through the sky around the earth. On October 4, 1957, the Soviet space program launched the worlds first man-made satellite know as Sputnik 1. The U.S. congress was shocked and thought the Soviet technological prowess was a potential threat to the security of the United States. President Eisenhower acted swiftly and developed two new federal agencies, NASA (National Aeronautics and Space Administration) & DARPA (Defense Advanced Research Projects Agency). Eisenhower signed the National Aeronautics and Space Act, on July 29, 1958 which formally established NASA. Ironically, Wernher von Braun, who was a Nazi rocket scientist during World War II, surrendered to the American's and ended up contributing significantly to the Space Race by becoming a naturalized American citizen and designing the rocket technology that put Americans in space, and ultimately on the Moon. 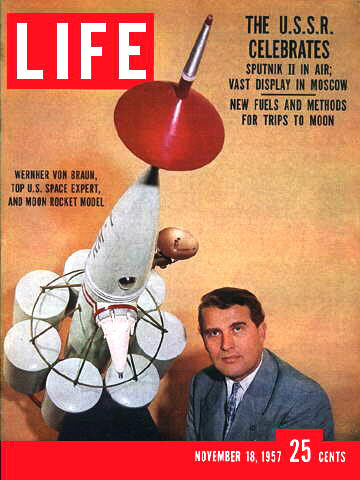 German rocket scientist, Wernher von Braun is pictured above on the cover of Life Magazine. 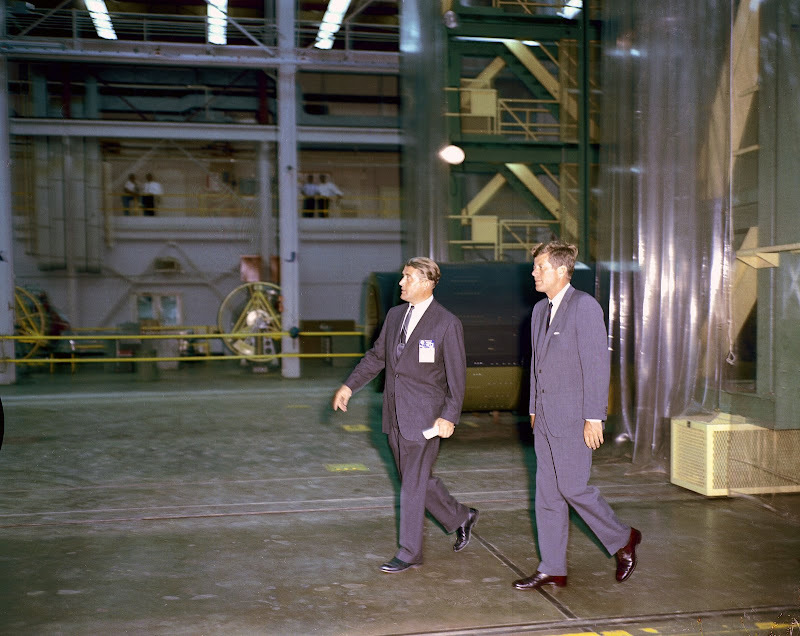 Wernher von Braun is pictured below taking President Kennedy on a tour one of the laboratories at the Marshall Space Flight Center on September 11, 1962. 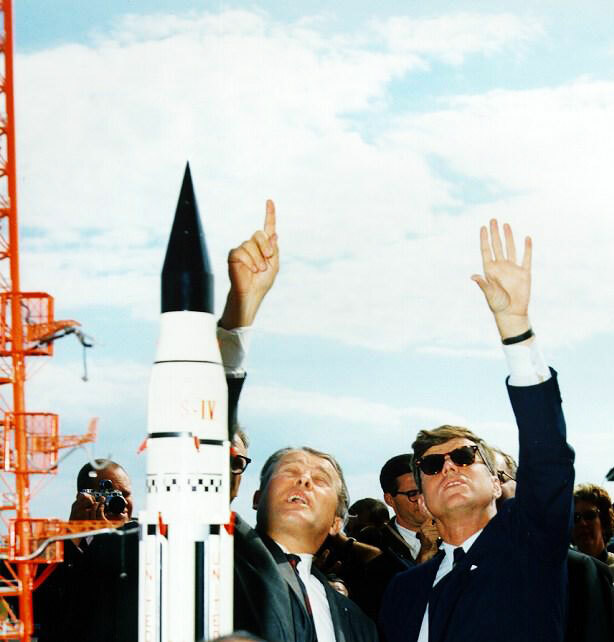 Wernher von Braun is pictured below with President Kennedy at Cape Canaveral on May 19, 1963. 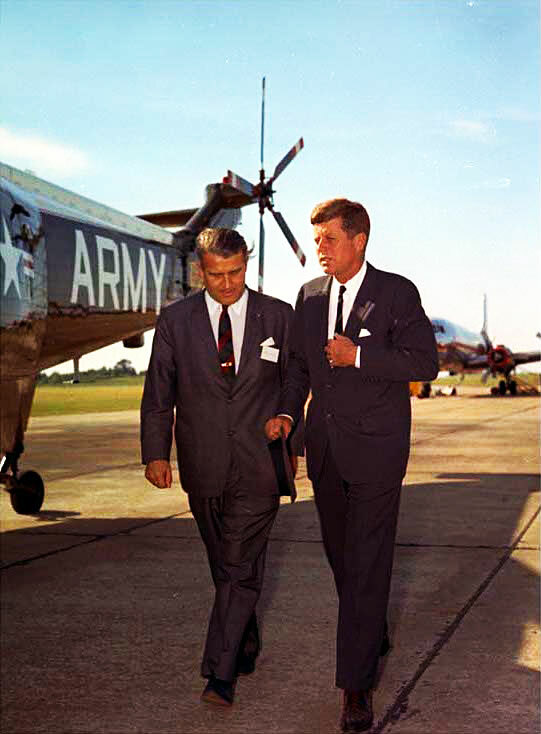 Wernher von Braun (pictured below) gave Kennedy a tour and briefed Kennedy on the progress he was making with the NASA rockets. 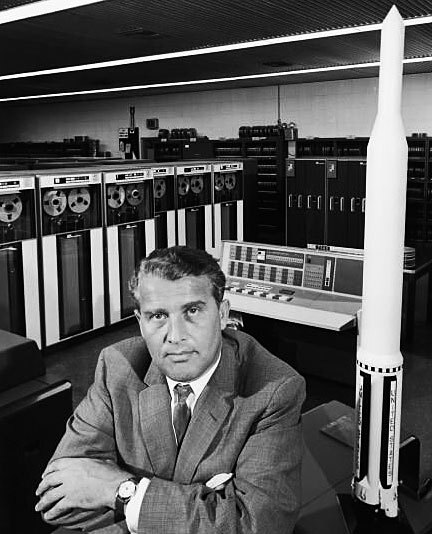 Werner von Braun was a strong proponent of space exploration and also came up with the concept of building a space station, that was later portrayed in the movie 2001, A Space Odyssey. Wernher von Braun wore a Rolex Datejust on a leather strap as pictured below. In another twist of fate, Wernher von Braun grew up in a village in Bavaria close to where the founder of Rolex, Hans Wilsdorf grew up. Dr. von Braun was the principal designer of the German V-2 rocket weapon as well as the Saturn V Moon rocket that put NASA astronauts on the Moon. 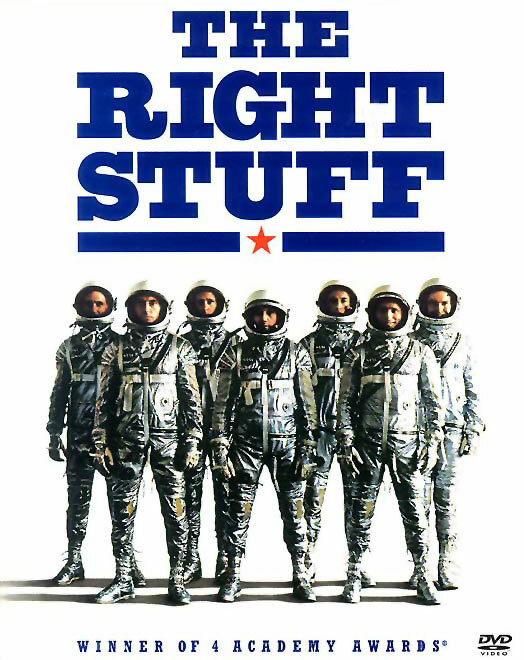 The Right Stuff is the title of a book that was made into a movie with the same title which was written by Tom Wolfe. 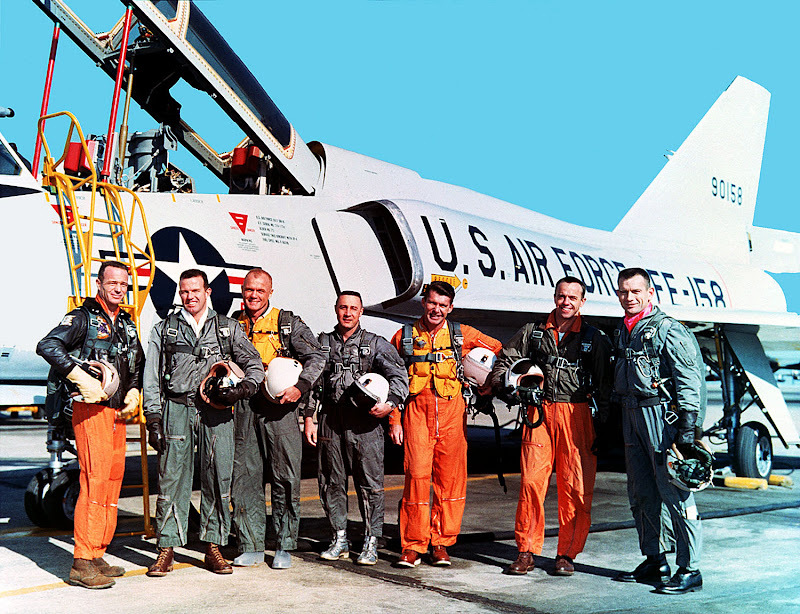 There are 12 main characters in The Right Stuff story: Chuck Yeager, Werner von Braun, The Original 7 Mercury Astronauts, President Eisenhower, President Kennedy and President Johnson. 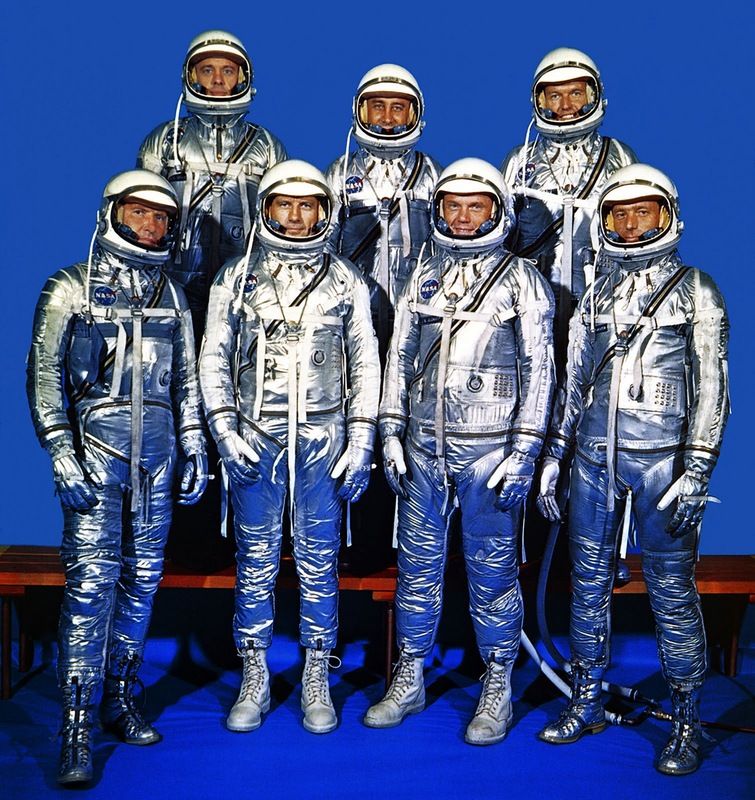 Of the 12 main male characters in The Right Stuff, at least 8 wore Rolex watches: Chuck Yeager, Scott Carpenter, Wally Schirra, John Glenn, Alan Shepard, President Eisenhower, Wernher von Braun and President Johnson. Dr. Wernher von Braun is pictured above at the Kennedy Space Center attending the Saturn 500F, rollout from the Vehicle Assembly Building (VAB) on May 26, 1966. 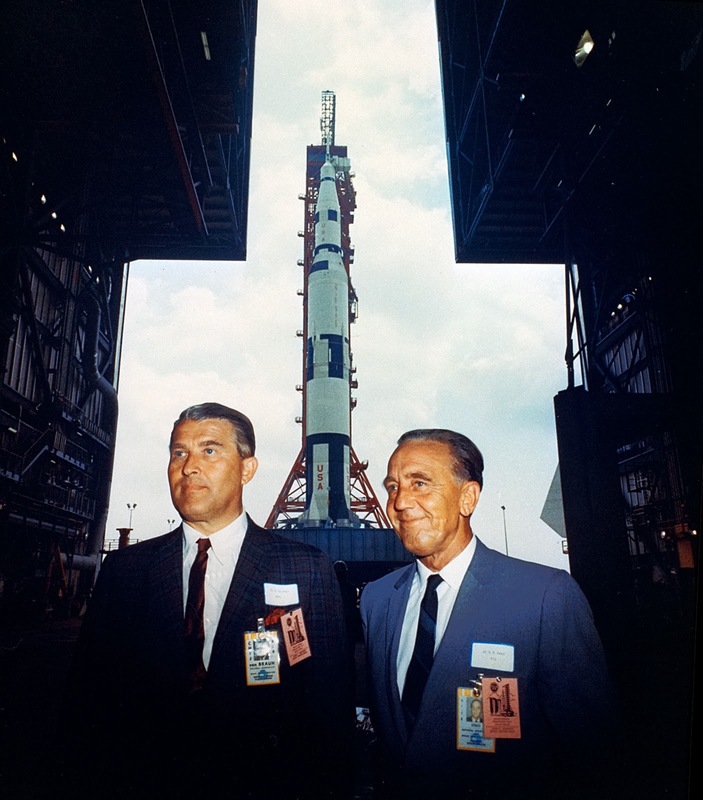 Dr. Kurt Debus is pictured next to von Braun and was the Director of the Kennedy Space Center. 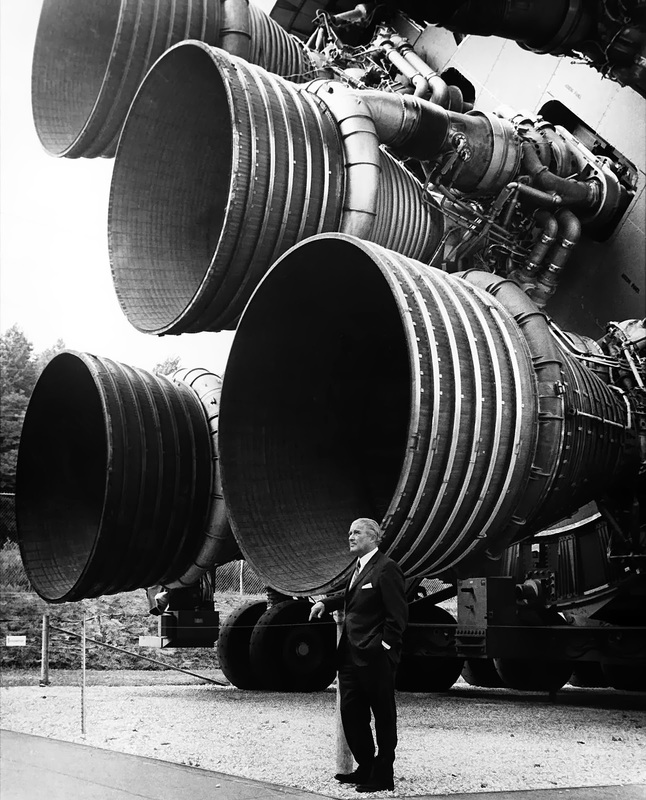 Wernher von Braun is pictured below standing in front of Saturn V rocket thrusters he designed that would ultimately put men on the moon, including Mercury Astronaut, Alan Shepard on Apollo 14. The Saturn V rocket possessed 10 percent of the power of an atomic bomb. The Mercury Astronauts, known as The Original 7 are pictured below on April 9, 1959. 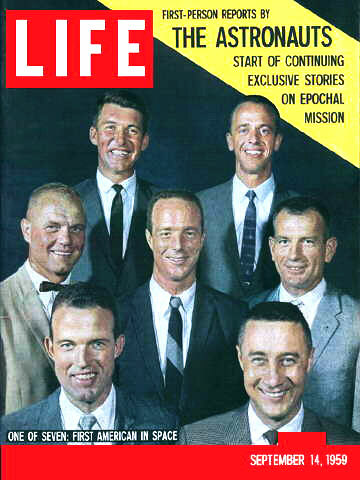 From left to right: Scott Carpenter, Gordo Cooper, John Glenn, Gus Grissom, Wally Schirra, Alan Shepard and Deke Slayton. 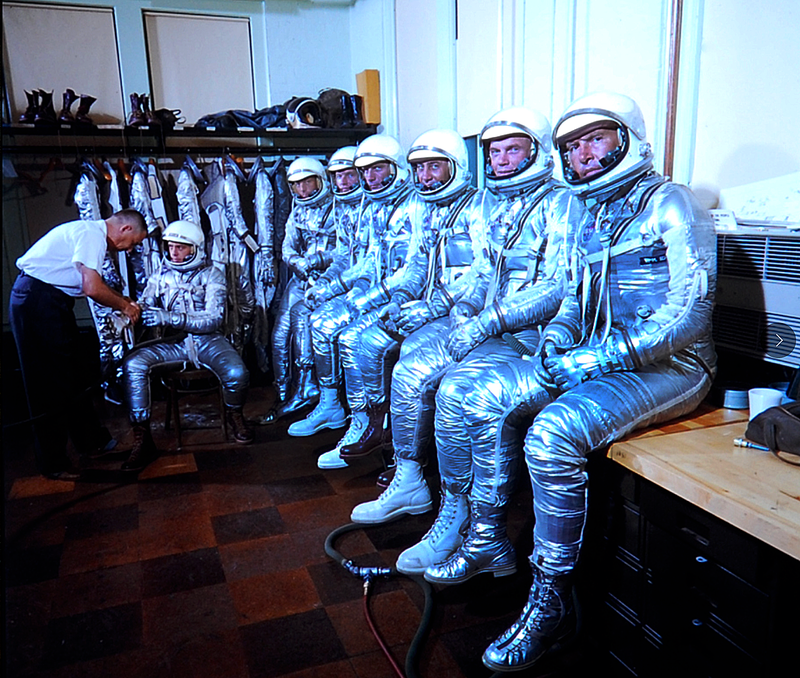 The Original 7 Mercury Astronauts are pictured below in June of 1959 as they are being briefed by Wernher von Braun. 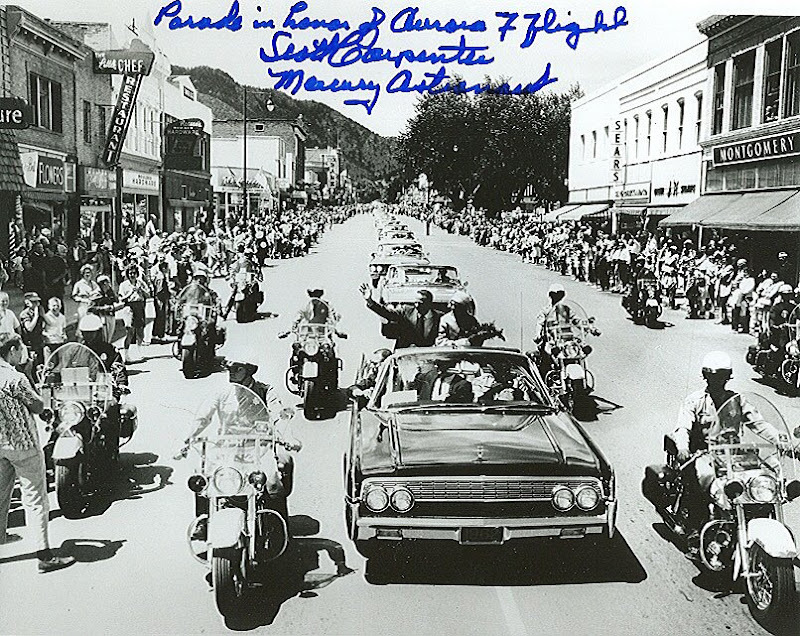 Scott Carpenter is pictured on the far left and John Glenn is on the far right. 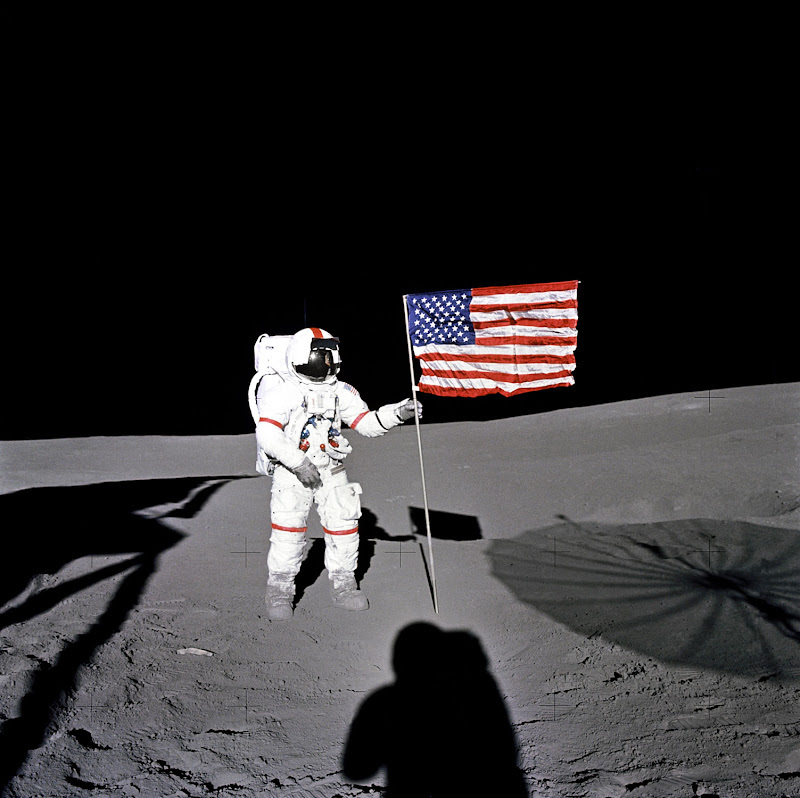 The first American Astronauts were chosen and were the heroes of their generation. 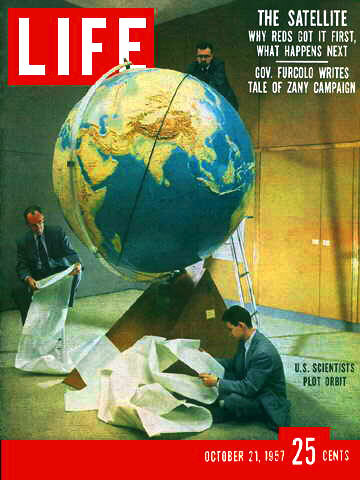 The Mercury Astronaut team was introduced to the public in a Life Magazine article on September 14, 1959. 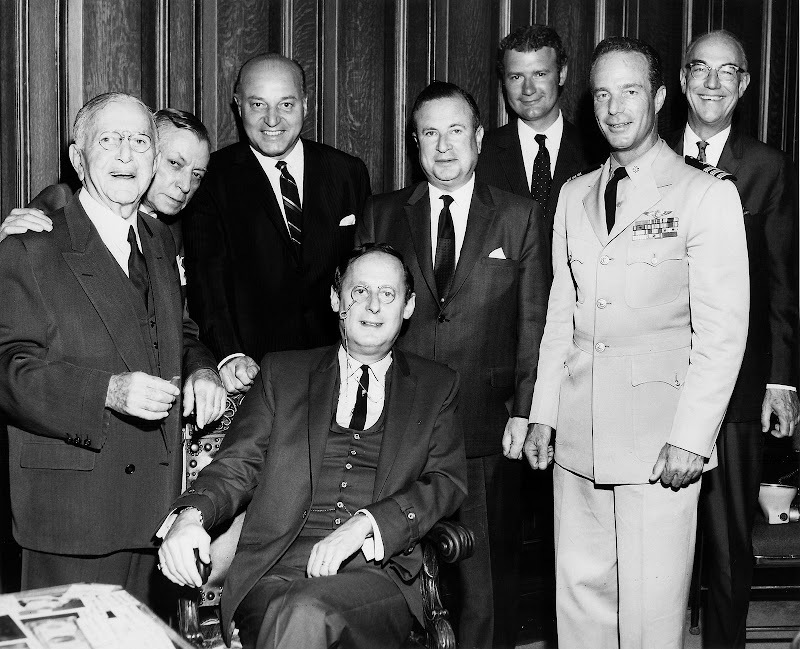 Scott Carpenter is pictured in the center. The photo below is from the NASA archives and its inscription reads "The Original Seven. 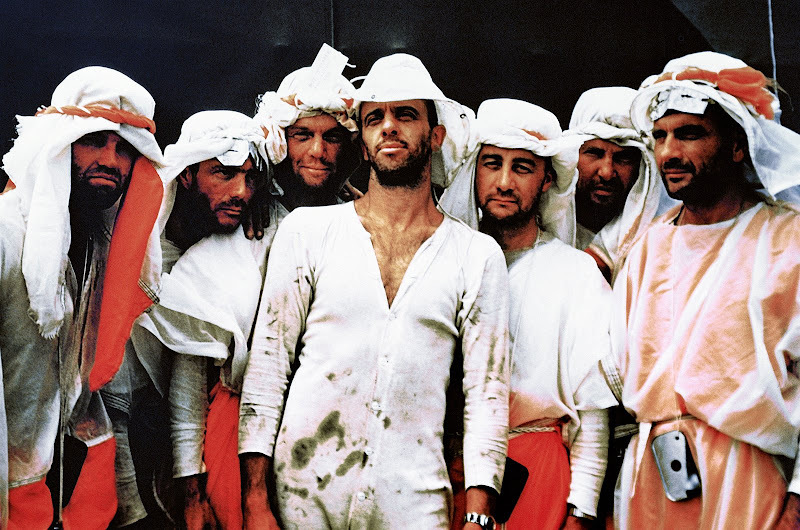 In this 1960 photograph, the seven original Mercury astronauts participate in U.S. Air Force survival training exercises at Stead Air Force Base in Nevada. 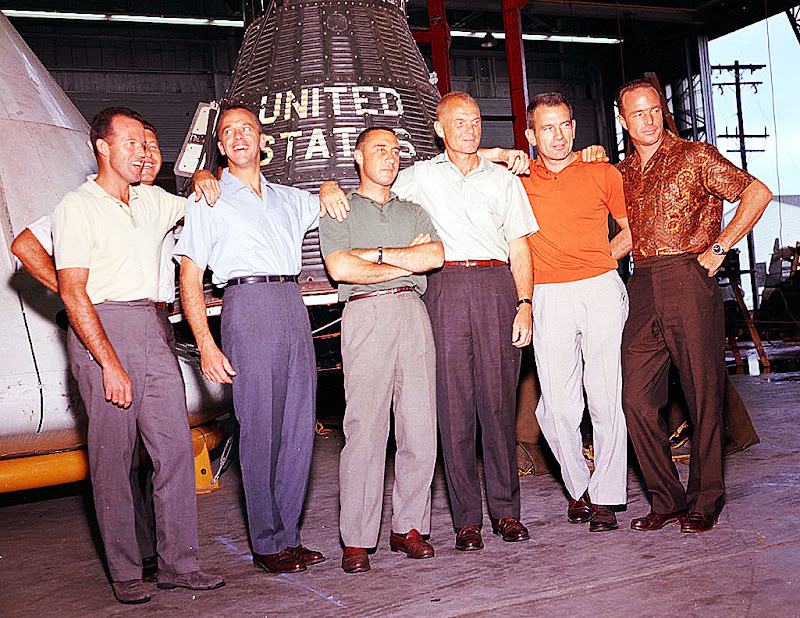 Pictured from left to right are: Gordon Cooper, Scott Carpenter, John Glenn, Alan Shepard, Virgil Grisson, Walter Schirra and Donald Slayton." "Portions of their clothing have been fashioned from parachute material, and all have grown beards from their time in the wilderness. The purpose of this training was to prepare astronauts in the event of an emergency of faulty landing in a remote area." The members of the Mercury Space Project Team are pictured above and Scott Carpenter is pictured on the bottom right. On April 12, 1961 the Soviet Union successfully launched from Star City Russia, cosmonaut Yuri Gagarin as the first human flown into space. Yuri orbited the earth once before returning to earth. 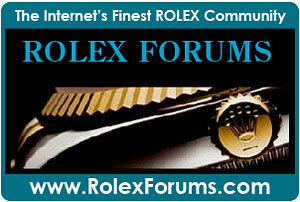 Tip: As with all images on Jake's Rolex Watch Blog, click on the image below for detail. 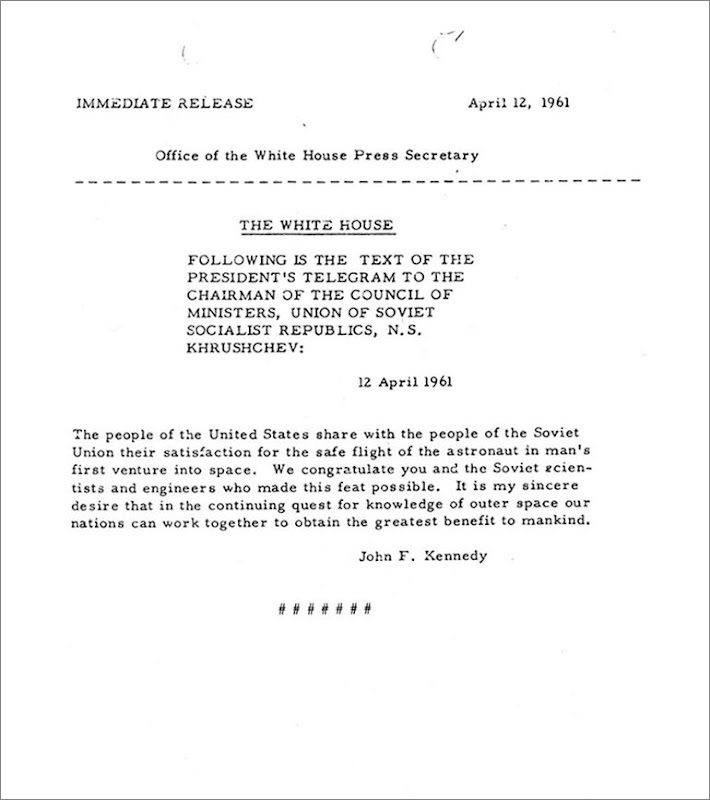 In another profound twist of fate, the Bay of Pigs fiasco began only five days after this telegram was sent to the Soviet leader. The Bay of Pigs Invasion lasted from April 17-19, 1961. Less than a month after the Soviet's launched their first cosmonaut into space, the American's followed by launching astronaut, Alan Shepard into space. Cosmonaut is French for Astronaut. 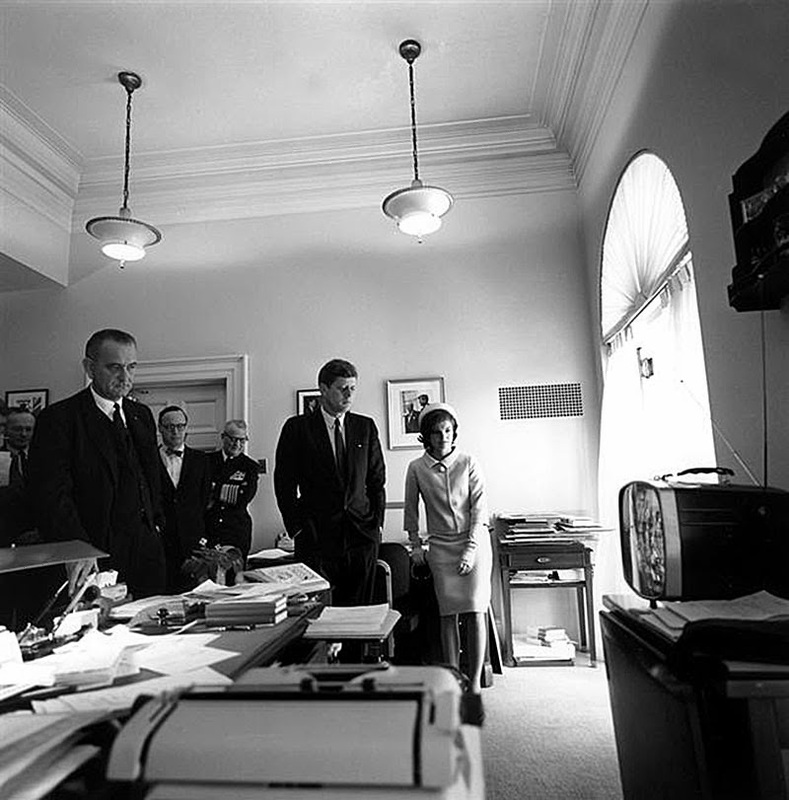 President Kennedy, with his wife Jackie, and Vice President Johnson are pictured below as they watch the first American astronaut, Alan Shepard as he takes off on May 5, 1961. 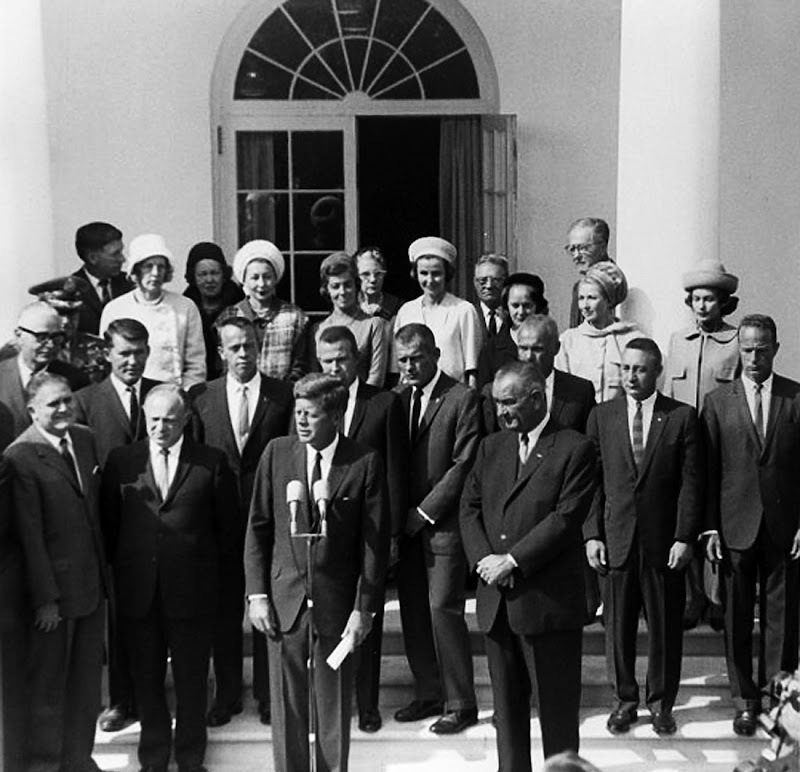 Several days later, JFK invited the Mercury astronauts to the White House for a congratulatory ceremony for Alan Shepard. 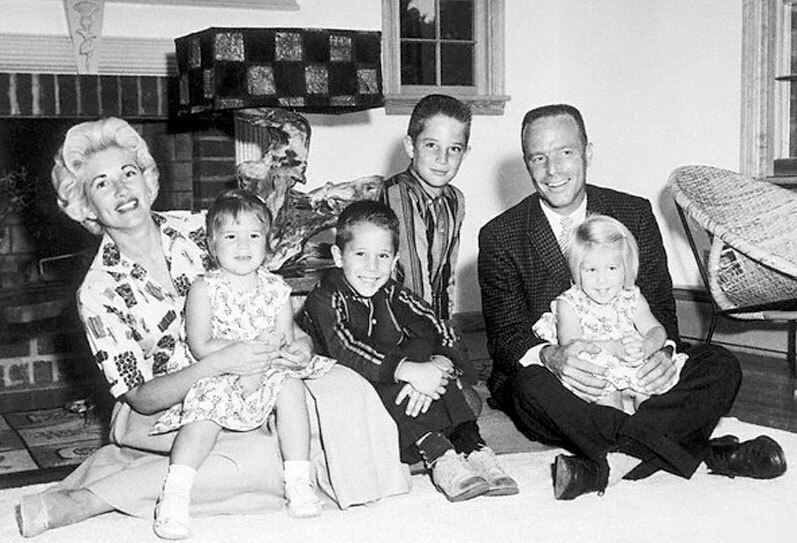 Scott Carpenter is pictured on the far right. 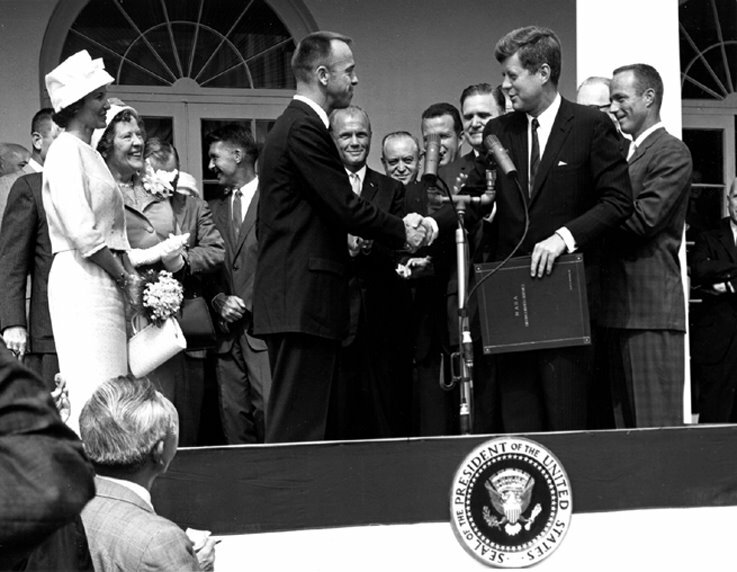 President Kennedy was in awe of Alan Shepard's accomplishment and suddenly it appeared as if the United States may take the lead in the space race. 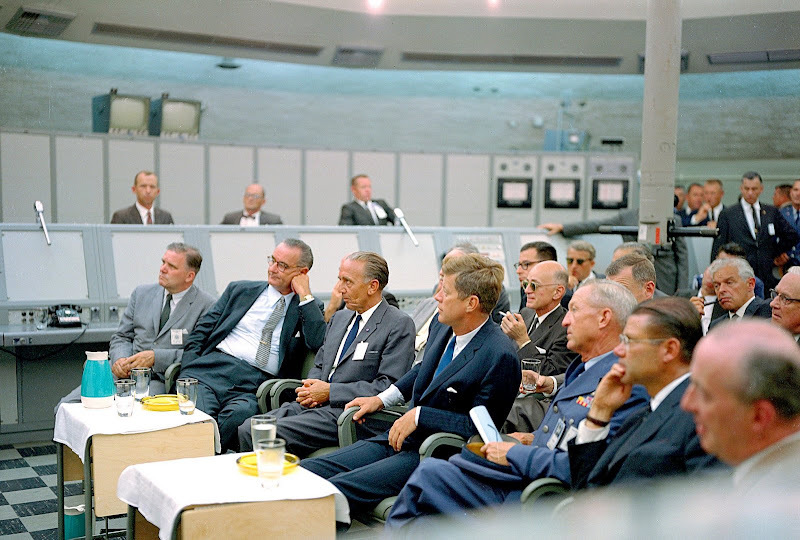 President Kennedy gave a speech congratulating the NASA team. 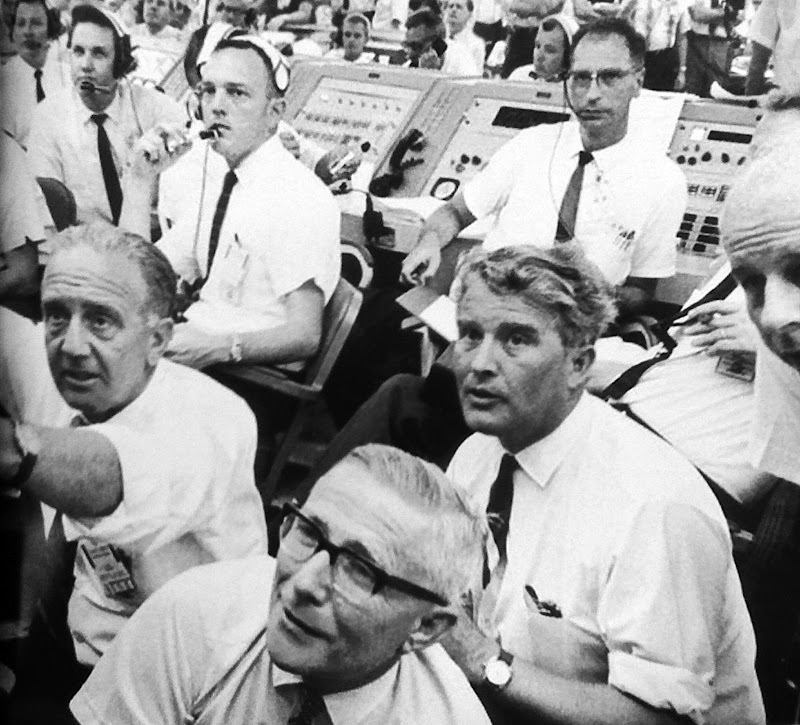 Scott Carpenter is pictured once again, on the far right. We Are Going To The Moon!!! 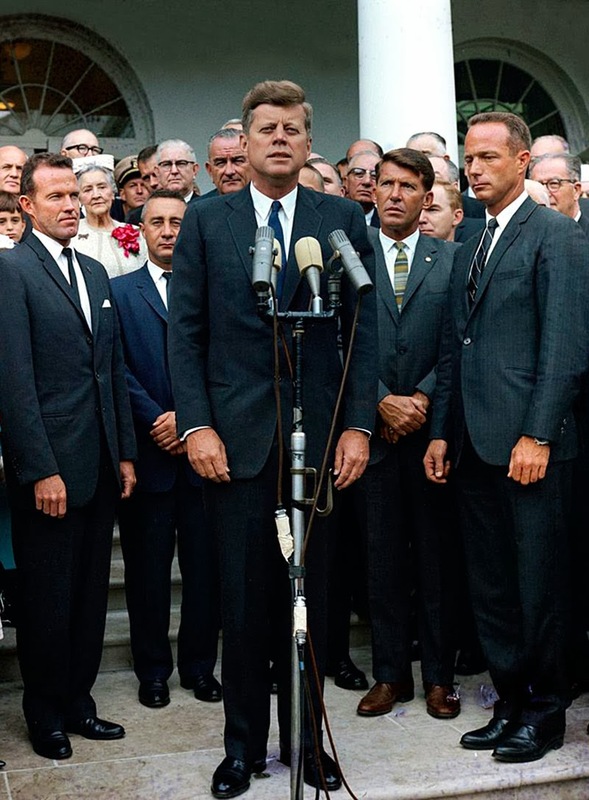 On May 25, 1961, just several weeks after Alan Shepard's successful sub-orbital flight, President Kennedy delivered his first space speech, where he told the U.S. Congress he wanted them to commit to sending a man to the Moon, and returning him safely to earth within a decade. You can listen to President Kennedy's first moon speech by clicking on the play button below. 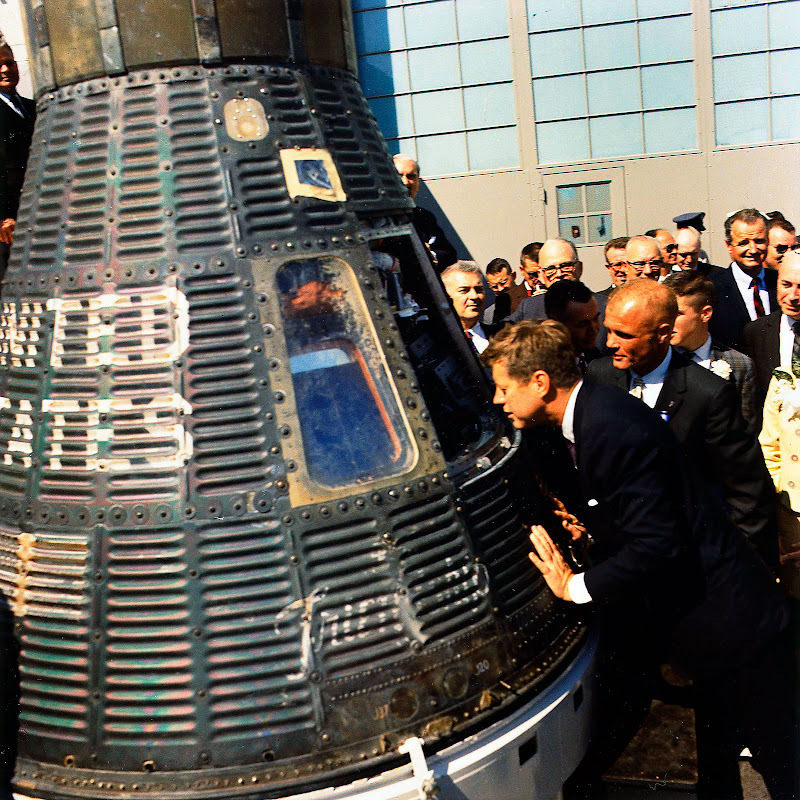 JFK is pictured below with Mercury Astronaut, John Glenn in February of 1962 at Cape Canaveral examining John Glenn's Friendship 7 spacecraft. John Glenn was the third Mercury astronaut in space and he was the first to orbit the earth three times. 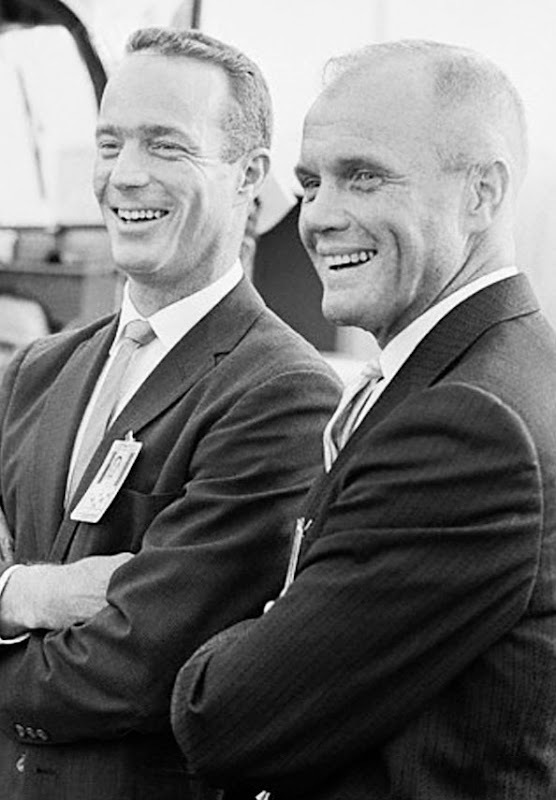 Scott Carpenter was John Glenn's backup pilot for the first NASA mission to orbit the planet. 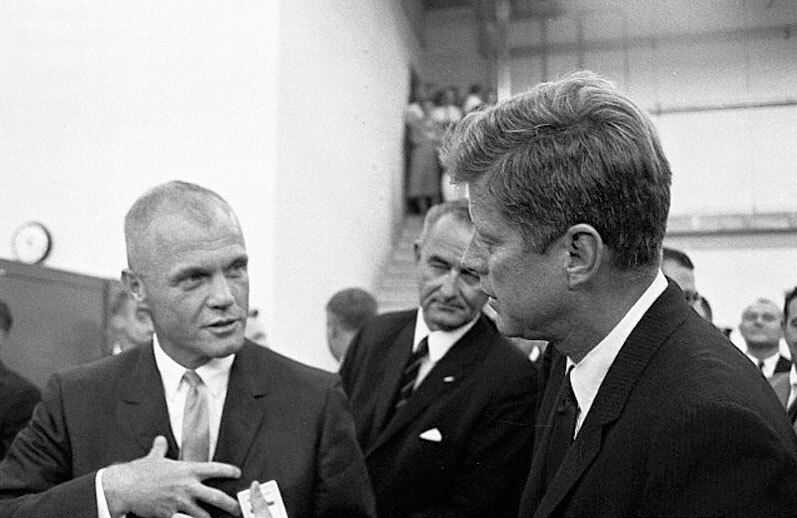 John Glenn is picture below with JFK and Lyndon Johnson. 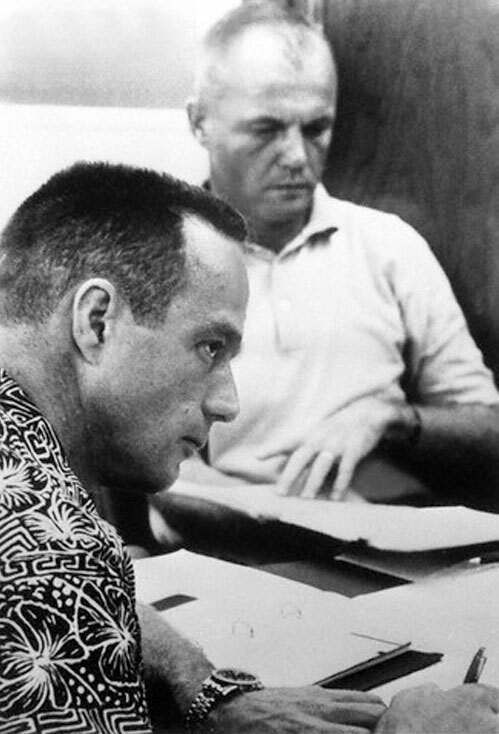 Scott Carpenter is pictured below at NASA's Mercury Control Center as he prepares to follow John Glenn into space as the fourth Mercury Astronaut. 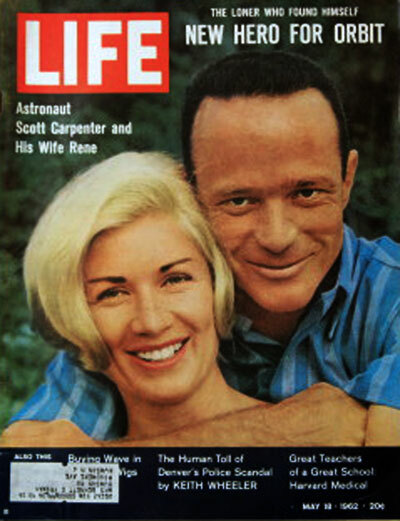 Scott Carpenter is pictured above with his beautiful family and below with his wife Rene at the time, on the cover of Life magazine just before taking off on Aurora 7. 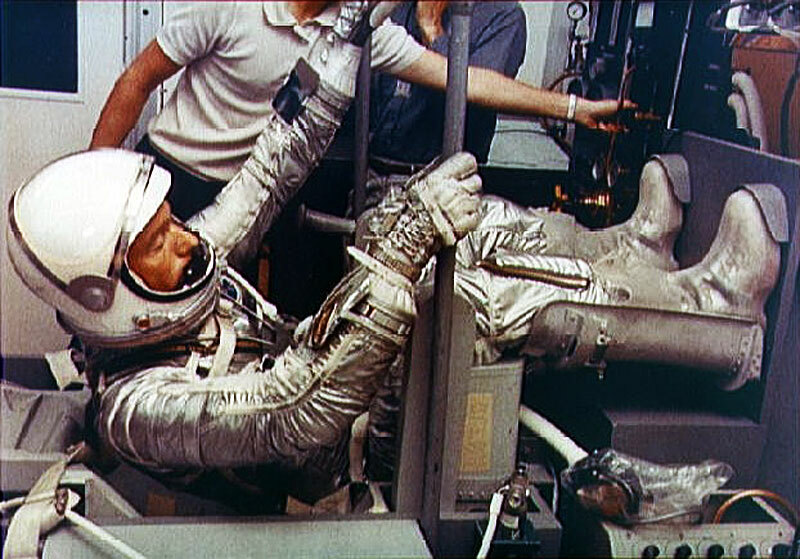 Scott Carpenter is pictured below, during testing procedures at NASA to prepare him for his Aurora 7 space flight mission. In the photo above, taken in the early morning of May 24, 1962, Scott Carpenter was waiting for mission control to give the green light for him to board the capsule. In the photo below Scott looks into the cockpit of Aurora 7, just before climbing inside for take off. 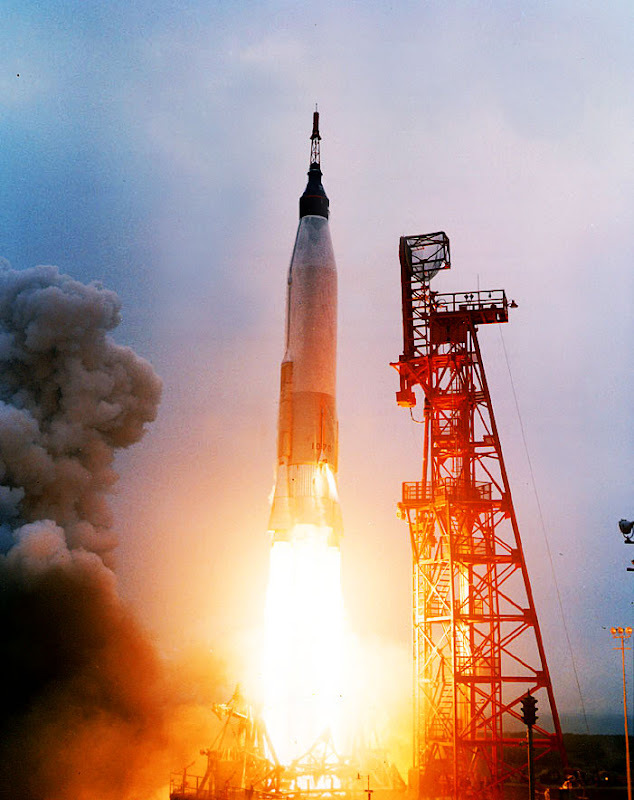 The photo below is of Scott taking off to explore the heavens aboard Aurora 7. 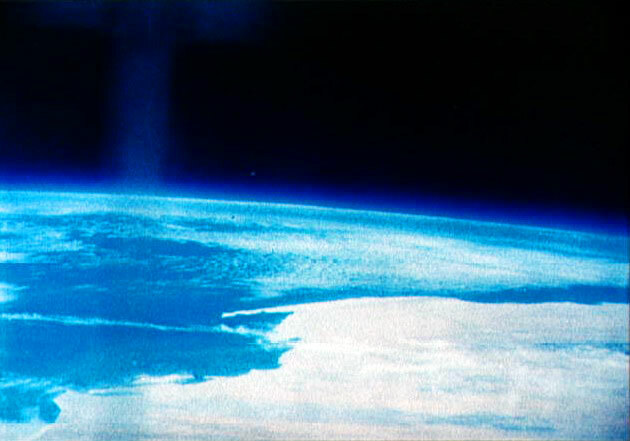 Scott Carpenter took the photo below of the North West coast of Africa from the tiny window on the Mercury spacecraft as he orbited the earth three times. 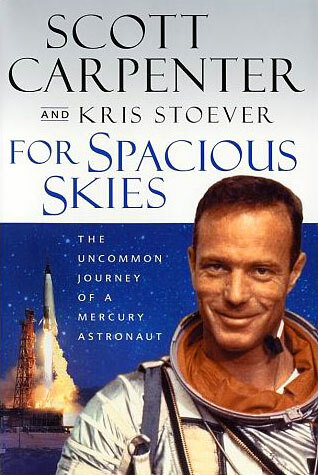 Scott Carpenter flew the second American manned orbital flight in his Aurora 7 spacecraft. 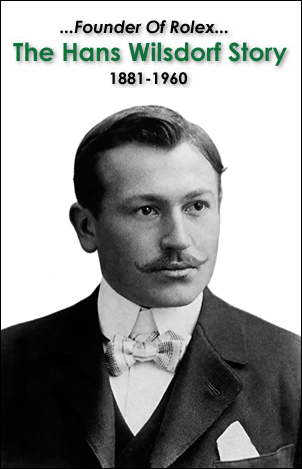 He piloted the spacecraft through three revolutions of Earth and reached a maximum altitude of 164 miles. His spacecraft landed in the Atlantic Ocean approximately 1,000 miles (1609 Kilometers) southeast of Cape Canaveral after a 4 hour and 54 minute flight. The photo above was taken in the helicopter filled with Navy Seals who picked up Scott and his capsule from the ocean after his splash-down. The photo below was taken on-board the USS Intrepid. Scott is on the radio phone talking with President John F. Kennedy, who is congratulating him for his successful flight on Aurora 7. 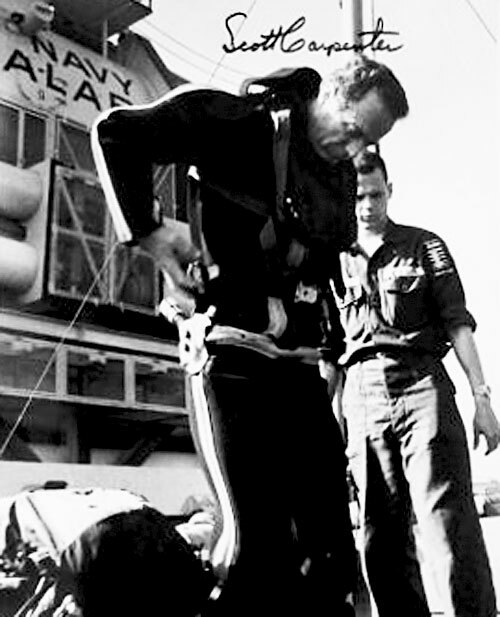 Scott is pictured below after he returned from his flight on Aurora 7. He is pictured hugging his daughter Kris as his other daughter Candice shows him a bruise on her elbow. Scott's son Jay is also pictured from behind greeting his father. When Scott got back to Boulder, Colorado the proud city had a huge celebratory parade in his honor. 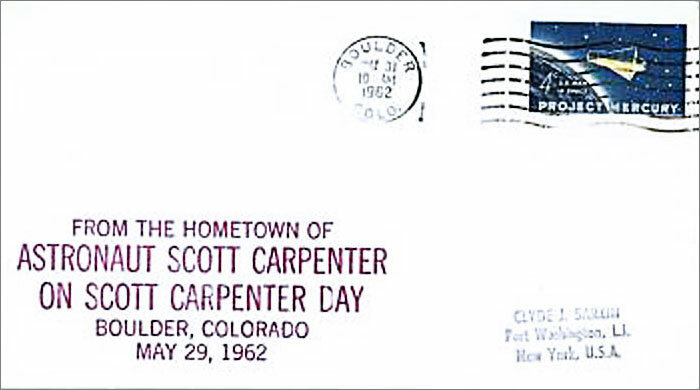 The United States was so excited and proud, they came out with a special commemorative stamp for Project Mercury and the city of Boulder, Colorado had a special "Scott Carpenter Day" to celebrate their hometown hero. Scott became a celebrity superstar after he got back from space. 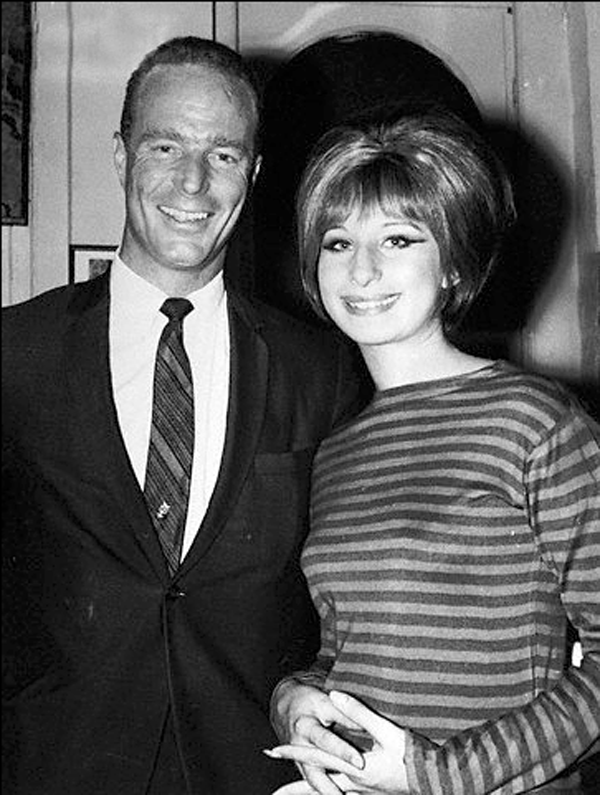 He is pictured below with Barbra Streisand. 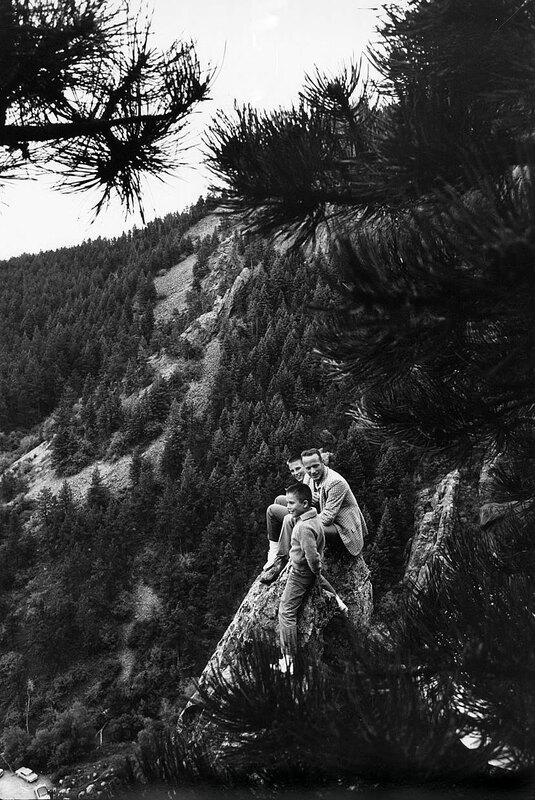 Scott is pictured below with two of his sons at Flatirons near Boulder, Colorado. 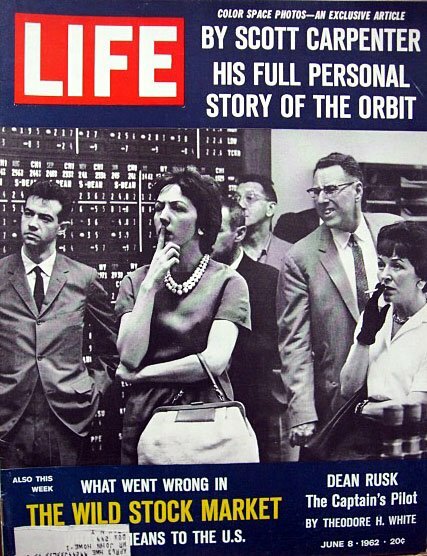 Scott ran into complications and had to manually fly the spacecraft back to earth, and his wife Rene was interviewed in Life Magazine about the ordeal as pictured below. 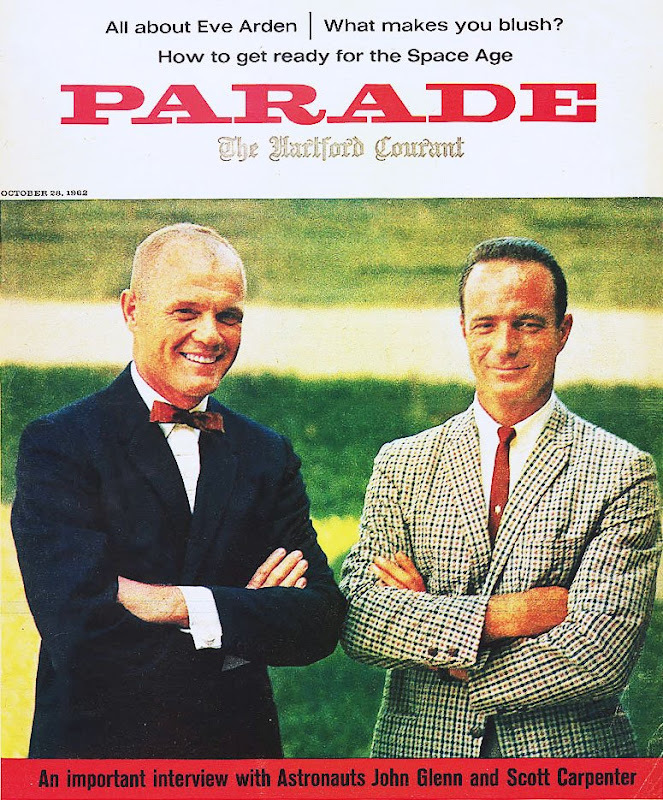 Scott Carpenter is pictured below with his fellow Mercury astronaut and good pal, John Glenn on the cover of Parade Magazine. By late 1962, the Mercury astronauts had become very famous. Scott was the backup pilot for John Glenn so that if something went wrong and John Glenn was not able to fly, Scott would have flown for him. Since Scott and John spent so much time training together they became extremely close. 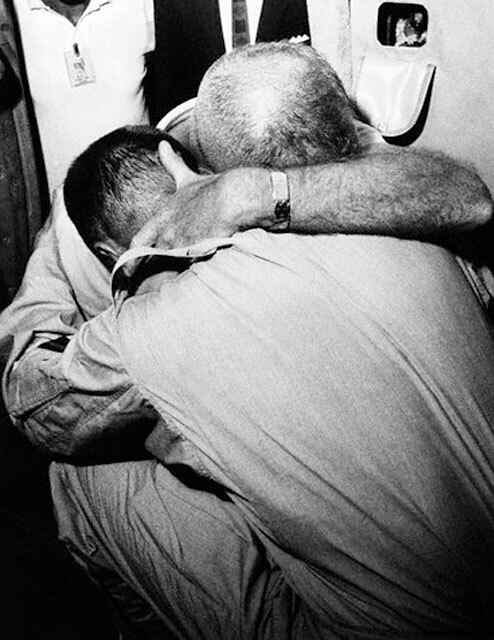 In the photo below taken on Grand Turk Island, John Glenn is hugging Scott Carpenter after Scott returned from his flight. 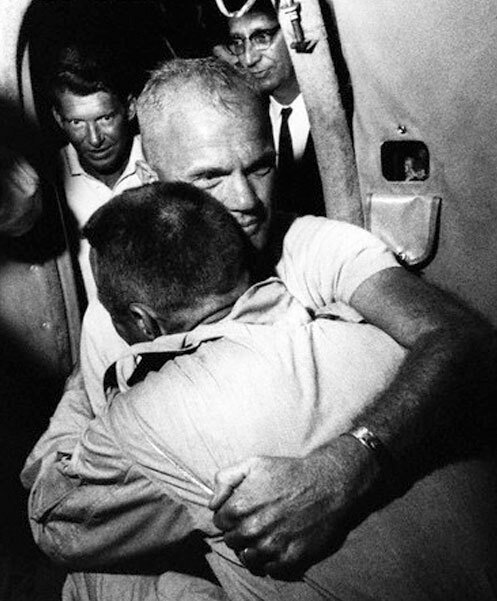 John Glenn was the only other man on earth who had gone through the exact same experience as Scott Carpenter which culminated in an unbreakable bond. 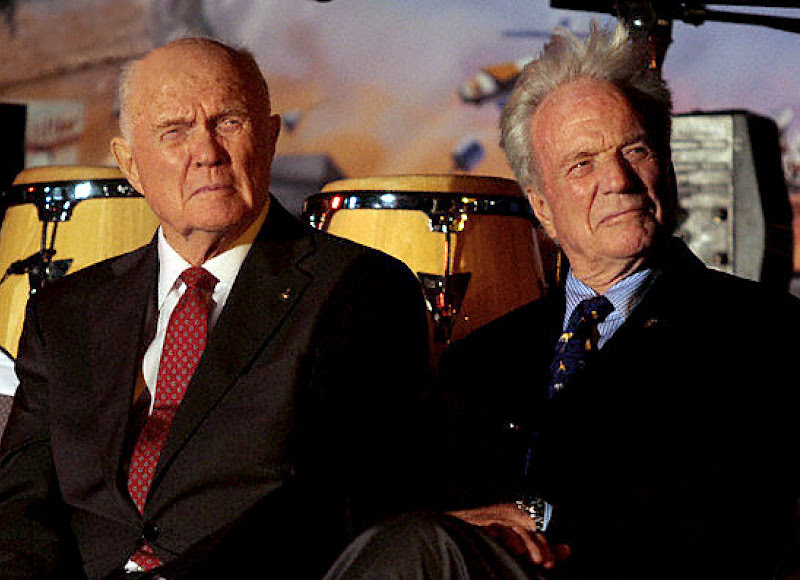 I think John Glenn is wearing his Rolex backward so the watch is on the palm side of his wrist. 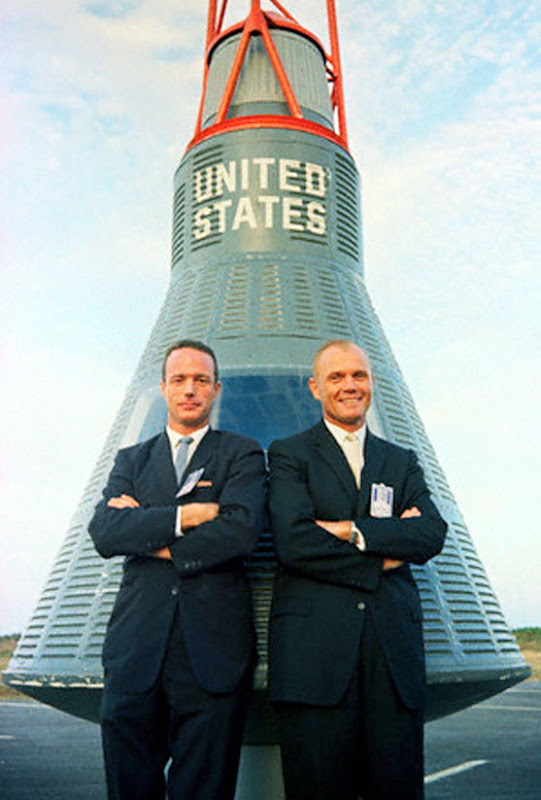 John Glenn and Scott Carpenter really were the stars of the Mercury project. Their solid friendship endures to this day as you can see them recently photographed below. 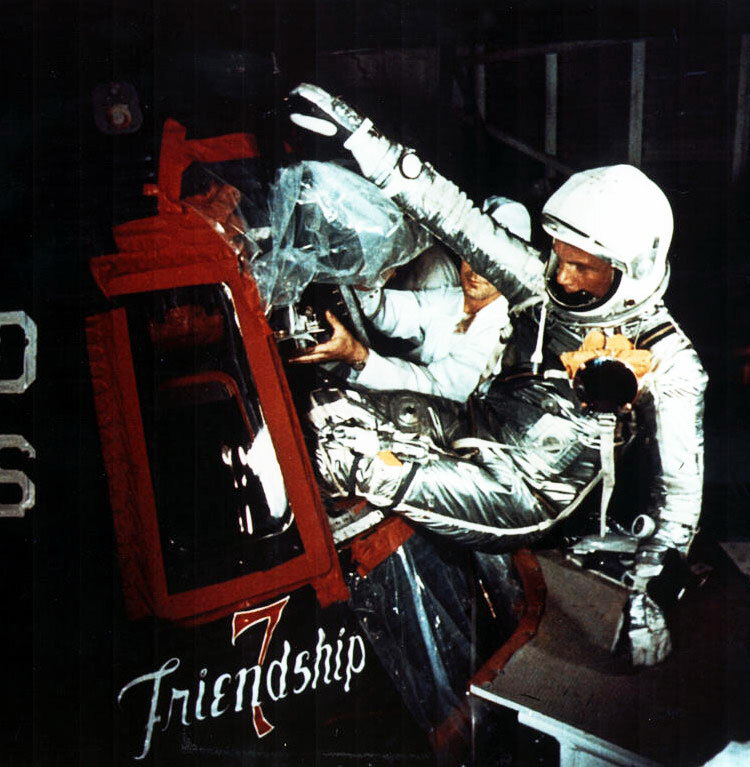 Today, John Glenn and Scott Carpenter are the only Mercury astronauts still living. The image below was taken in 1963. 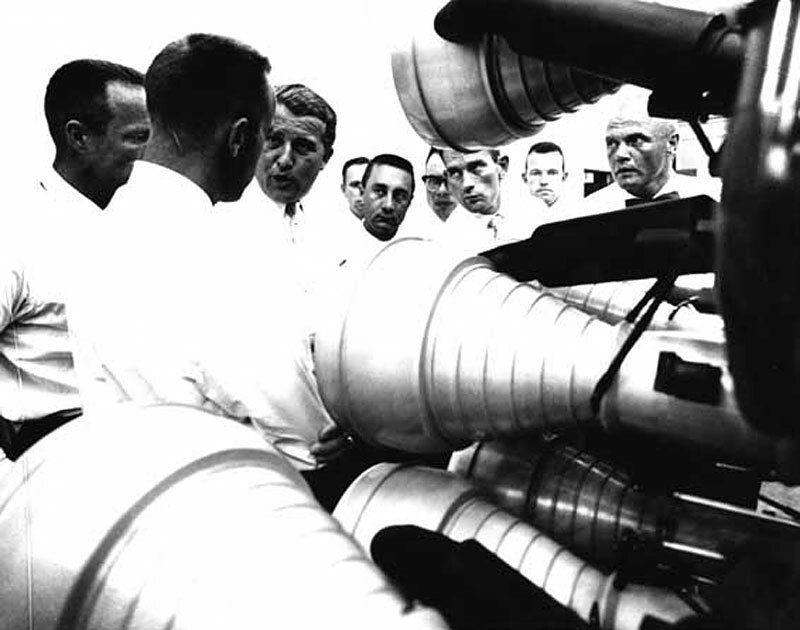 From left: Cooper, Wally Schirra (partially obscured), Alan Shepard, Gus Grissom, John Glen, "Deke" Slayton, and Scott Carpenter. Scott was arguably the most handsome and charismatic of the original seven Mercury astronauts. Scott Carpenter is pictured below at the White House on May 21, 1963, attending an Distinguished Service Medal Ceremony for his fellow NASA Mercury Astronaut, Major Gordon Cooper. Scott has always been a watch collector and in the photo above, he is showing off his Breitling Navitimer watch to Mercury nurse, Dolara Dee O'Hara. Carptener asked Breitling for a watch with a 24 hour marked dial and got a special Breitling Navitimer named "Cosmonaute." However, during splash down on May 24, 1962 his "Cosmonaute" chronograph was severely water damaged and was discarded as Breitling offered Scott Carpenter a new model after the Aurora-8 mission. 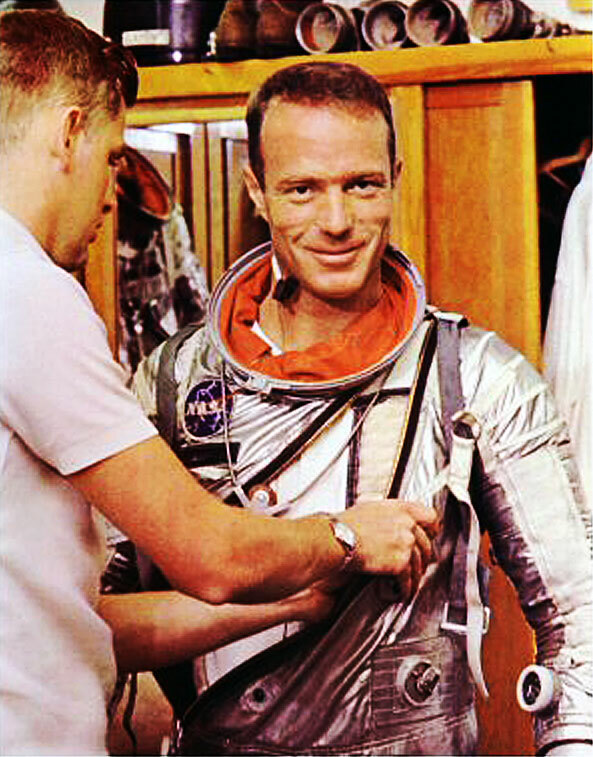 The photo below, taken in 1966 shows Scott Carpenter wearing his replacement Breitling. I mentioned to Scott I heard he was always a big watch fan and he said "I do have a fascination for watches." When exactly did Scott's fascination with fine mechanical watches begin? If you read the following letter Scott wrote to his father when he was only 17, you will learn that Scott apparently was showing signs of Wisitus from a young age. I asked Scott what brands he enjoyed, and he told me he had a relationship with Breitling for a long, long time. He told me that Breitling made a Scott Carpenter watch just for him, made to his specifications that he flew with back in 1962. The First American to wear a Wristwatch In Space? 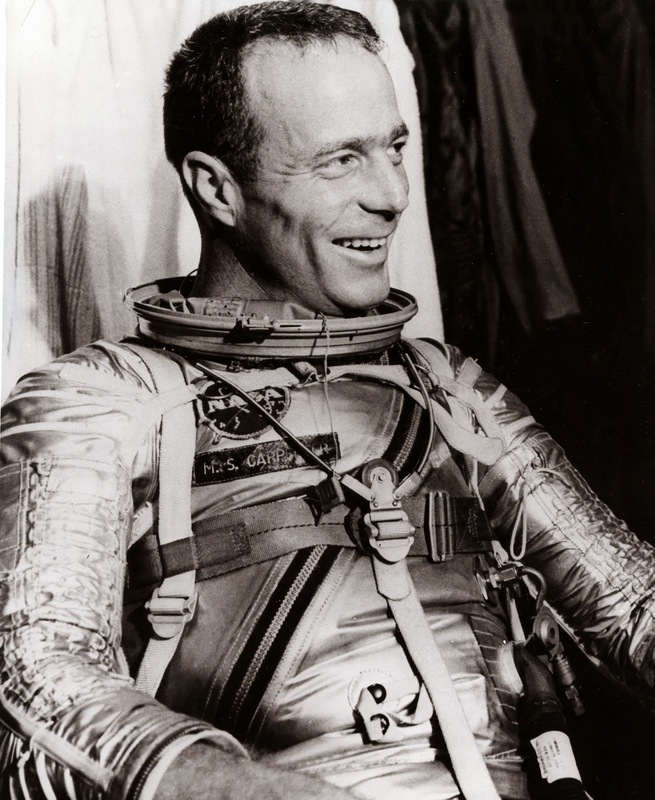 Scott Carpenter said "Early on in Project Mercury, for an unmanned Atlas launch, I went to Perth, Australia and flew with the RAAF (Royal Australian Air Force), and it was there I saw the Breitling Navitimer, which had been issued to the RAAF pilots." "Timekeeping was one of my areas of responsibility as part of my overall task developing Project Mercury navigation systems. 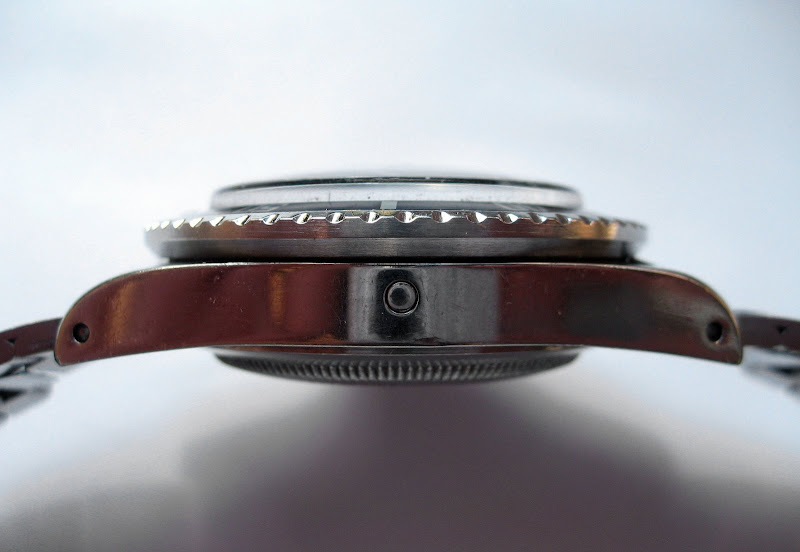 My thought was that the Navitimer would be perfect for the Project Mercury astronauts." 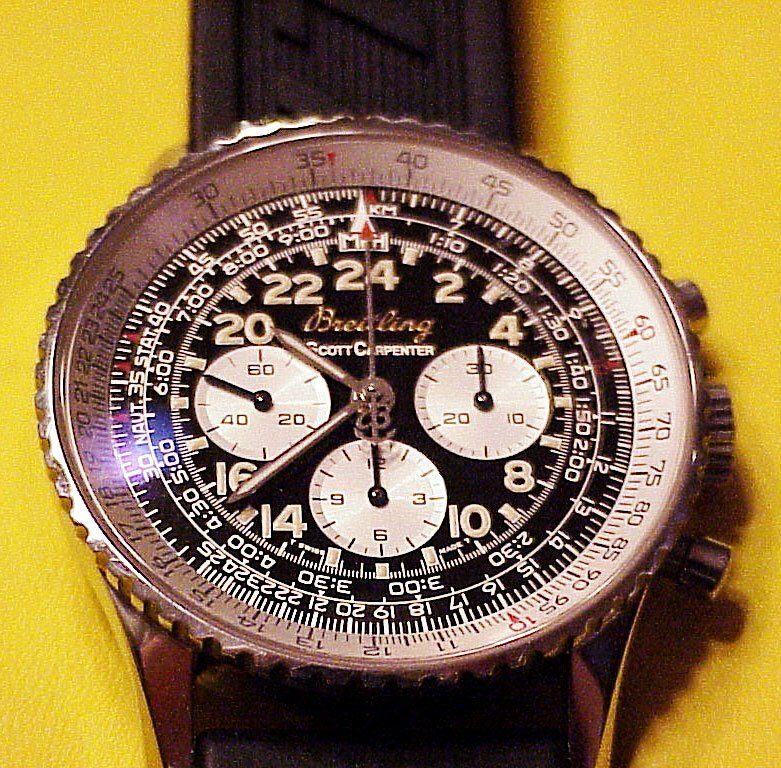 "The Breitling Navitimer required some redesign for space-flight. For one, the astronauts would not need a tachymeter (a scale with which one measures hourly production rates). 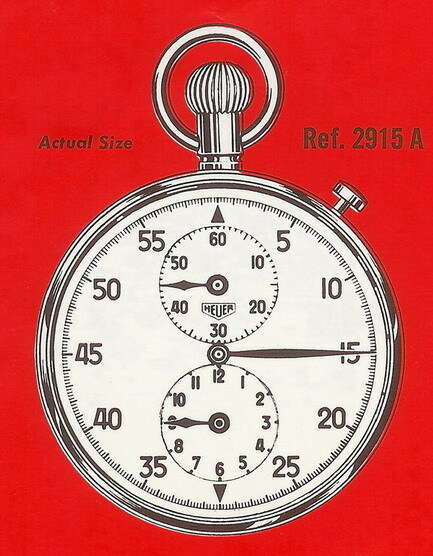 I had them replace the tachymeter with a 24-hour dial." "Breitling sent me the redesigned watch, called the Cosmonaut (Breitling was in the French-speaking part of Switzerland, and the cosmonaute was French for astronaut), four days before my flight aboard Aurora 7. 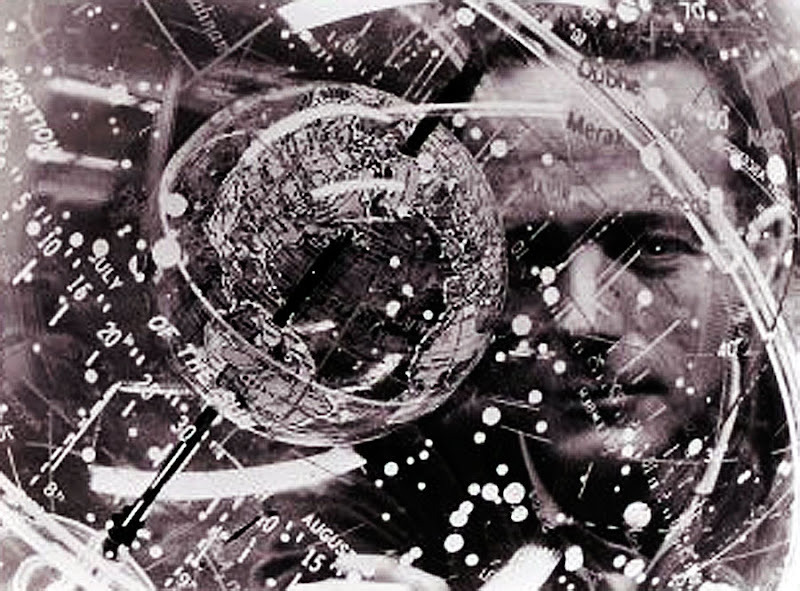 It was basically a Navitimer with a circular slide rule." As far as I can tell, Scott Carpenter was the first American Astronaut to wear a wristwatch in space. 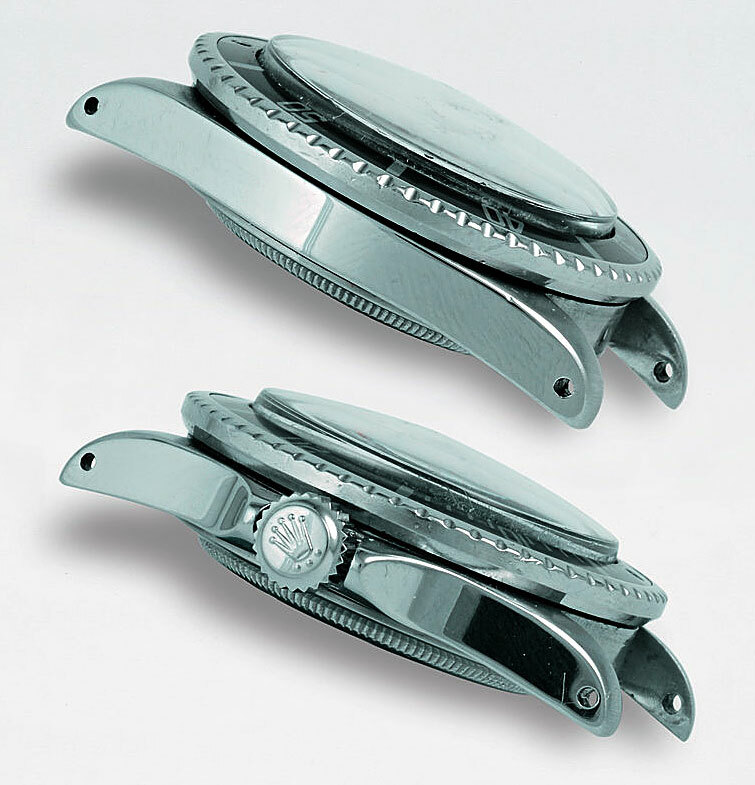 When Scott splashed down in his Aurora 7 capsule his Breitling got wet and experienced some water damage. 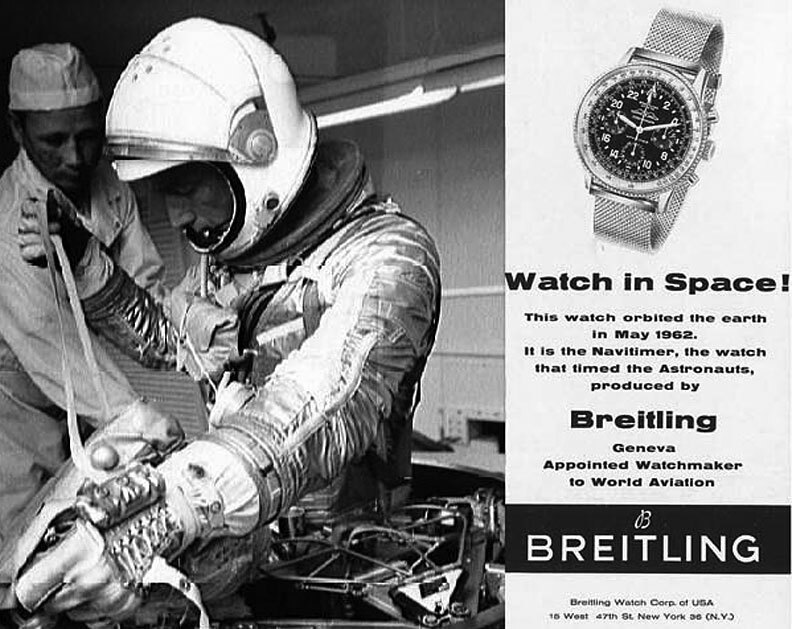 Scott sent it back to Breitling for repair, but Breitling pulled the switcho-chango and sent him back a different watch, thus keeping the first wristwatch flown in space for their museum. As you can see from the Breitling advertisement pictured above, Breitling advertised their watch as follows, "Watch in Space! This watch orbited the earth in May, 1962. It is the Navitimer, the watch that timed the Astronauts, produced by Breitling." 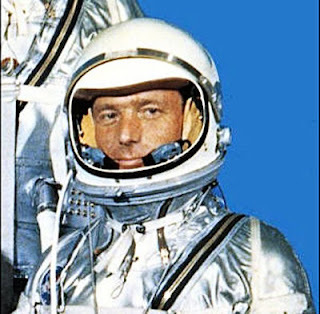 Breitling later issued a Scott Carpenter Cosmonaute watch based on his 1961-1962 design. The original redesigned watch Breitling customized for Scott Carpenter was probably the first wrist-watch to be flown on an American manned orbital mission. Scott said "They sent it back to me and removed the word Navitimer, and put the word Cosmonaut on it." I asked him if John Glen flew with a Breitling and he said that he recalled John Glenn told him he flew without a wristwatch. I believe that at the time John Glenn wore a Rolex Datejust, so if he did wear it under his space suit it could have been the first wristwatch worn on an American Astronaut's wrist. I hope to do a future interview with John Glenn, so I will follow up with answering these questions. 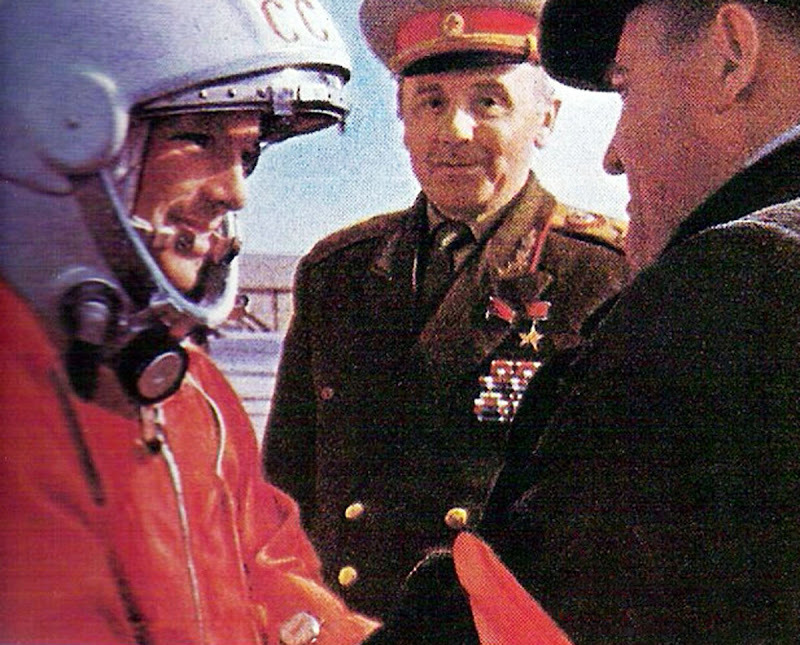 According to www.OnTheDash.com, Yori Gagarin, the Soviet Cosmonaute, wore a Sturnmanskie Chronograph on his wrist aboard his Vostok 1 flight on April 12, 1961. 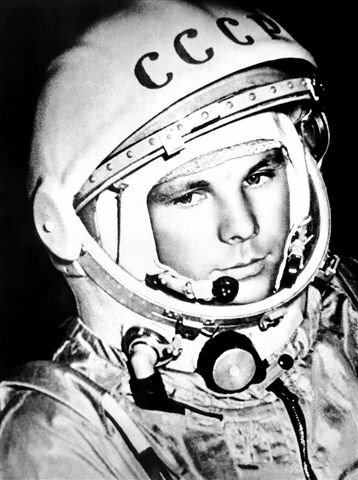 Yori Gagarin was the first man in space and completed one orbit of the earth. It is not know if Alan Shepard or Gus Grissom wore watches on their sub-orbital flights prior to John Glenn and Scott Carpenter. Wally Schirra was the fifth American astronaut to fly and he orbited the earth six times on May 24, 1962 just after Scott Carpenter. 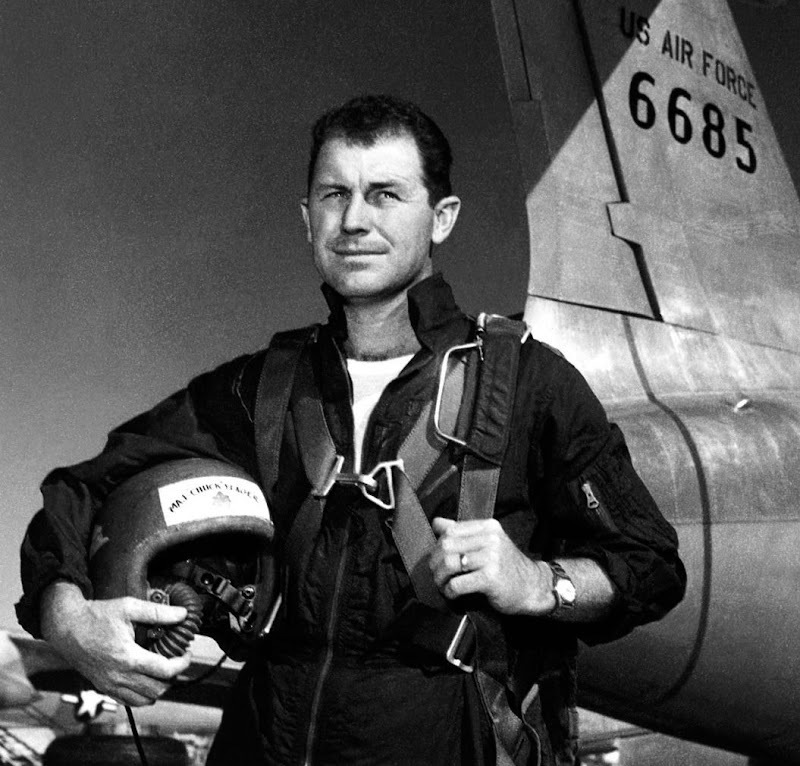 Wally Schirra wore an Omega Speedmaster on his flight. My pal Sheldon Smith who publishes www.Minus4Plus6.com sent me a link back in May that details that John Glenn did wear a Tag-Heuer Stopwatch on the outside of his space suit. I would like to thank Jeff Stein of www.OnTheDash.com for providing the following images of John Glenn. 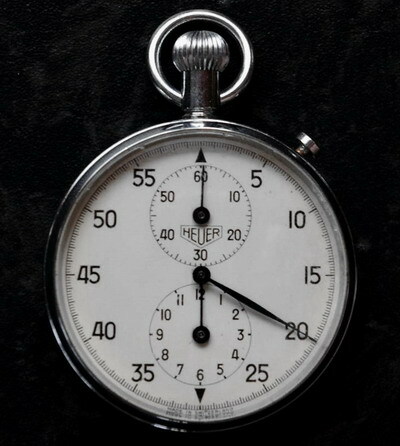 You can learn more about Glenn's Tag Heuer Stopwatch from www.OnTheDash.com by clicking here. 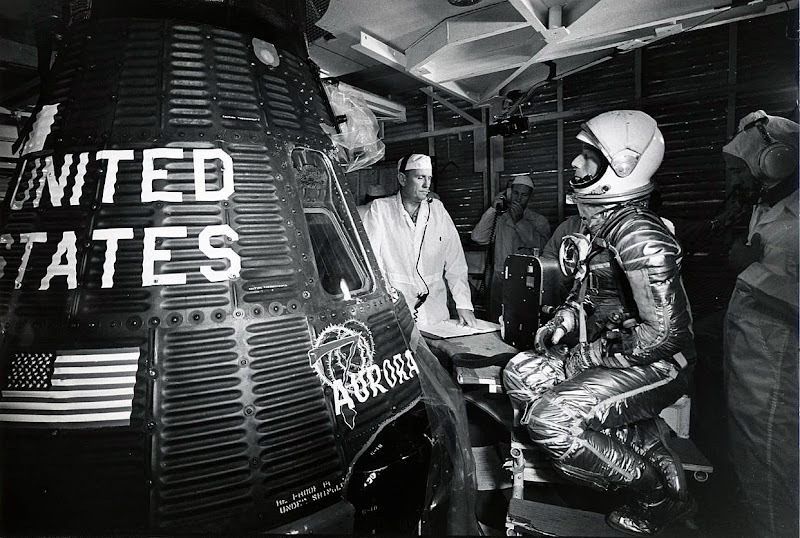 John Glenn is pictured above just before the flight of MA-6 (Mercury Atlas 6). Notice the white-dialed Tag Heuer stopwatch on his right forearm. 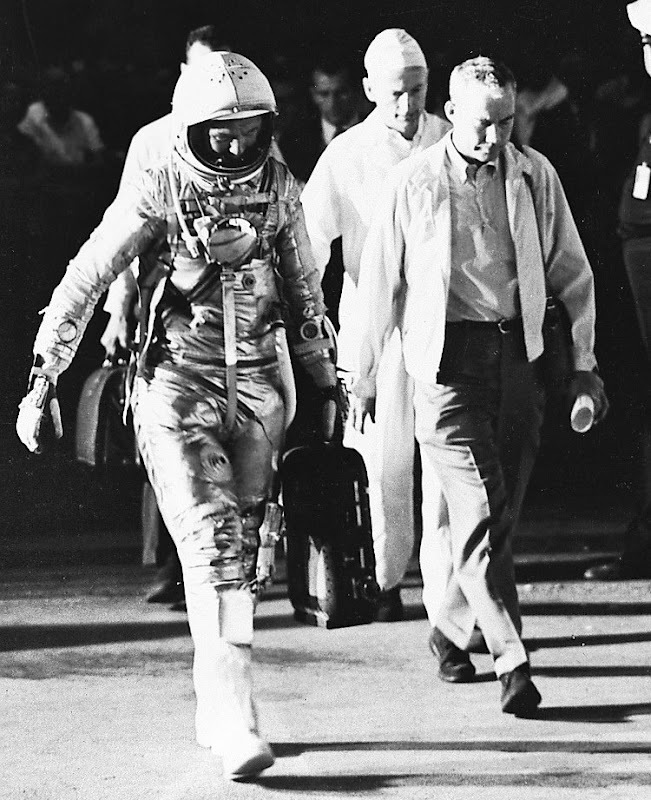 The NASA caption dated February 20, 1962 reads "View of Astronaut Flight Surgeon, and equipment specialist Joe Schmitt leaving crew quarters prior to Mercury-Atlas 6 (MA-6) mission. 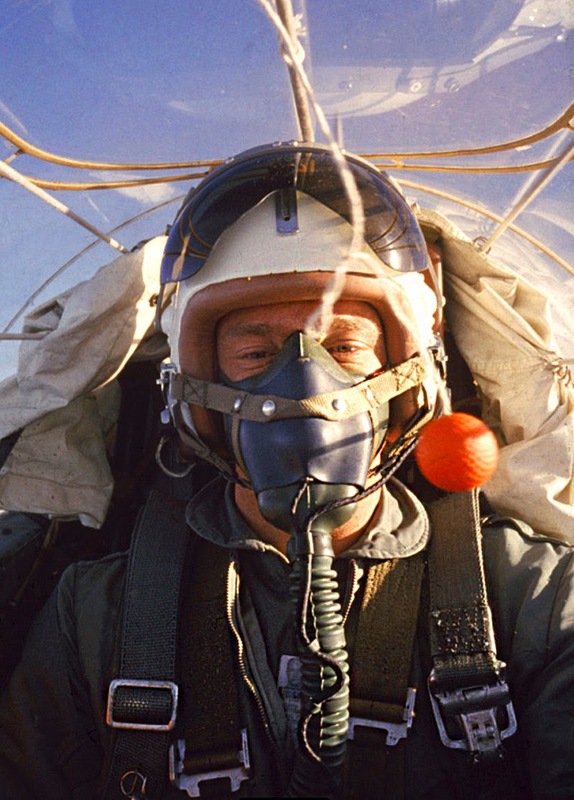 Glenn is in his pressure suit and is carrying the portable ventilation unit." 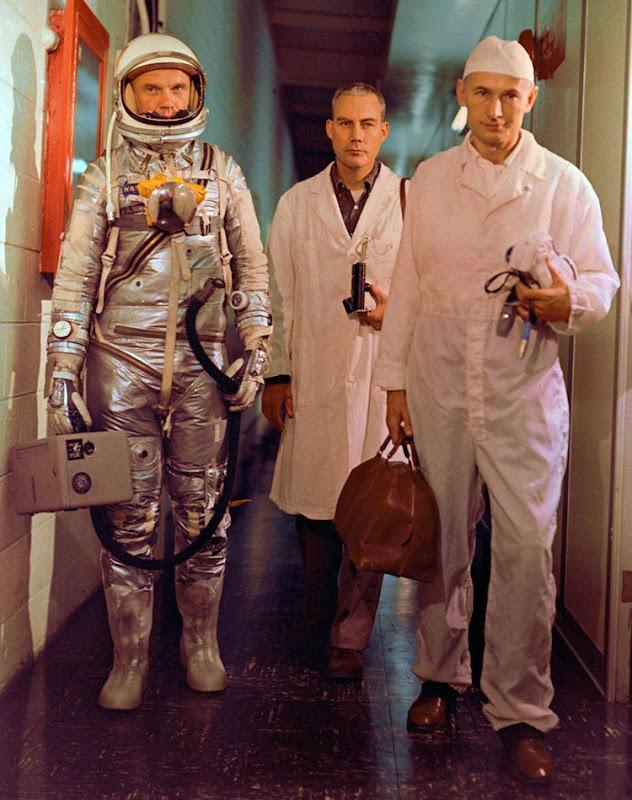 The NASA caption for the image below dated February 20, 1962 reads, "View of Astronaut John H. Glenn Jr., Dr. William Douglas, Astronauts Flight Surgeon, and equipment specialist Joe Schmitt leaving Operations and Checkout Building prior to Mercury-Atlas (MA-6) mission. 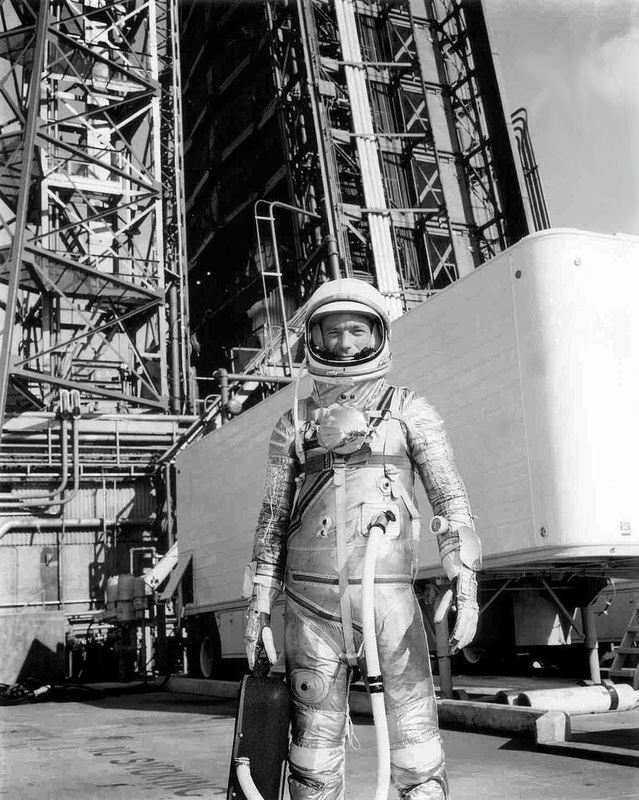 In the NASA image below the caption reads "Overall view of astronaut John Glenn, Jr., as he enters into the spacecraft Friendship 7 prior to the MA-6 launch operations at Launch Complex 14. 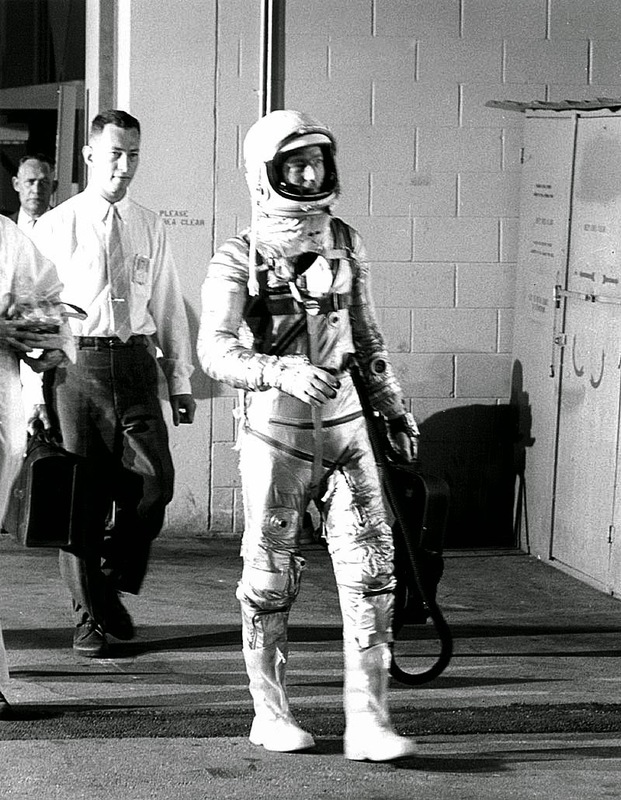 Astronaut Glenn is entering his spacecraft to begin the first American manned Earth orbital mission." 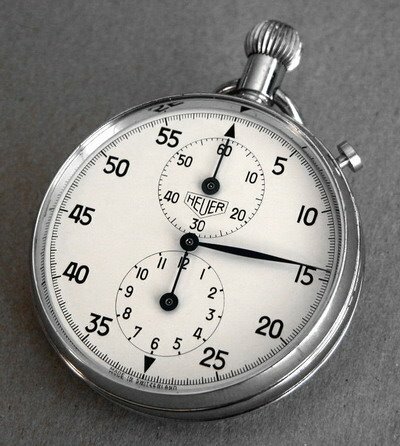 John Glenn's Tag Heuer stopwatch pictured above is in the Smithsonian Institutes National Air and Space Museum located in Washington D.C. 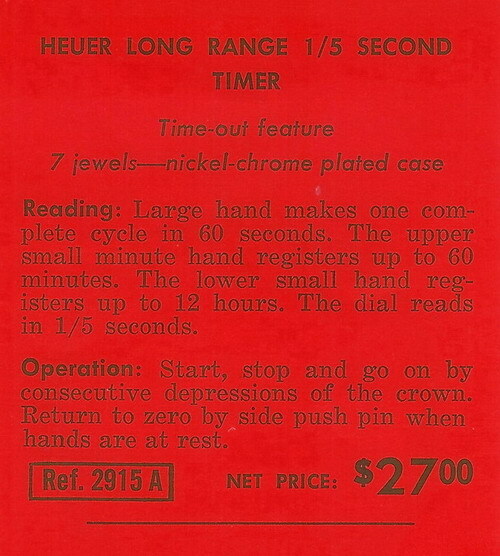 The image above and below are from Tag Heuer's 1961-1962 catalog. The photo above and below are of two samples of the same model Tag Heuer that John Glenn flew with. 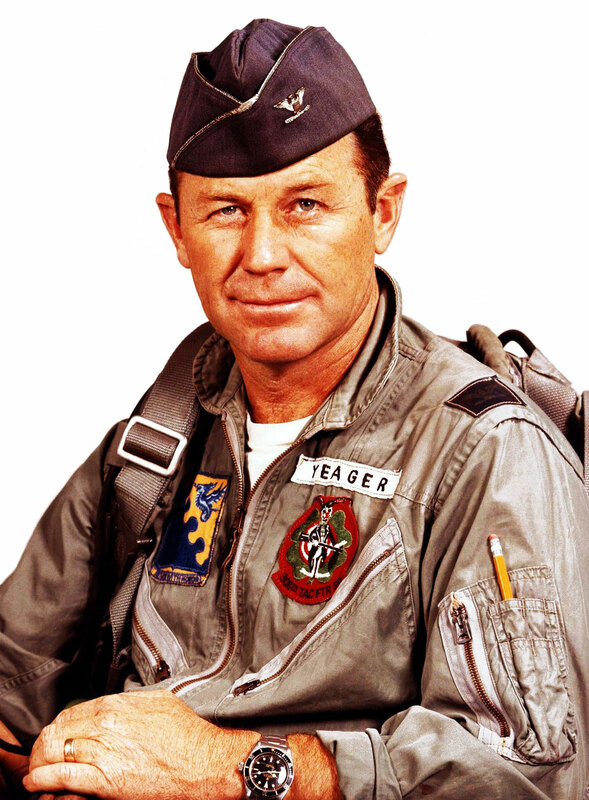 Chuck Yeager is pictured below wearing his Rolex Submariner. 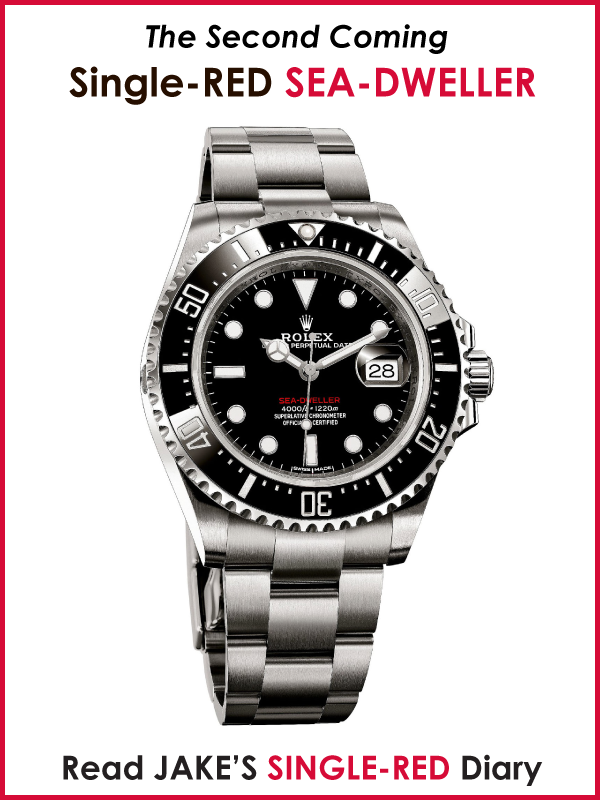 You have to click on the image below to see the detail in Chuck's Rolex Submariner. 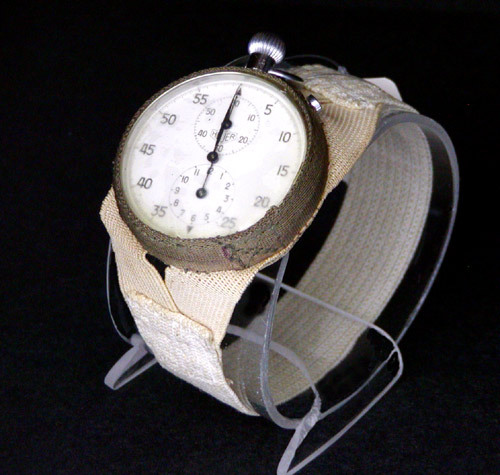 The first wristwatch worn in space was worn by Russian Cosmonaut, Juri Gagarin, aboard Vostok One on April 12, 1961. Juri flew the first manned space flight and single handedly started the space race. Juri Gagarian wore a Sturmananskie wristwatch as seen in the pre-flight photo taken below. 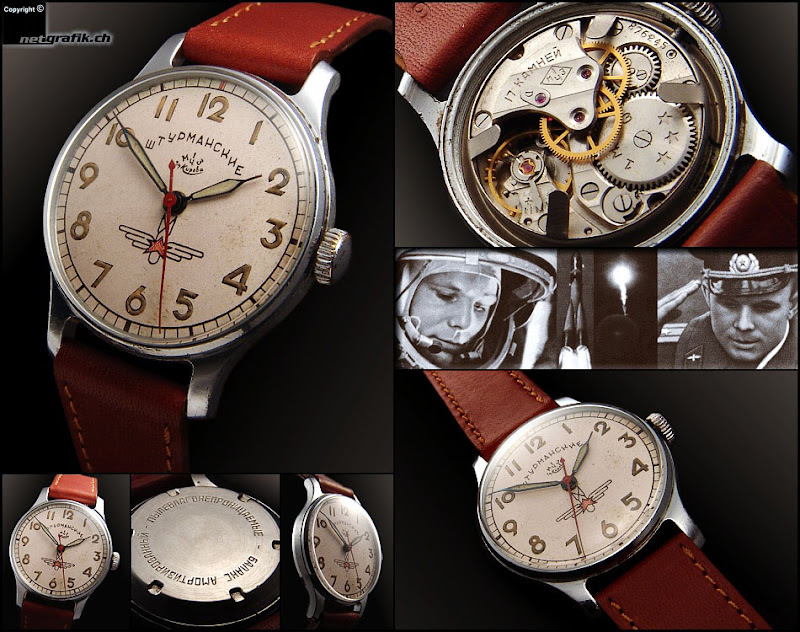 According to Phil of The Russian Times, "The Sturmanskie which had been issued to graduates of the prestigious Orenberg Flight School along with their diplomas since the late 1940's, was a logical choice due to the high quality movement and inherent accuracy of the watch." I would like to thank Phil of The Russian Times for providing the accurate history and photos of Juri Gagarin along with the photos of his watch model below. Phil has a magnificent website dedicated to Russian watches and clocks which you can visit by clicking here. 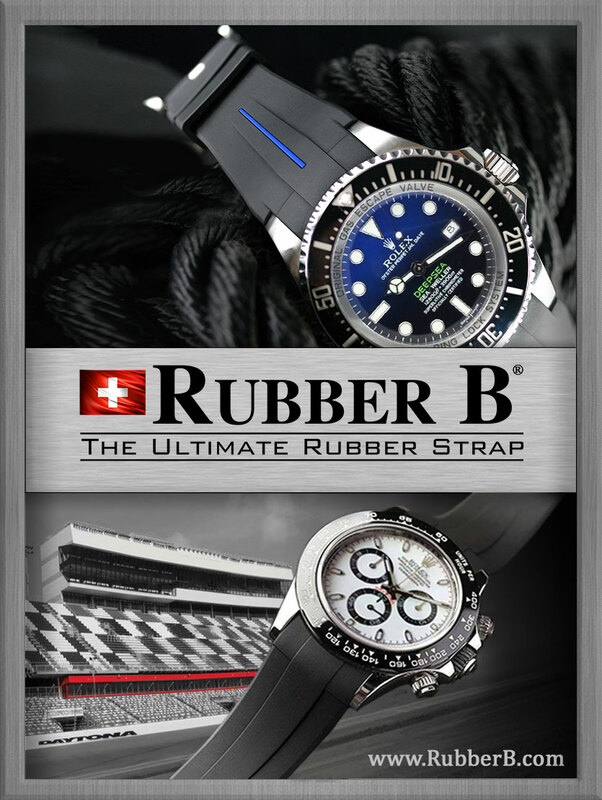 As much as Scott loves watches, watch companies seem to love him more. Omega had a Scott Carpenter advertisement which you can see below. Omega was chosen by NASA to be the official space watch and many of the NASA Astronauts wore the Omega Speedmaster Professional. I found a magnificent Omega website that is dedicated to the history of the Omega Moon Watches which you can visit by clicking here. 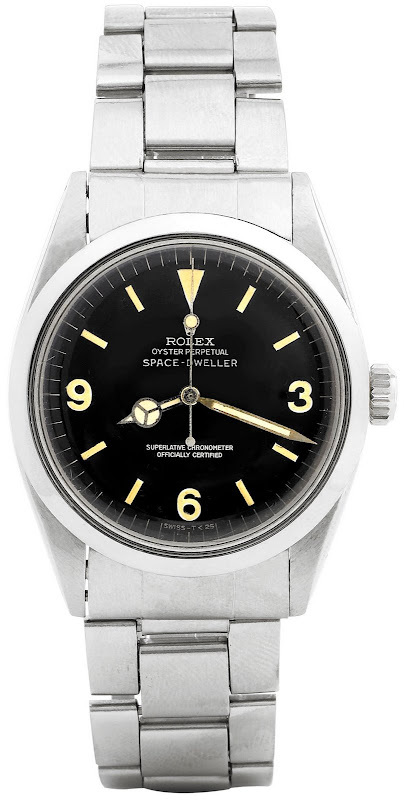 On Jake's Rolex Watch Blog, I broke stories on Rolex Moon watches I discovered in the NASA archives as well as Rolex on the Space Shuttle and International Space Station. 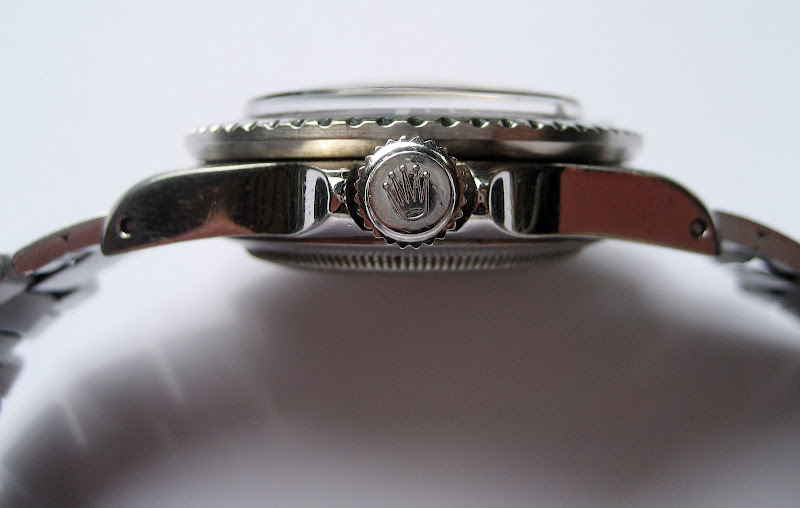 • Was The Rolex GMT The Real Moon Watch? The First Rolex in Space? • Apollo 11 Astronaut Michael Collins First Rolex in Space? 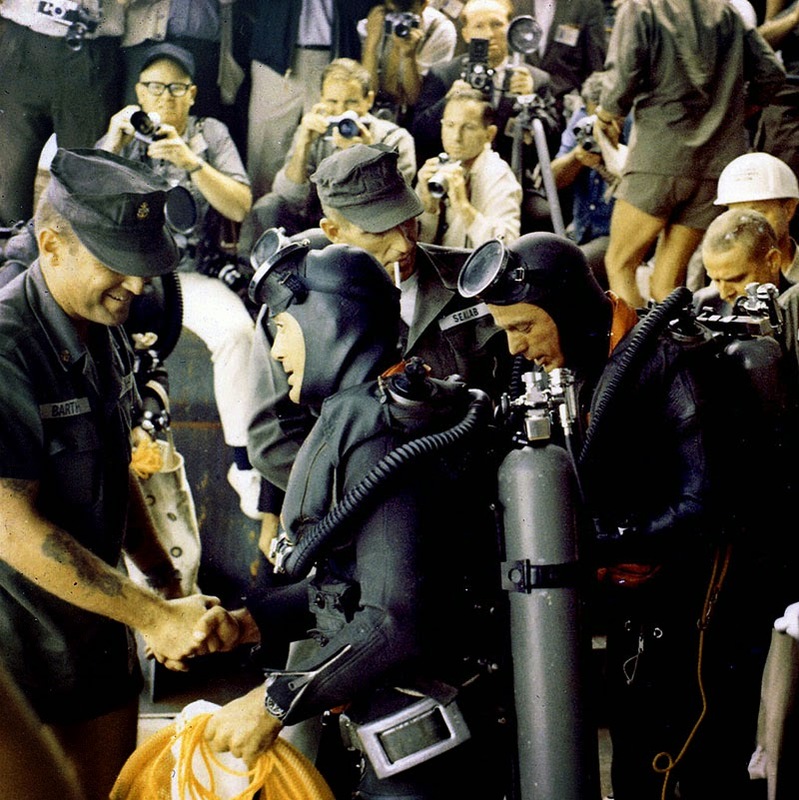 After Scott orbited the earth in his Mercury Aurora 7 in 1962, he was extremely inspired with the career achievements of another exploring pioneer who happened to have a French Naval background, and was a brilliant oceanographic biologist and filmmaker, Jacques Cousteau. Scott was convinced that living conditions for human beings underwater was almost identical with zero-gravity living conditions in space. 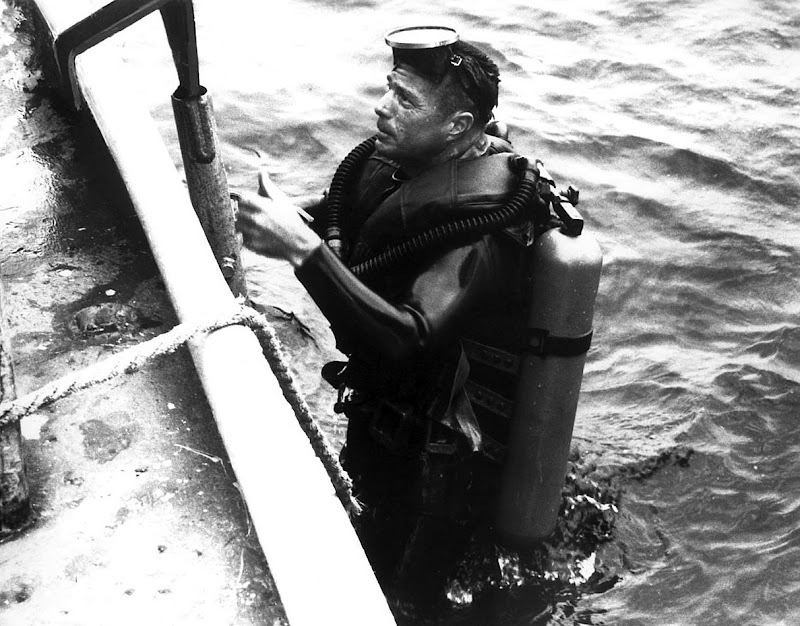 Scott pitched his boss as NASA on the idea that he wanted to work with Jacques Cousteau and was granted the opportunity. 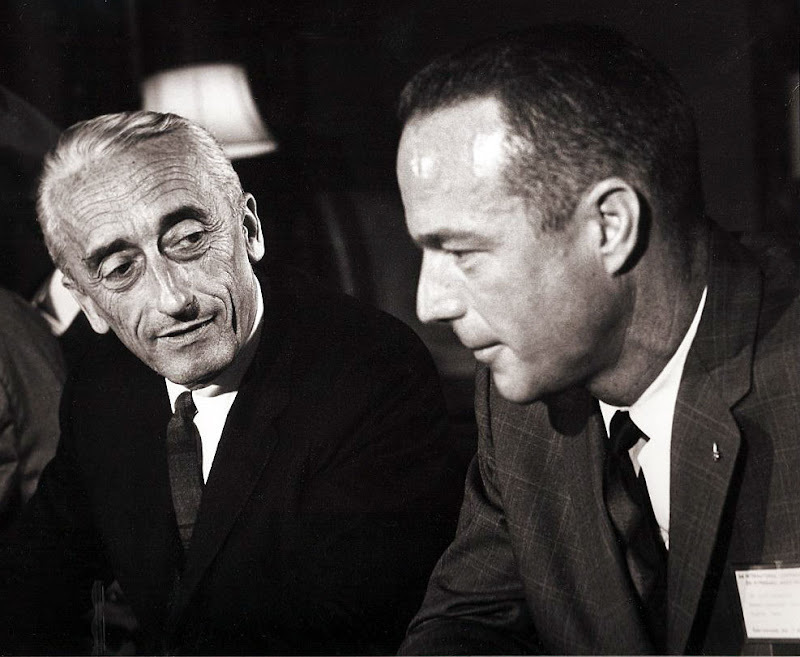 Jacques Cousteau was excited to work with Scott Carpenter and the U.S. Navy because it meant he would have access to some unusual and great resources. 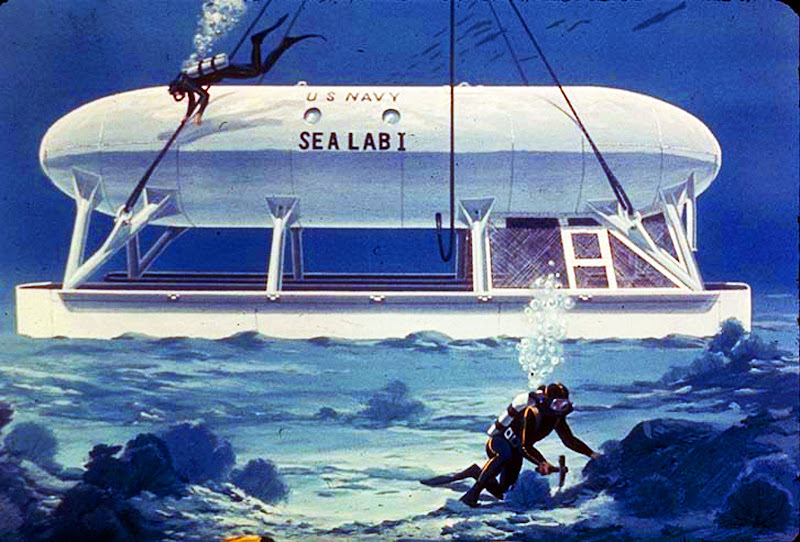 In 1963 Scott got involved with the U.S. Navy's SEALAB underwater habitat project and became an aquanaut. This gave him the pioneering distinction of being the first man to have the joint title of astronaut/aquanaut. Scott mentioned that according to American Submariner Crewmen, Submariner is properly pronounced Sub Marine r. Not Sub marin er. 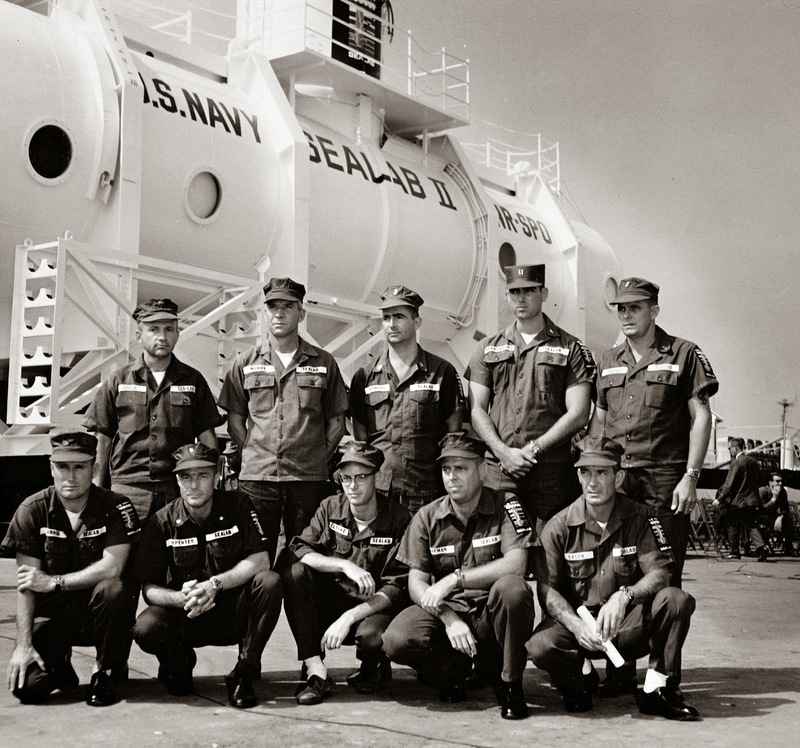 Scott told me the Navy issued all the divers who were part of the SEALAB project Rolex Submariners during SEALAB 1, and 2 and Rolex SEA-DWELLER watches during SEALAB 3. 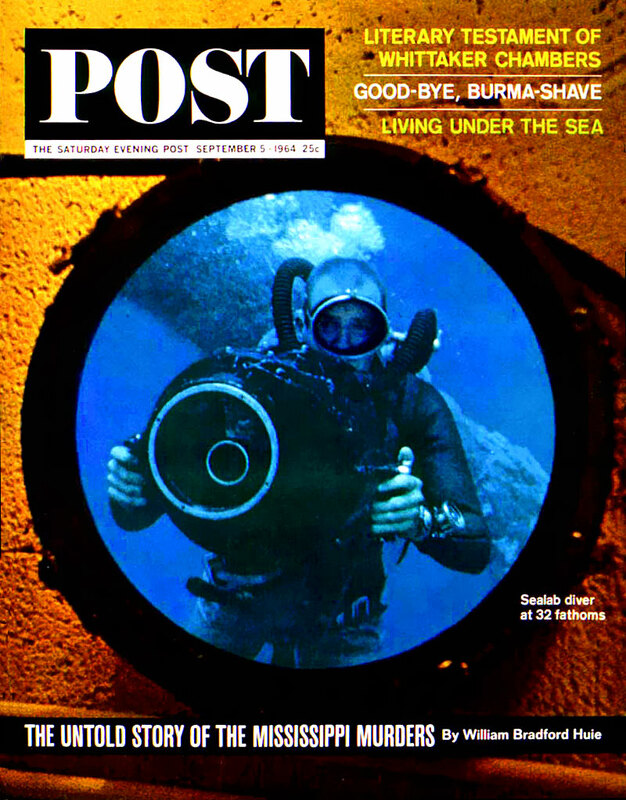 The image above is from the cover of The Saturday Evening Post on September 5, 1964 that had a story about SEALAB. In 1965 Scott was a member of SEALAB II and he conducted an experiment where he lived underwater, on the ocean floor for 28 days, thus making Scott the first real SEA-DWELLER in history. Rolex decided to develop a new kind of heavy-duty stainless steel tool diving watch for such men and thus they named this new watch, the Rolex SEA-DWELLER. 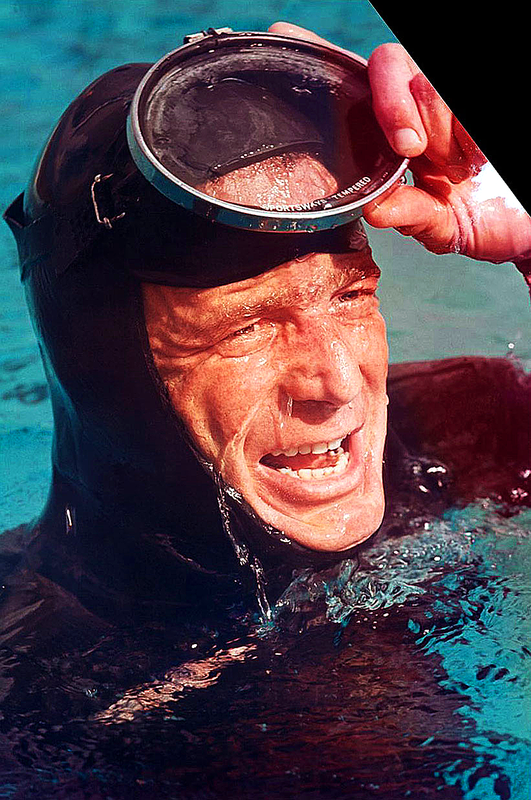 According to world-renowned Rolex expert and historian, James Dowling, Rolex worked with the U.S. Navy divers to develop the Rolex SEA-DWELLER and in my podcast interview with Scott Carpenter he confirms this fact. 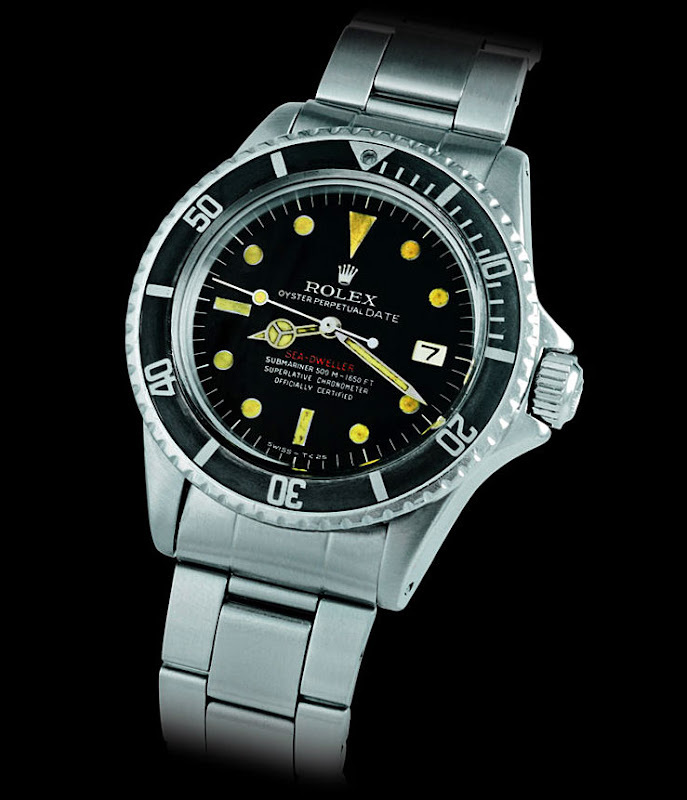 Prior the the writing of this article it was commonly believed that Rolex developed the SEA-DWELLER for COMEX, the French Diving Organization, but that appears to not be the case as James Dowling points out: "In the late 1960s Rolex worked with both COMEX and Westinghouse (the developers of SEALAB) on two different products with two different requirements." 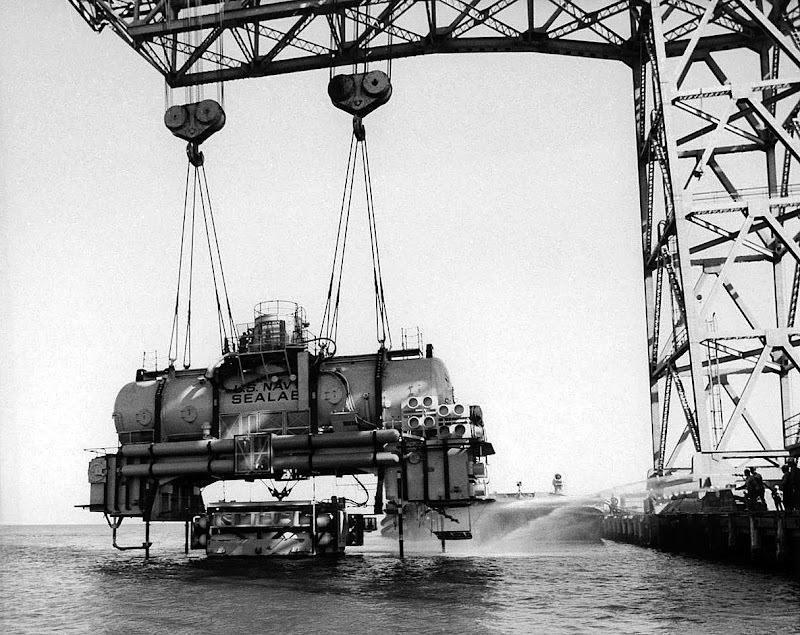 "COMEX needed a way to allow the helium to exit the watches during decompression; whilst Westinghouse needed a watch that would work at depths deeper than the 200 Meters the current Submariners were capable of." 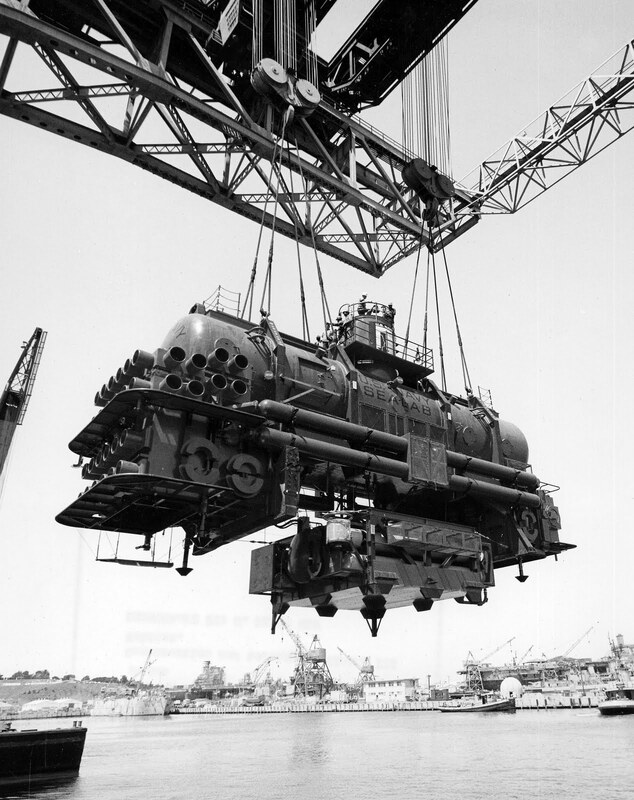 "The two different solutions were the 5513 gas escape models for COMEX and the super rare 1500 Meter non-gas escape Sea Dweller for Westinghouse (made in about 20 units). 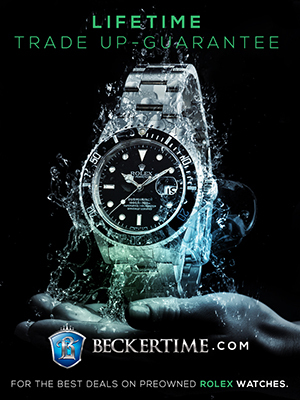 The production Sea Dweller (Rolex Reference 1665) was a combination of the two projects." "Here is one of the first fruits of that combination of the two projects." 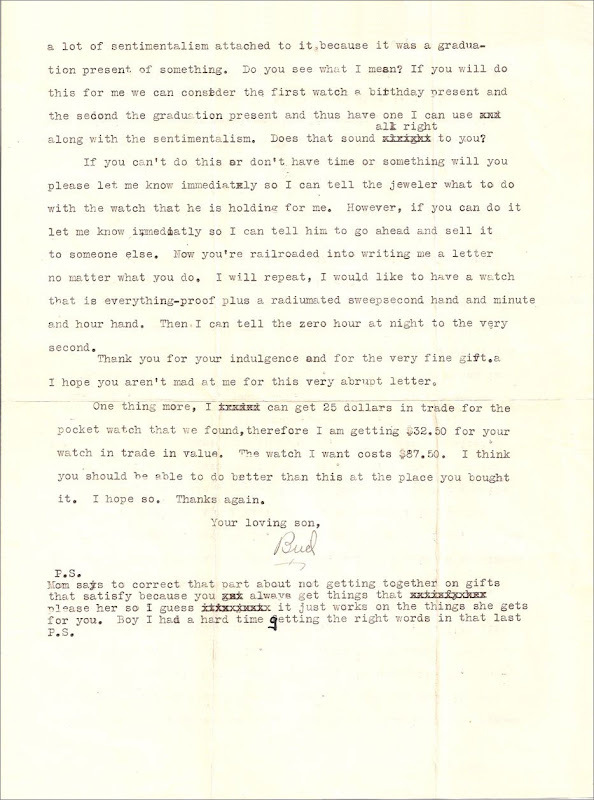 James Dowling continues: "The truth is that the Sea Dweller as it finally appeared probably owed more to the Westinghouse watch than it did to the COMEX one. 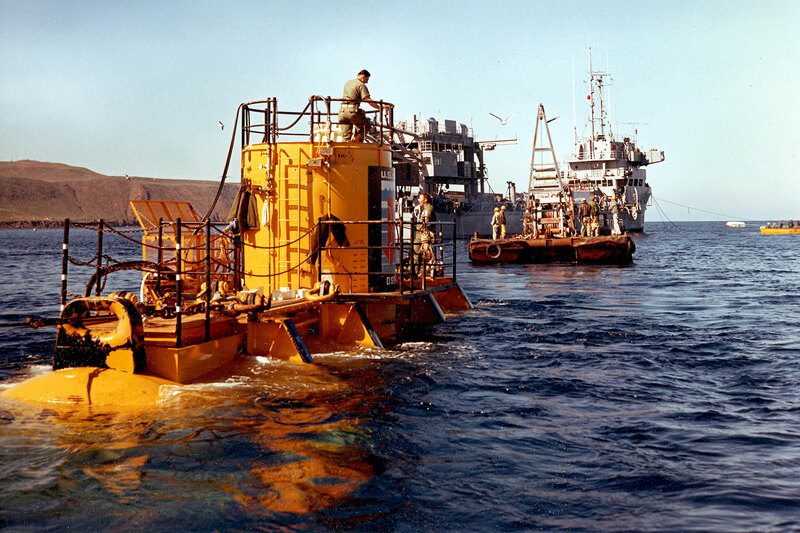 The purpose of the SEA-LAB project was to establish an underwater habitat and the plan was to establish long-term underwater living quarters. In other words 'Sea dwellings" and the occupants would be 'Sea Dwellers.'" 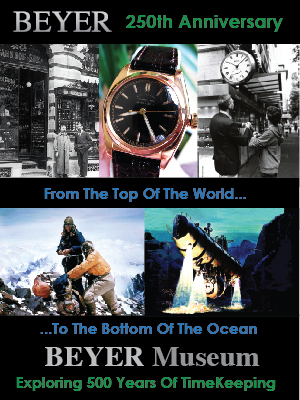 James Dowling co-authored a magnificent Rolex history book named "Rolex Wristwatches" which I reviewed. You can read the review and purchase his superb book by clicking here. The ultra-rare and historic Rolex SEA-DWELLER prototype that James Dowling mentioned appears in John Goldberger's amazing new book entitled "100 Superlative Watches." 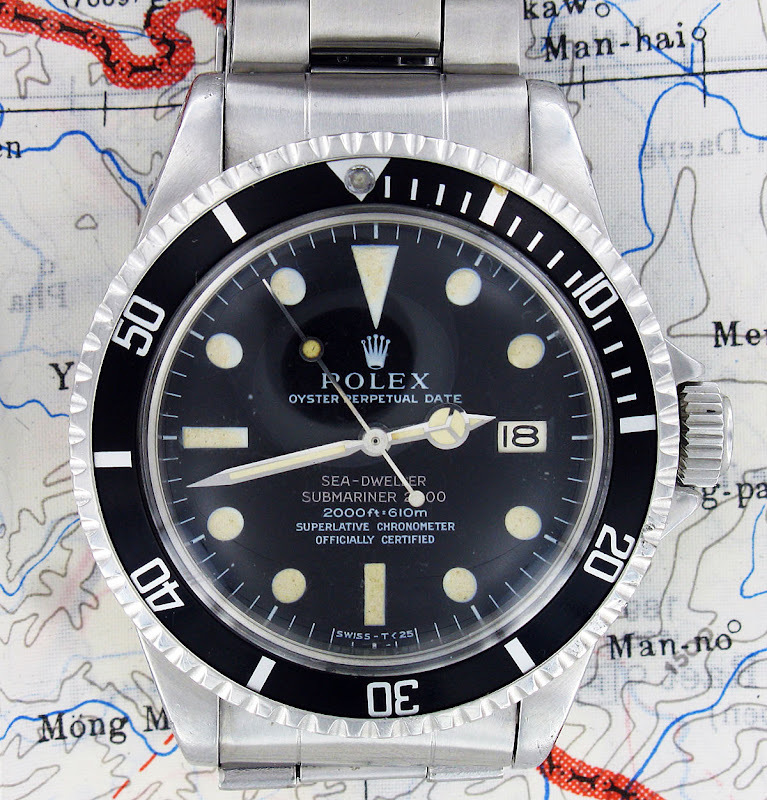 The watch James Dowling refers to as being "Super rare 1500 Meter non-gas escape Sea Dweller for Westinghouse (made in about 20 units) is pictured below. The image above is from John Goldberger's book and it appears on page 214. This watch belonged to the famous U.S. Navy Diver named Robert Palmer Bradley. Ironically "Bob Bradley" also started his career as a U.S. Navy test pilot just like Scott Carpenter. The photo below appears on page 215 of John Goldberger's excellent book and if you click on the image you will see the red SEA-DWELLER Submariner 500M~1650FT designation. I wrote an amazing review of John Goldberger's magnificent Rolex book which includes more than 90 high-resolution images form his book. You can listen to the podcast interview I recorded with John for free as well as purchase his superb Rolex book by clicking here. 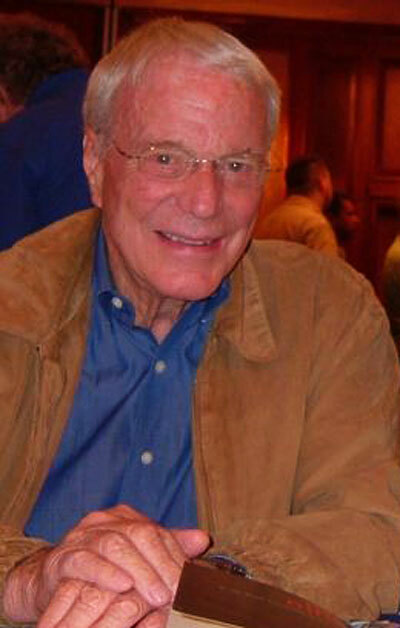 Scott Carpenter's Rolex Submariner (pictured below on his wrist) appears to be on a leather strap and Scott mentioned to me that it had an underwater thermometer on it, which you can see below. Scott also mentioned the Navy gave the Sealab Navy divers the Rolex Submariner and SEA-DWELLER watches as a gift, and Scott still has his. I can't tell if the watch Scott is wearing above and below is a Rolex Submariner or SEA-DWELLER? Since the photo above and below was taken in 1965, my best guess is that it is a Submariner. 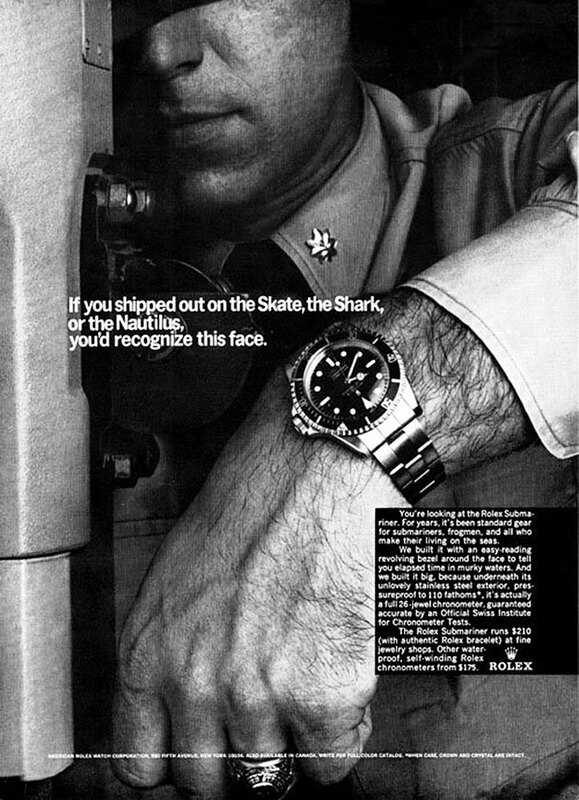 The photos below are current pictures of one of Scott Carpenter's Rolex SEA-DWELLERS. 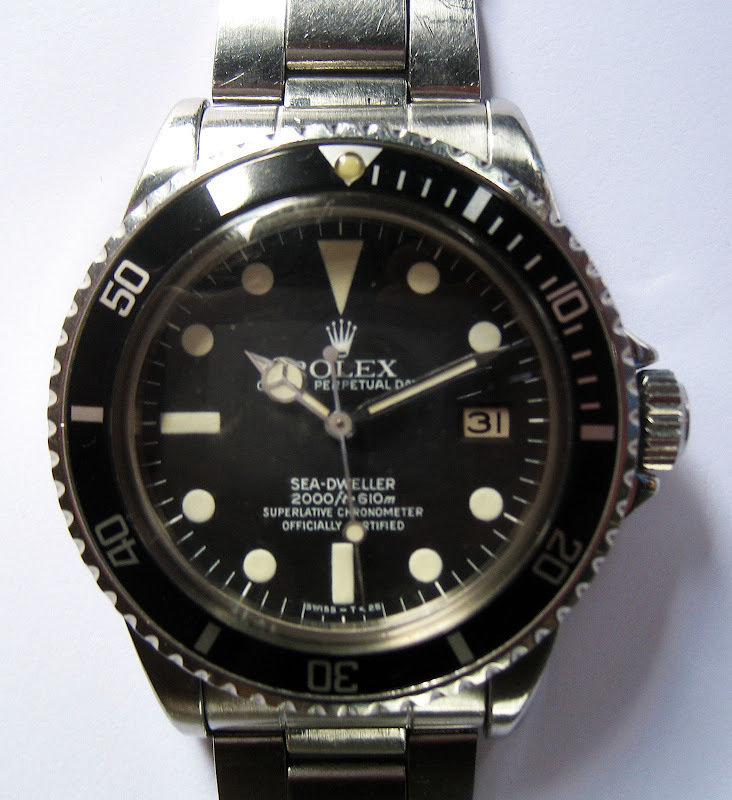 I believe it is a Rolex Reference 1665. Scott mentioned in my first interview with him he thought Rolex made the best diving watches. In the third interview, when I asked him about this he confirmed they were the best and he said, the challenge today is that they are missing a depth gauge. Scott mentioned he really enjoyed reading Jake's Rolex Watch Blog and he was amazed at how much he learned about Rolex history from reading it. I asked him if he saw the photos I put up of the new Sea-Dweller DEEPSEA and he said no. I mentioned is was 3 mm larger than the Submariner and much thicker and it was rated to be able to go down close to 12,000 feet underwater, and he laughed and said, "No human will ever go anywhere near that depth." 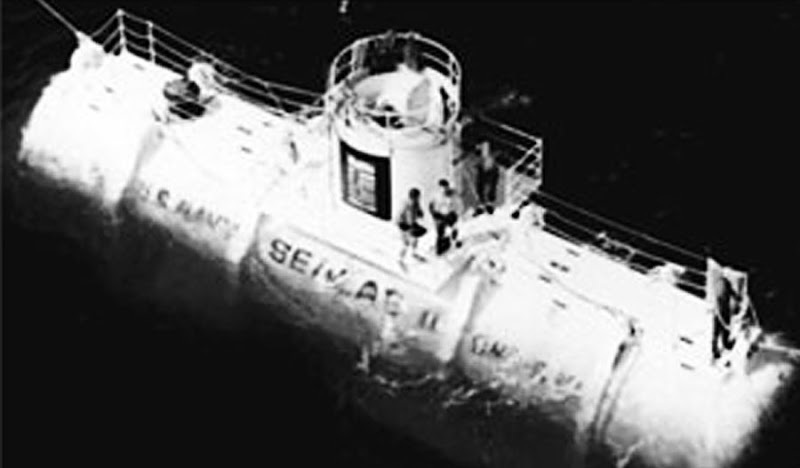 The Sealab II that Scott was stationed on is pictured below. 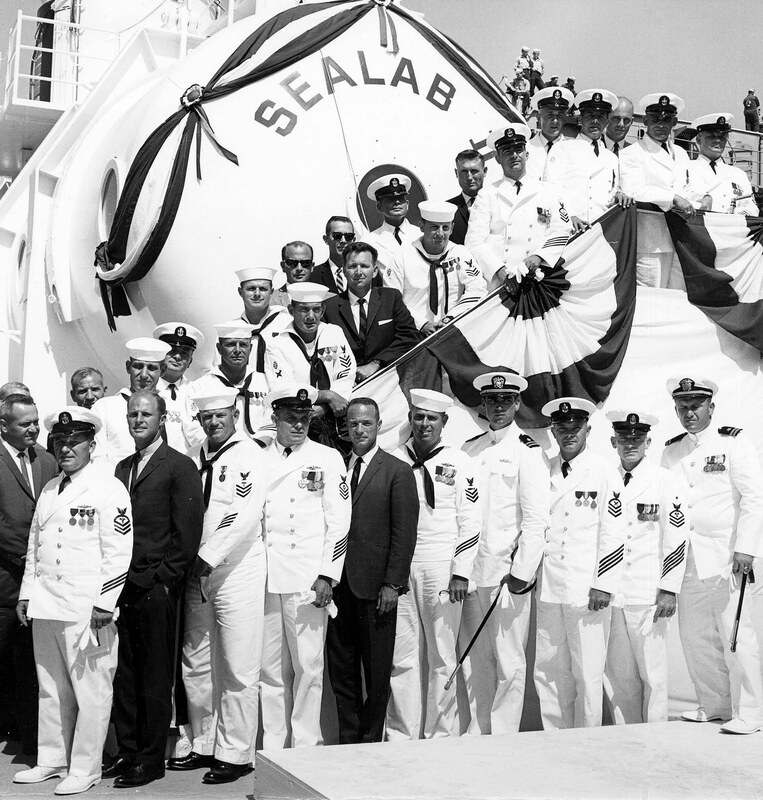 He lived on-board Sealab II for 28 days straight, which was a huge record at the time. 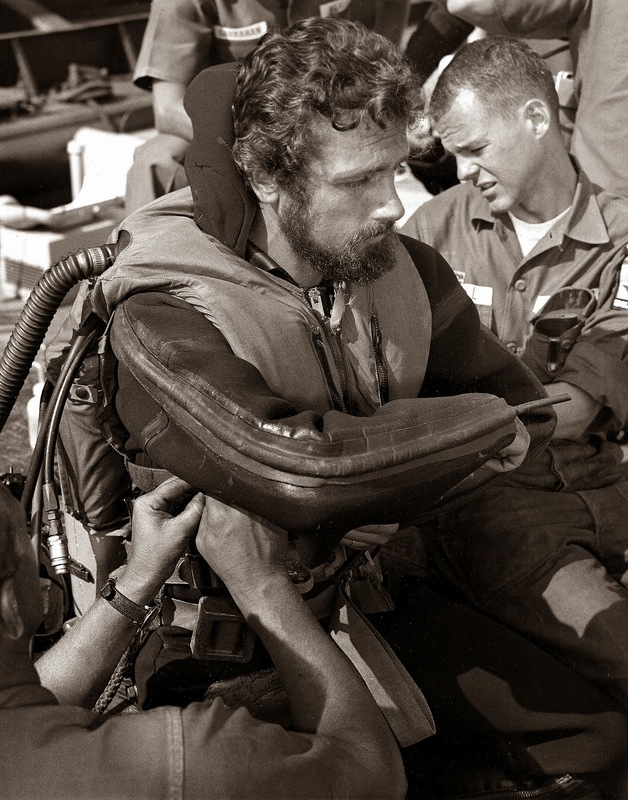 The next photo below, is of Jacques-Yves Cousteau's son, Philippe Cousteau, and it was taken while he was preparing for a dive during SEALAB III. This was something I discovered that was previously undocumented. 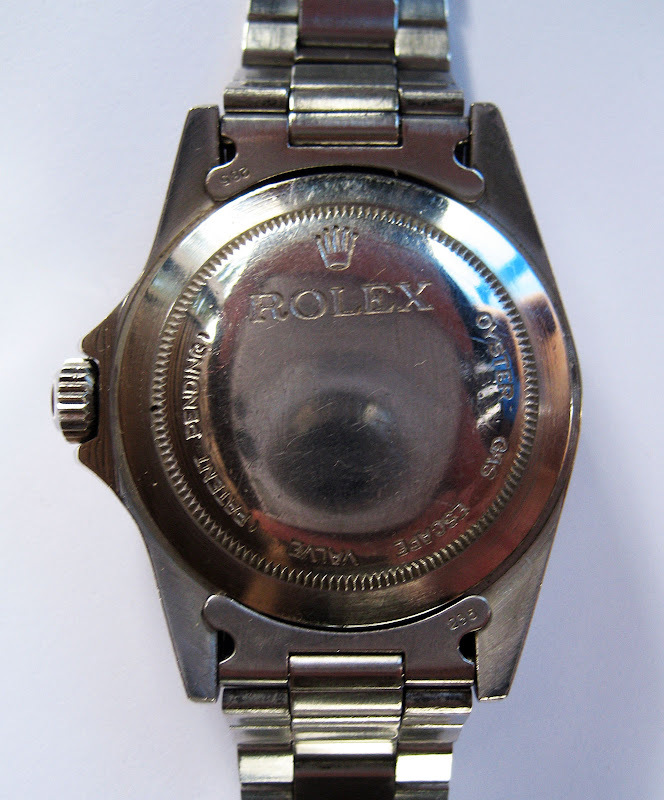 Scott Carpenter's career may solve the mystery surounding a very rare Rolex named the SPACE-DWELLER. In Rolex lore there is a story that says the Mercury astronauts toured Japan and the Japanese loved the Astronauts. Rolex began realizing the significance of having a space model watch in the heated space-race and ultimately realized the significance of the moon watch conquest. 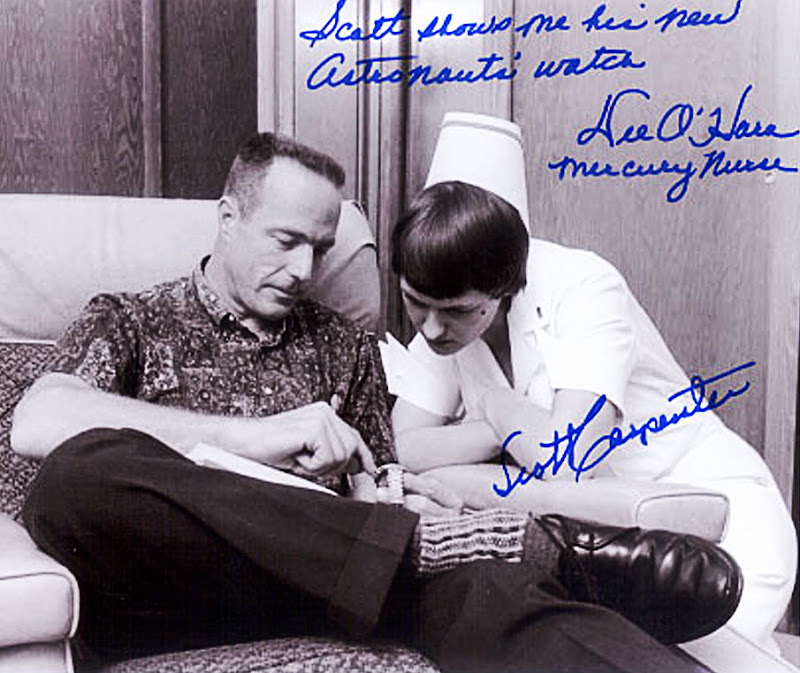 I asked Scott Carpenter if he ever toured Japan with or without the Mercury astronauts and he said no. Then I spoke with his daughter Kris and shared this story with her. 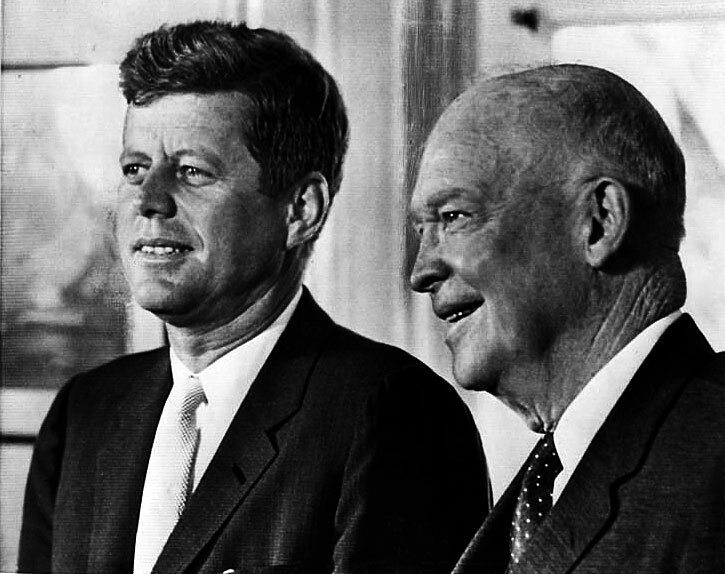 Kris said that JFK appointed John Glenn as an American Goodwill Ambassador to Japan and that John Glenn toured Japan in May 1963. 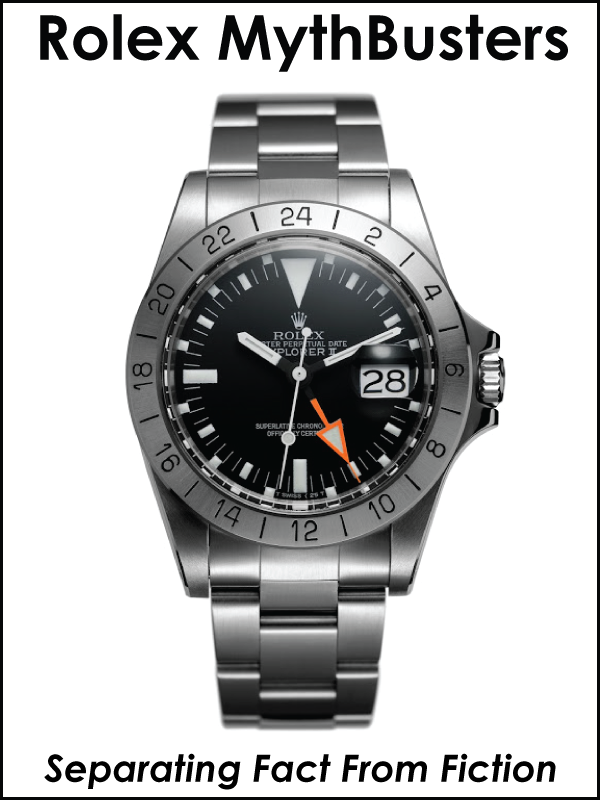 I asked James Dowling what his source was for the SPACE-DWELLER (pictured above and below) watch story and he mentioned it was told to him by a former Rolex executive for the far east. I am going to go our on a limb, but I think I figured out the mystery. I will point out that this is pure conjecture on my behalf, but it makes sense to me. I think the long-term significance of the space-race and moon watch conquest caught all of the watchmakers in the world off guard–including Rolex. 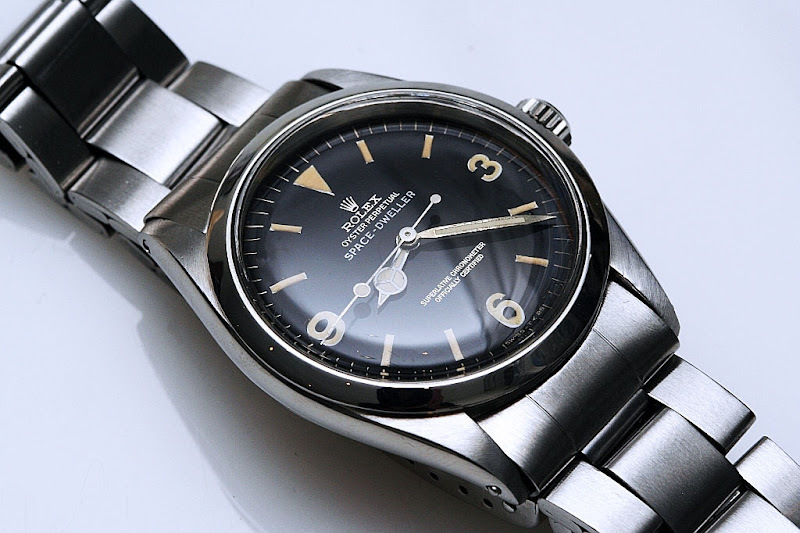 I think once Rolex started to get it in 1963, it was getting late in the game and Omega may have already been chosen by NASA to be the official space watch. 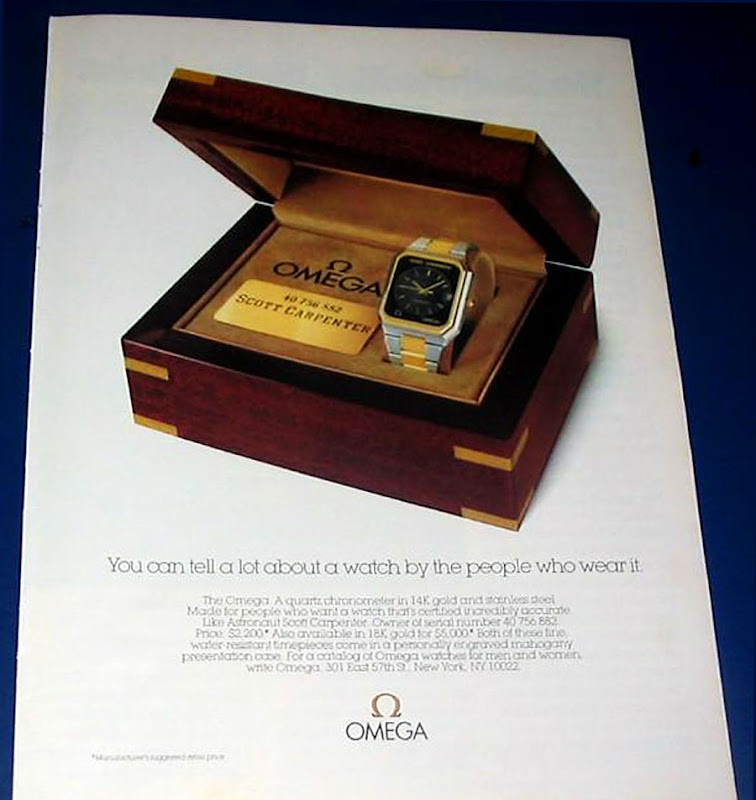 There are two stories in long circulation about how Omega was chosen over all the other brands. Apparently in 1962 NASA began to consider what watch would best suit the astronauts in the upcoming Gemini and Apollo space missions. The first story says that NASA went to a downtown Houston, Texas jewelry store named Corrigan's and bought 5 of the top watches to test and Omega was chosen because its Speedmaster tested better than any of the other brands in a contest which included the Rolex Daytona or Chronograph as well as a Longines watch. The second story says that NASA noticed many of the astronauts and test pilots wore Rolex GMT's so NASA contacted Rolex and tried to order 50 Rolex GMT Master wristwatches, but the Rolex employee told them they could not fulfill the order because they only had 8 GMT's in stock. 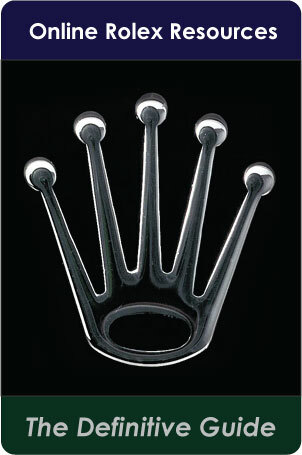 As the story goes, once the higher ups at Rolex found out about this, they severely reprimanded the employee. I don't know if either of these stories is true, but I intend to find out in the future. 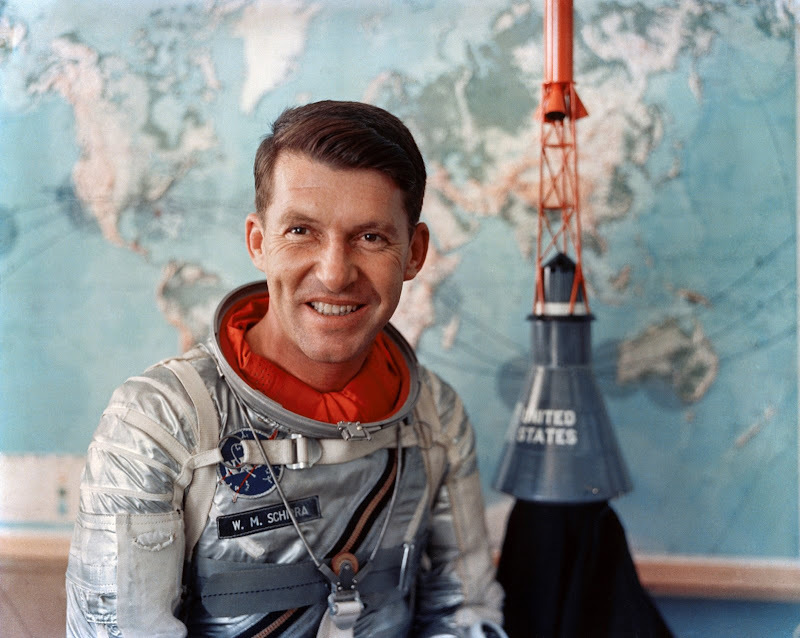 On October 3, 1962, Mercury Astronaut Wally Schirra (pictured below) wore an Omega Speedmaster on his mission aboard Sigma 7 where he orbited earth 6 times. 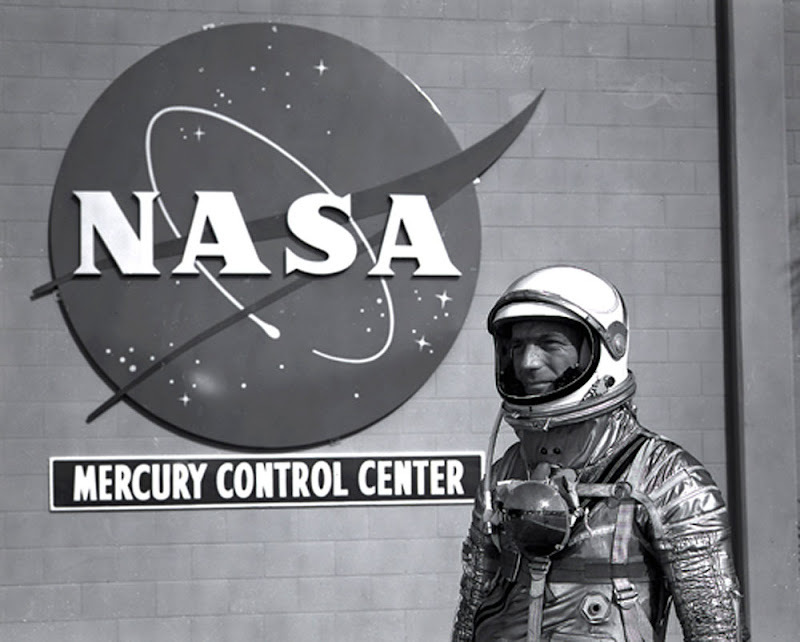 Wally who was also a former Navy test pilot like Scott Carpenter went on to become the only NASA astronaut to fly on all NASA space missions including projects Mercury, Gemini and Apollo. 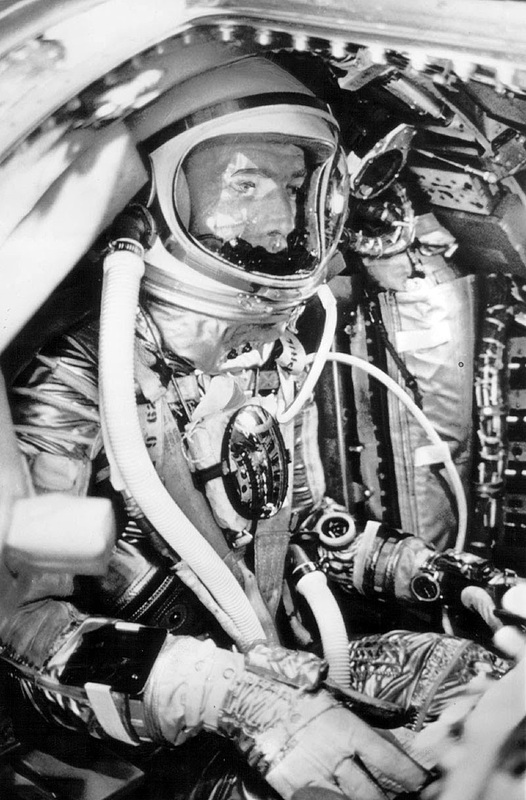 Seven months later on May 15th, 1963, Gordon Cooper flew Faith 7 around earth orbit and he wore a Bulova Accutron Astronaut which was an American watch. Scott Carpenter's daughter Kris relayed a fascinating story to me about how Gordon Cooper was sold on the Bulova Accurtron Astronaut watch and he got one for Scott Carpenter to try out. It turns out the Bulova Accutron used an electronically activated tuning fork in place of the conventional balance wheel and springs, which made it extremely precise. 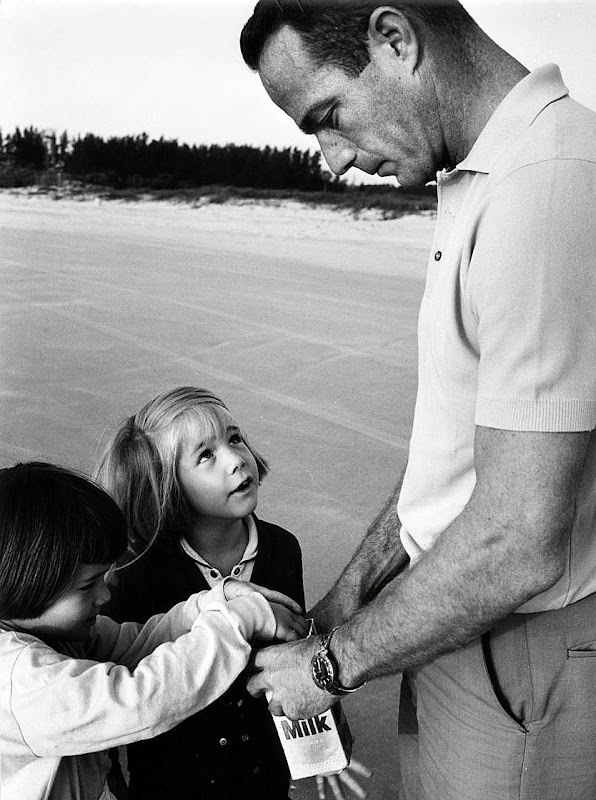 Scott is pictured below wearing his Bulova Accutron Astronaut watch on the beach with his two small daughters, Candice (Candy) and Kris. 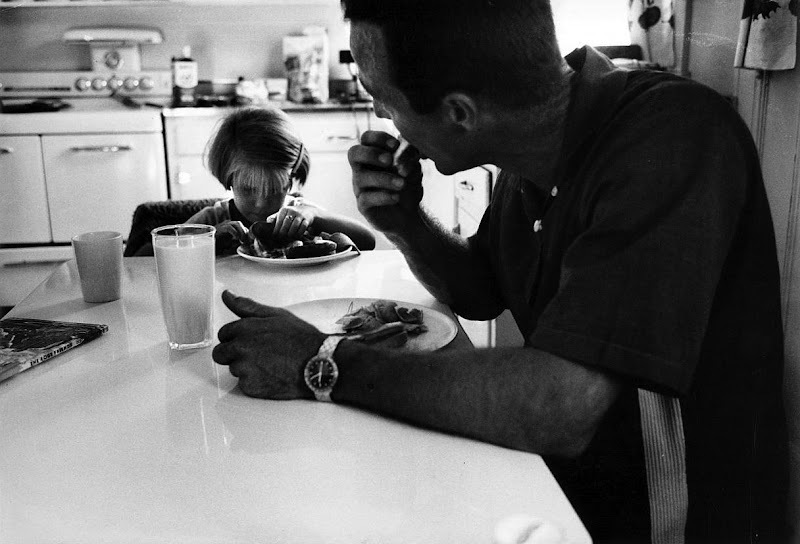 In the photo below Scott is also pictured wearing his Bulova Accutron Astronaut watch with his daughter Kris while having lunch at home. Notice the Classic Sandwich and Frito's Lunch. The challenge was that Scott Carpenter liked to sleep with his watch on and the noise generated by the tuning fork drove him crazy while he was trying to sleep. 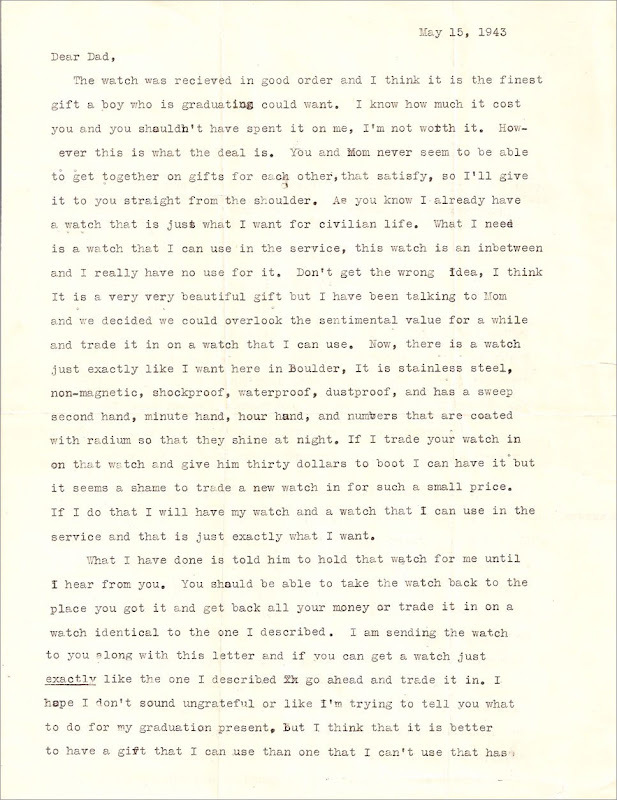 As the story goes, Gordon Cooper was frustrated with Scott Carpenter's dislike of the watch. 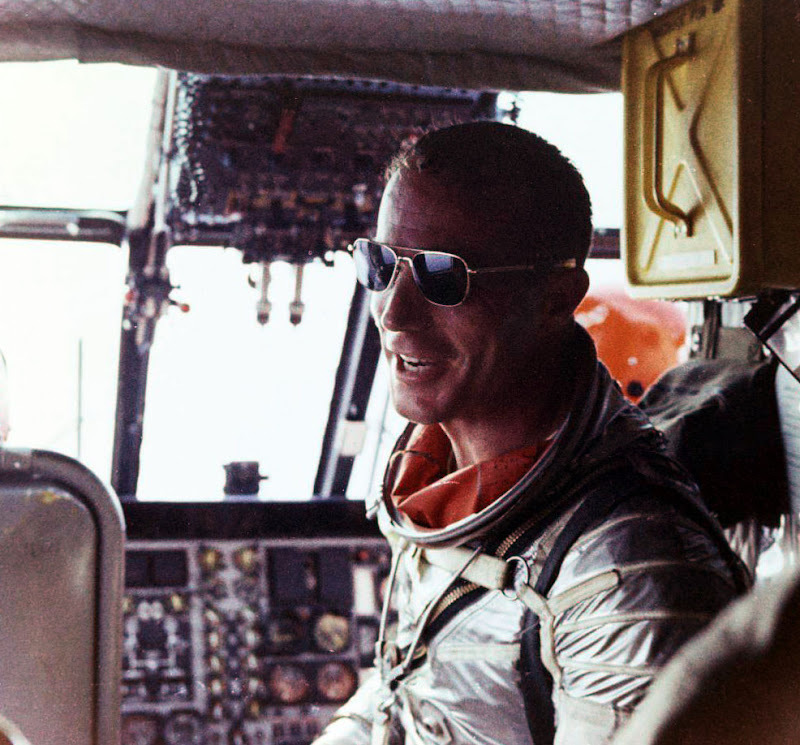 Later of course, Gordon Cooper switched over to wearing an Omega Speedmaster Professional as seen below in the photo of him taken after the Gemini 5 splashdown with Peter Conrad on August 21, 1965. Gemini 5 was an eight day, 120 orbit mission that set a new space endurance record by traveling 3,312,993 miles (5,331,745km) in 190 hours and 56 minutes which proved that Astronauts would survive in space for the length of time it would take to fly from the earth to the moon and back again. 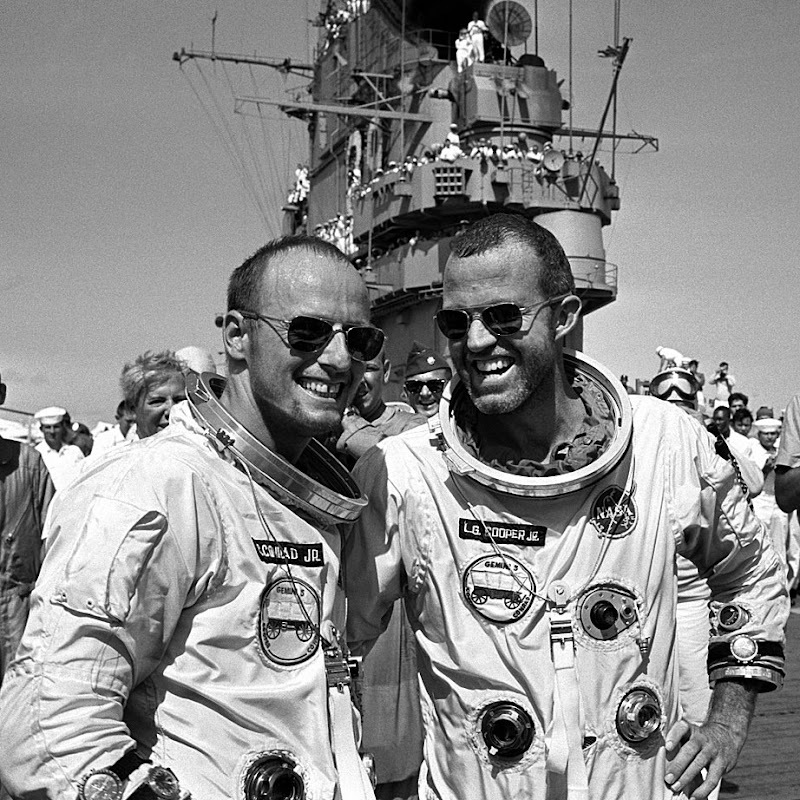 In the photo of Pete Conrad and Gordon "Gordo" Cooper you can see they are both wearing Omega Speedmaster watches outside their space-suits on their forearm. On September 21, 1964, Donald "Deke" Slayton who at the time had been appointed Director of Flight Crew Operations for NASA issued a formal certification that Appointed the Omega Speedmaster as the official chronograph for NASA space flight. From this point forward, Omega Speedmaster's became standard issue for NASA. Donald "Deke" Slayton was the only NASA Mercury astronaut that did not fly during project Mercury. 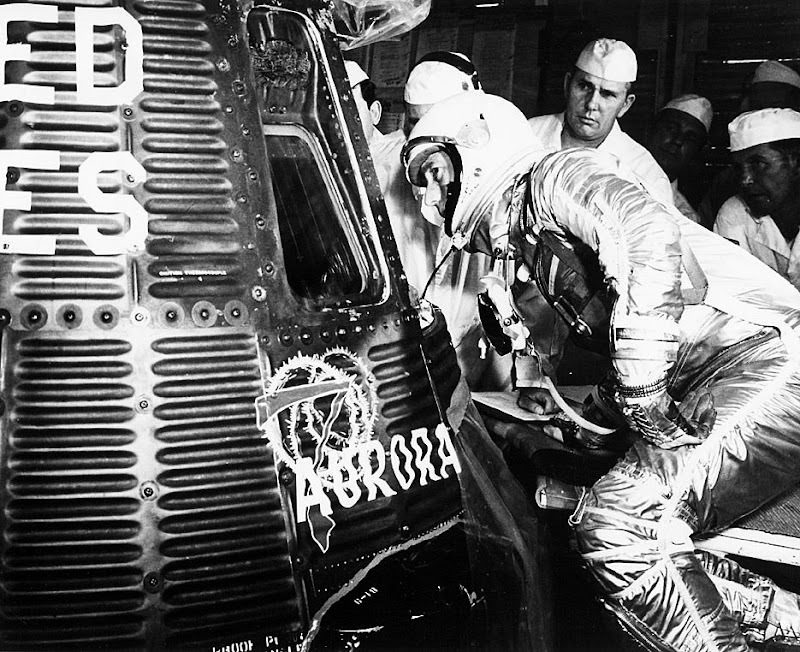 He was supposed to fly after John Glenn but he got grounded for a heart condition and Scott Carpenter took his place. 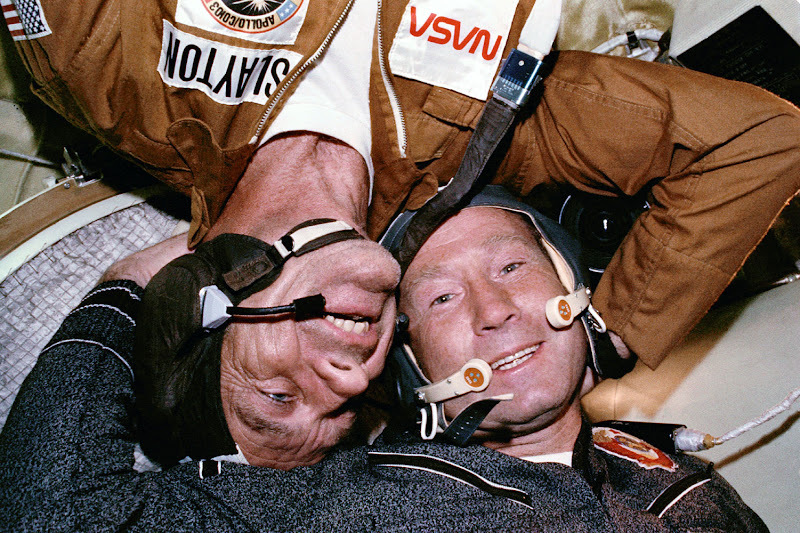 Slayton went on to fly in the Apollo-Soyuz Test project mission which docked on July 17, 1975 with a Soviet Soyuz spacecraft and in the photo below, you see "Deke" Slayton (upside-down) embracing Alexey Lenov in the Russian Soyuz spacecraft. 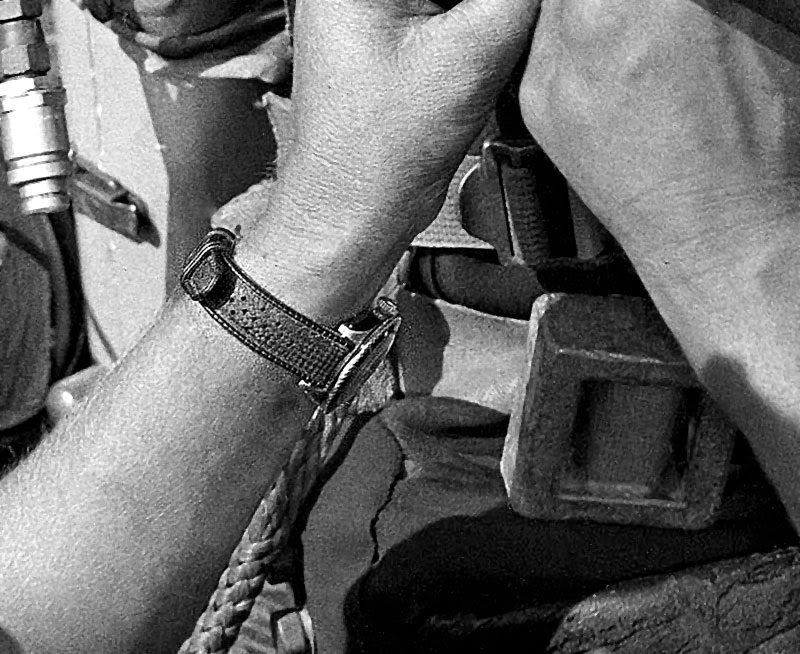 It was commonly believed that Omega was the only watch that flew to the Moon and was the only watch every worn on the moon, but in articles I have written I unearthed photographic evidence that many of the Gemini and Apollo astronauts wore Rolex GMT's. I included links to all these stories a few pages up in this story. Back to my conjecture about the relationship between the Rolex SPACE-DWELLER and Rolex SEA-DWELLER. My best guess is that in September of 1964, after Omega had been chosen by NASA, Rolex realized they would not be able to dominate in the Space/Moon watch category, so they switched their focus to dominating in the underwater arena, and thus they came out with the Rolex SEA-DWELLER. 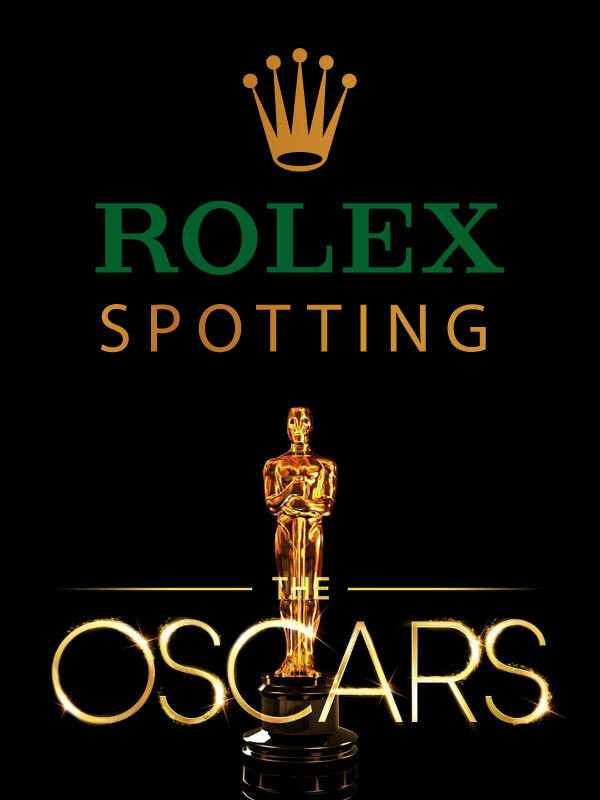 Rolex SEA-DWELLER and Rolex SPACE-DWELLER are so similar in strategic marketing and design language if you think about it. 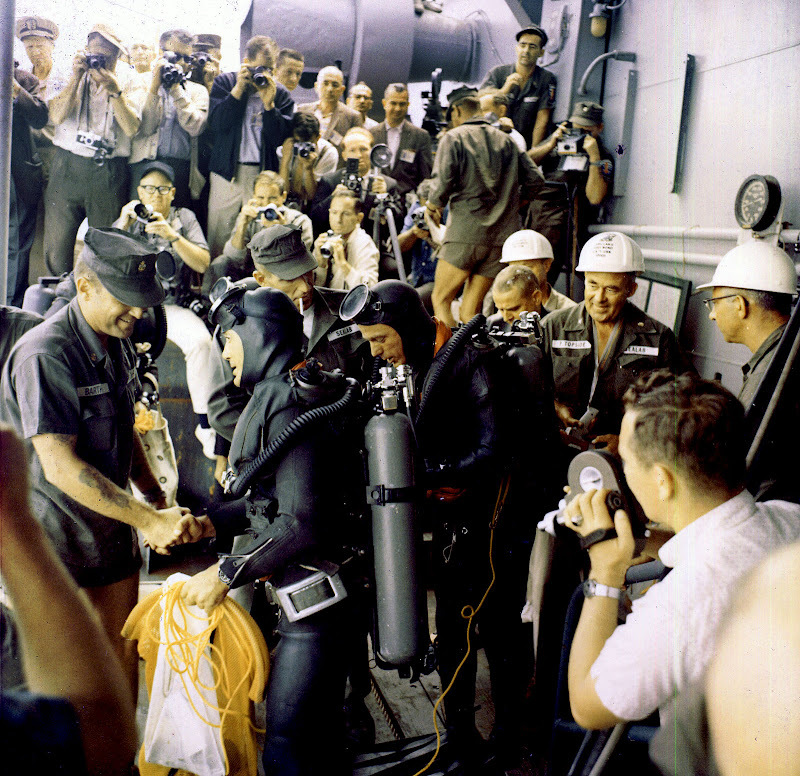 It is important to understand Jacques Cousteau only invented open-circuit scuba diving technology in the 1943. 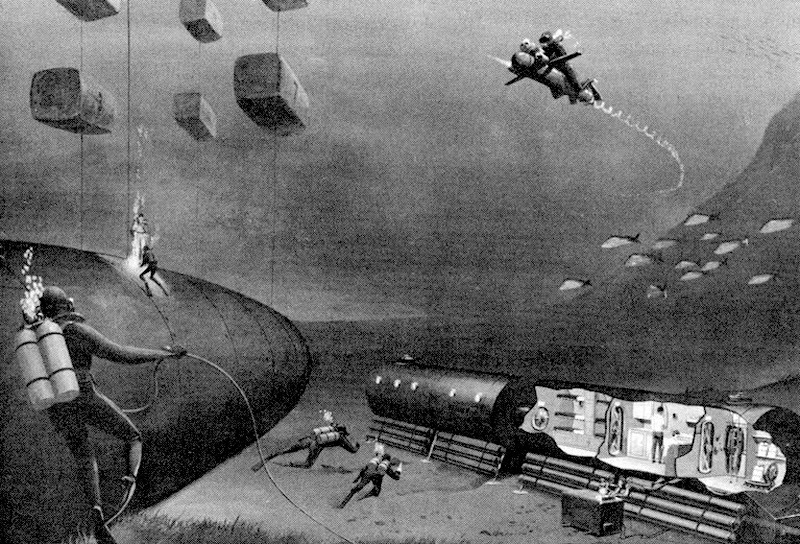 In other words, men dwelling on the bottom of the ocean floor in scuba gear only became commercially possible around the time space race got underway. This was because, in order to live as a saturated diver on the ocean floor, you needed to have an underwater pressurized habitat to come back to live in when you were not scuba diving in the ocean. Mankind's conquest of sea dwelling and space dwelling essentially occurred at the same time. Since Rolex apparently developed the Rolex SEA-DWELLER for SEA-LAB this suddenly starts to make sense. In my mind, Scott Carpenter is the living manifestation of the explorer that epitomizes the essence of Rolex. A rugged explorer, a pioneer, a risk taker, a dream-maker–a man of extraordinary achievement willing to push the envelope and experiment. A man who went higher and faster than any other up into the heaven's and dwelled deeper on the ocean floor than any man before him. To use a line from Star Trek, "To boldly go where no man has gone before." 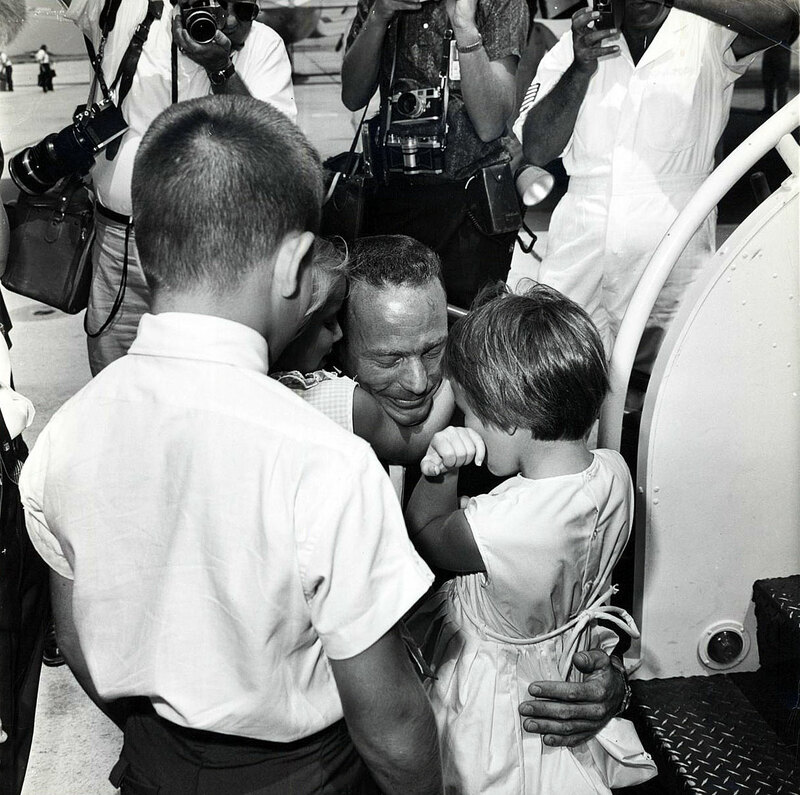 Scott Carpenter has lived a magnificent life–magnificently. In the fascinating photo below Scott Carpenter is curiously looking through an Astro Globe in the Aeromedical Lab at Cape Canaveral. 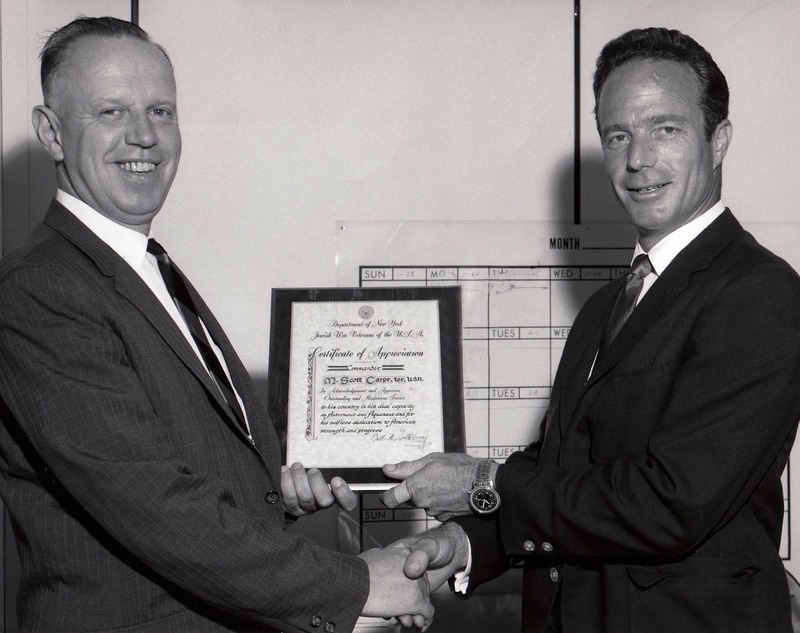 Scott Carpenter has remained very active over the years and is seen below with Vice President Gore in a NASA educational forum. Scott is 83 years young today and lives a full life with his lovely wife and family. 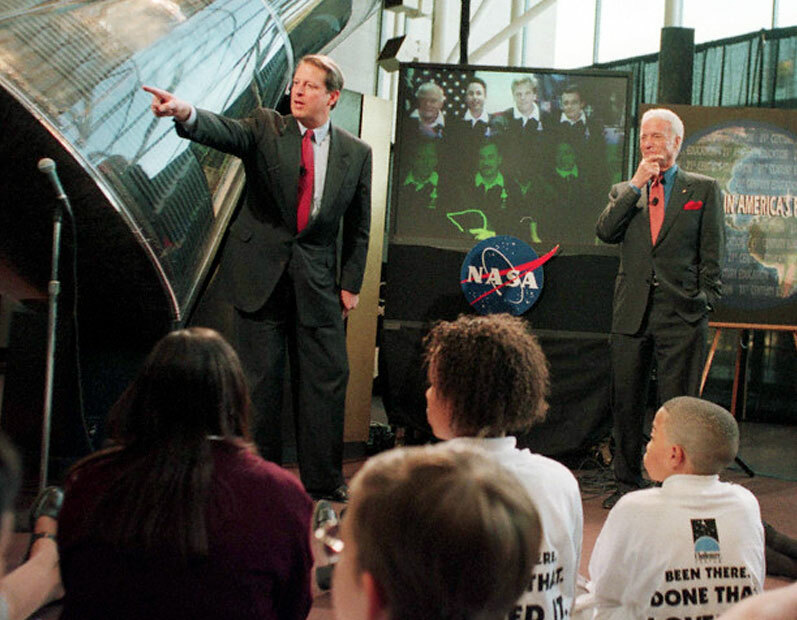 NASA has a great article about Scott's career you can view by clicking here.